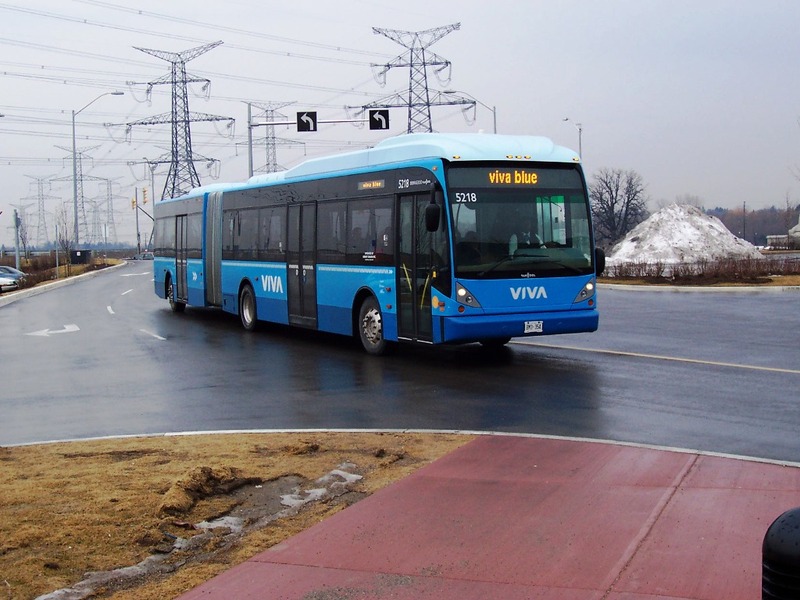 A Van Hool single articulated bus with North American specifications north of Toronto, Canada. 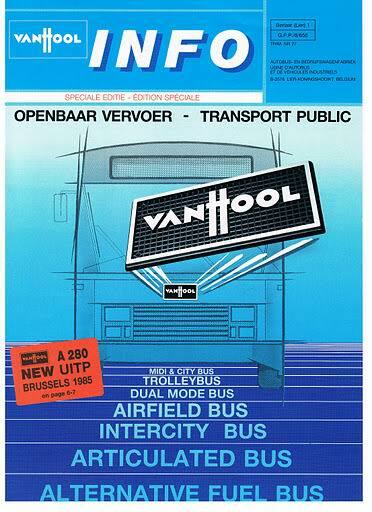 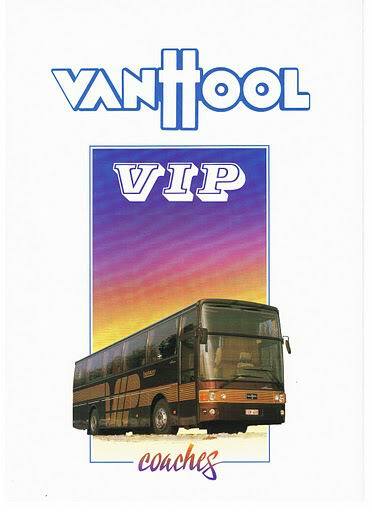 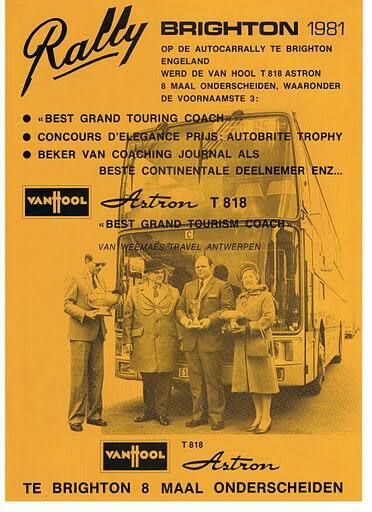 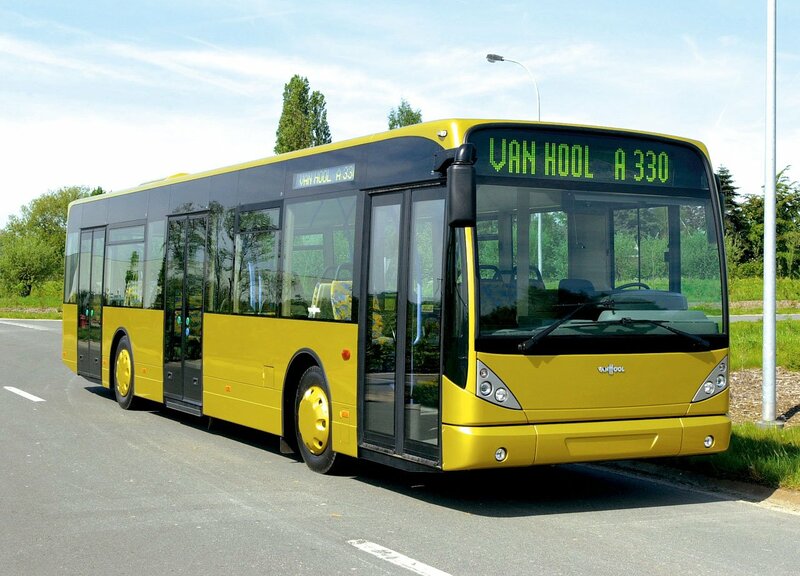 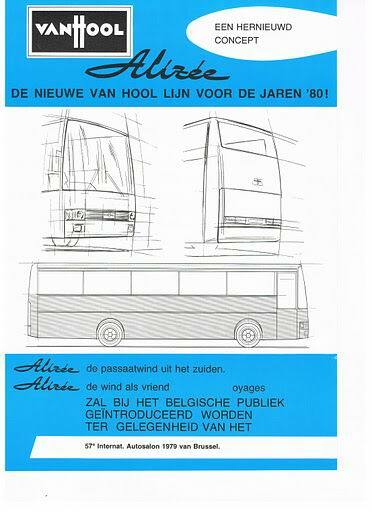 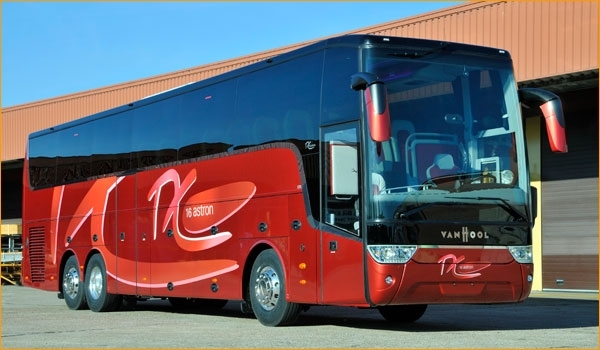 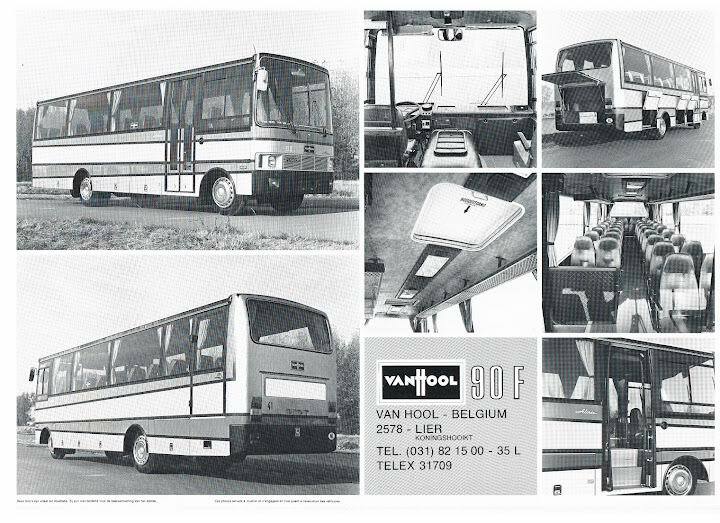 Van Hool NV is a Belgian family-owned coachbuilder and manufacturer of buses, coaches, trolleybuses, and trailers. 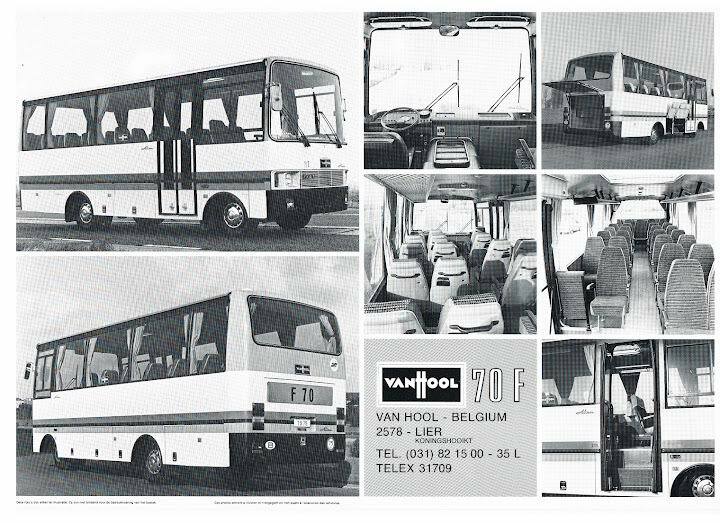 The company was founded in 1947 by Bernard Van Hool in Koningshooikt, near to Lier, Belgium. 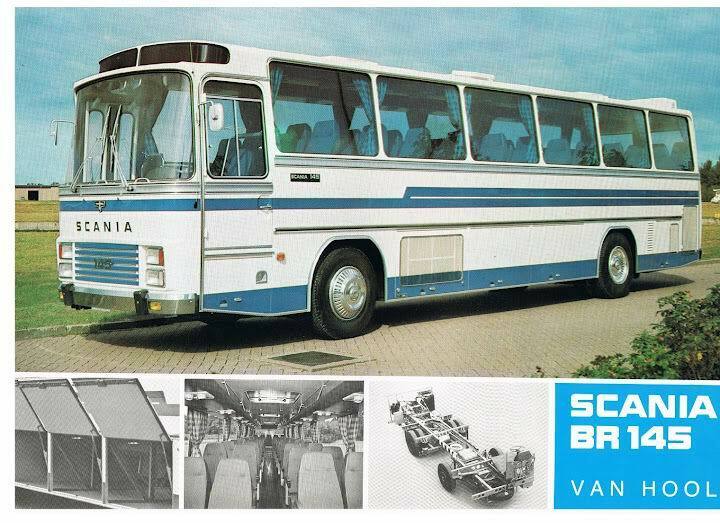 In the early years, the company introduced serial production and exported their products all over Europe. 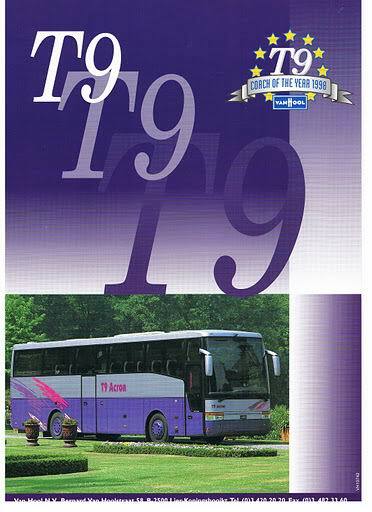 Since the mid-1980s, the company has also been active on the North American market, where it has become an important player. 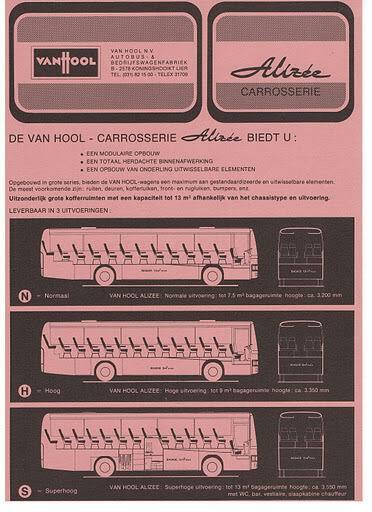 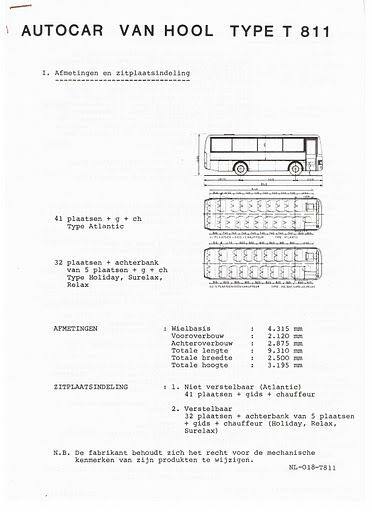 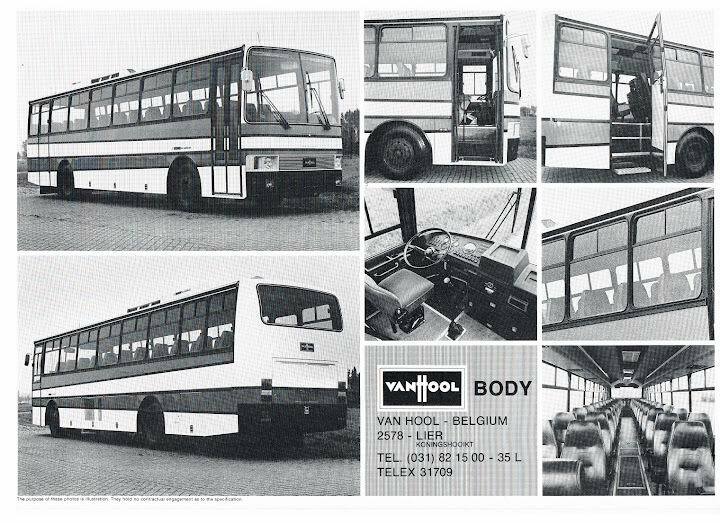 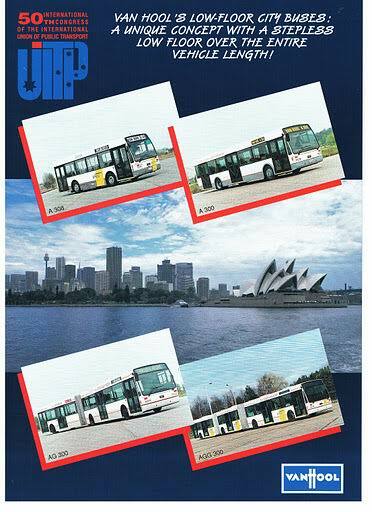 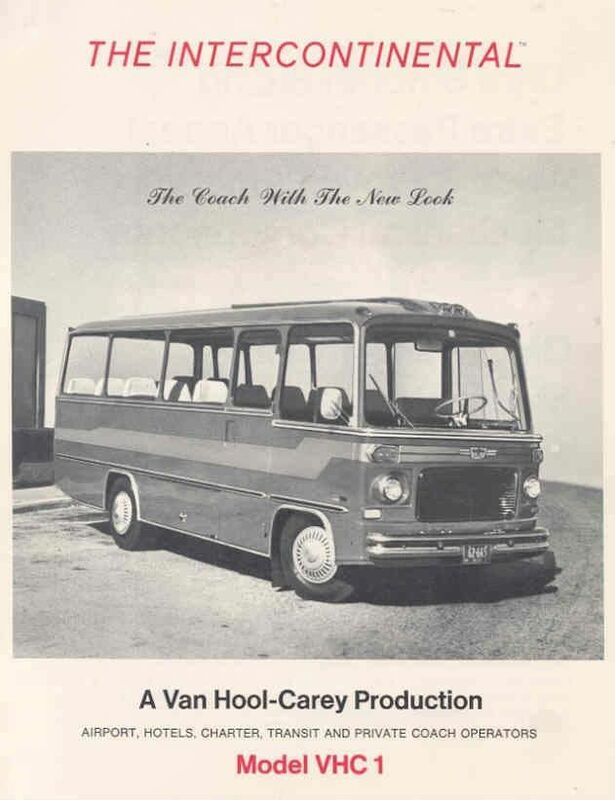 On February 15, 1957, Van Hool signed a commercial agreement with Fiat; Van Hool would incorporate Fiat engines and other mechanical components (gearboxes, axles, steering) in its vehicles. 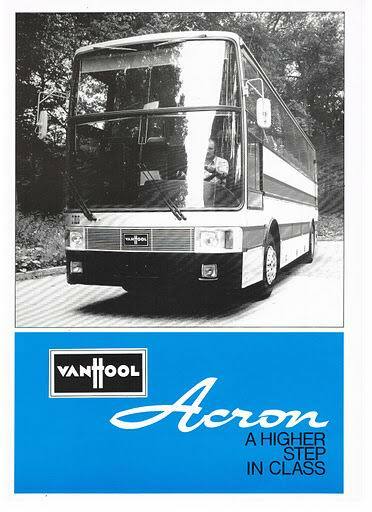 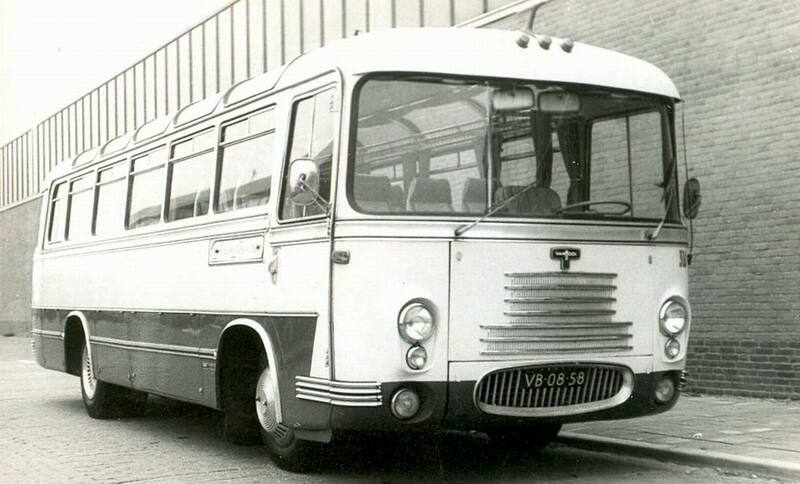 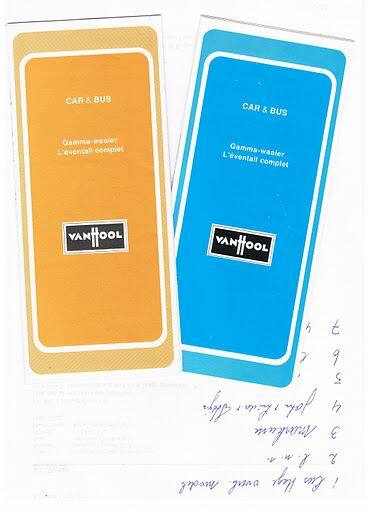 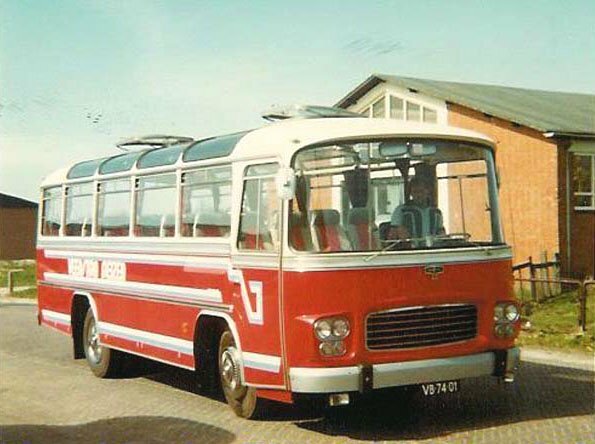 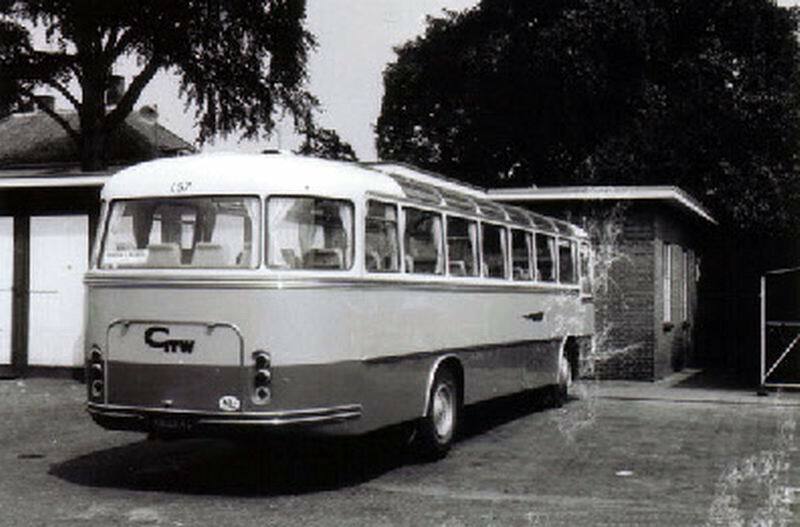 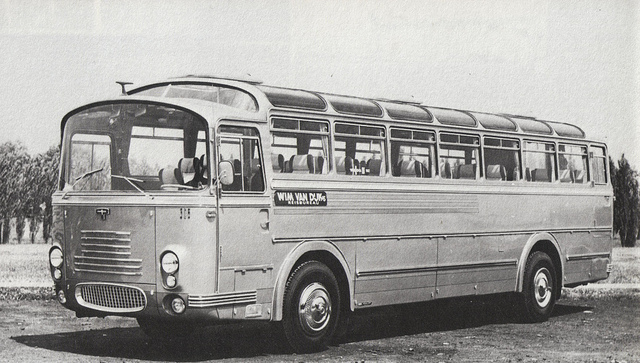 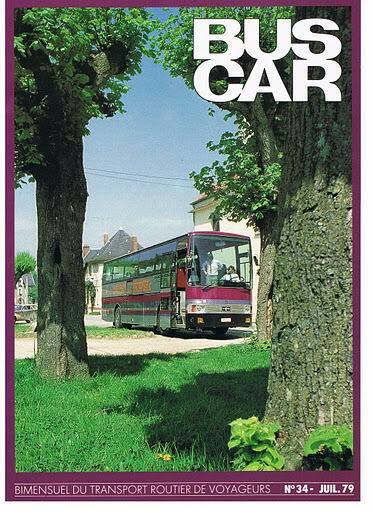 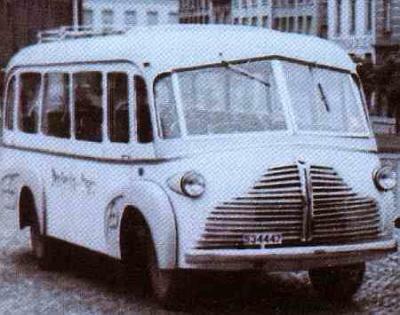 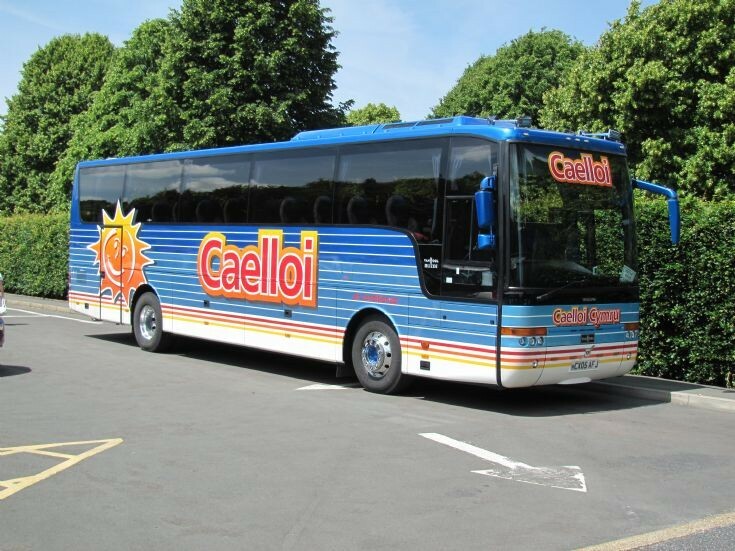 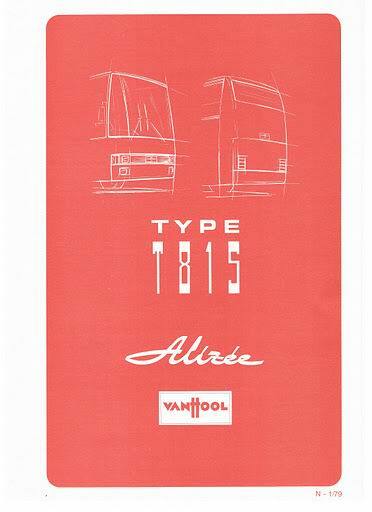 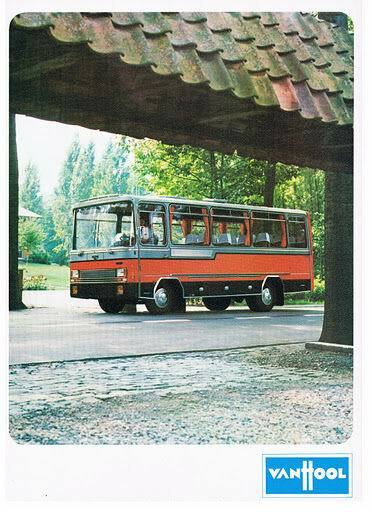 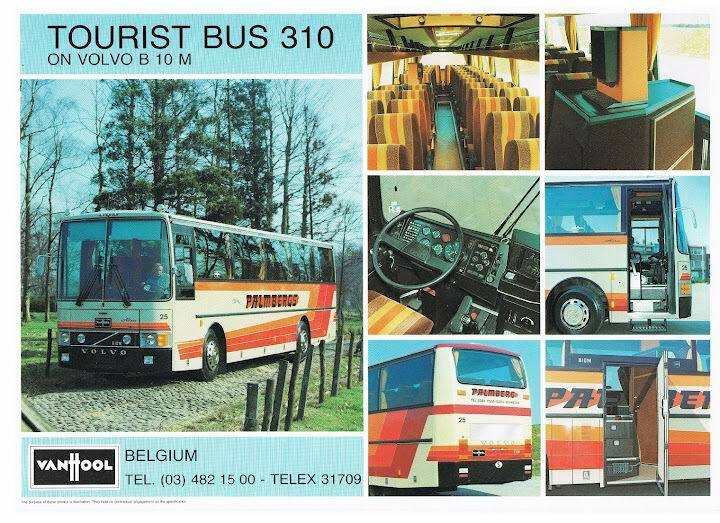 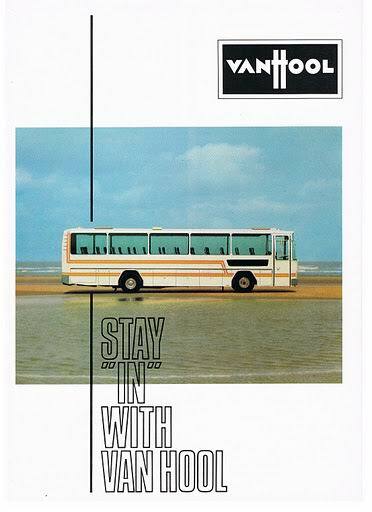 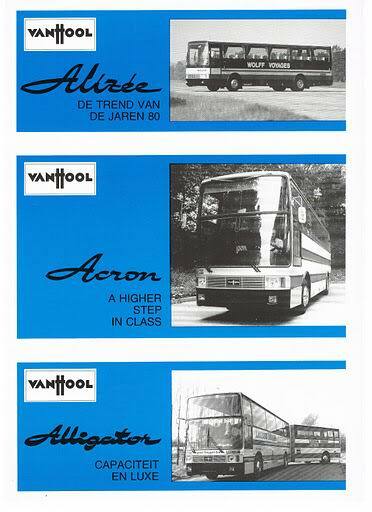 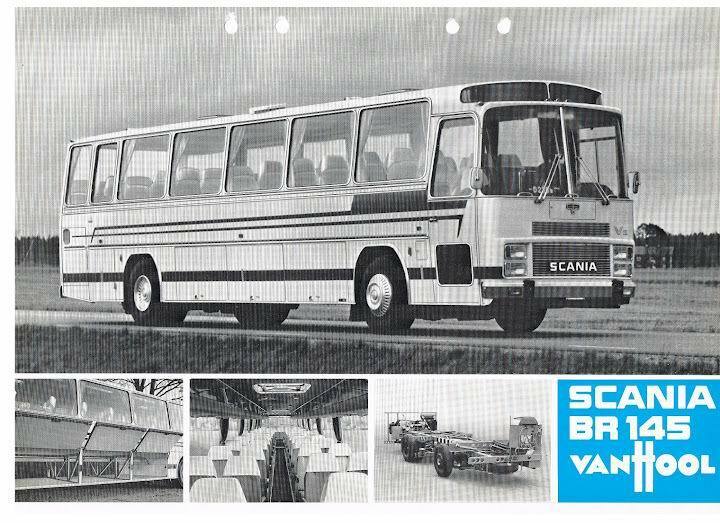 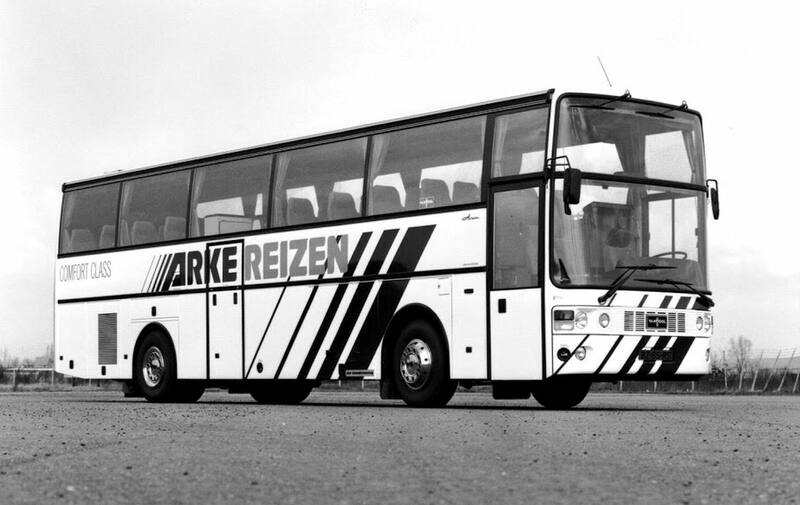 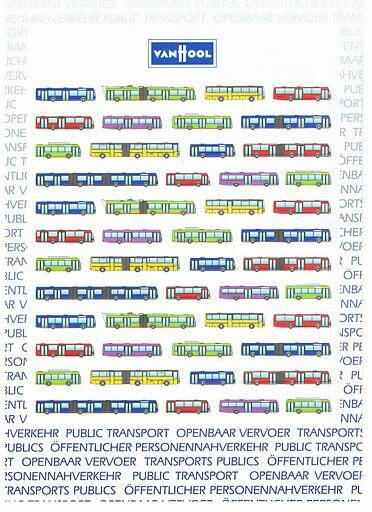 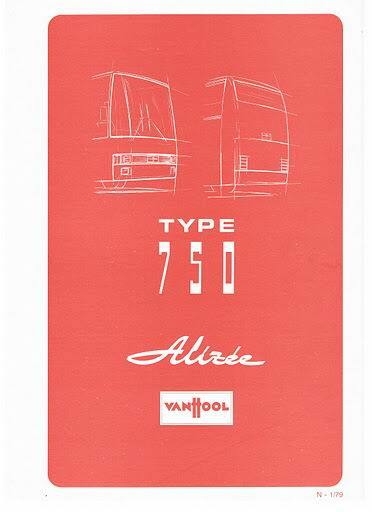 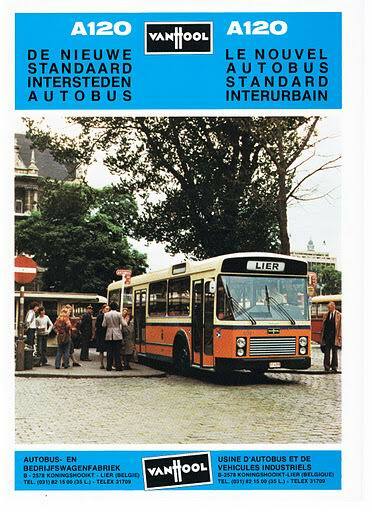 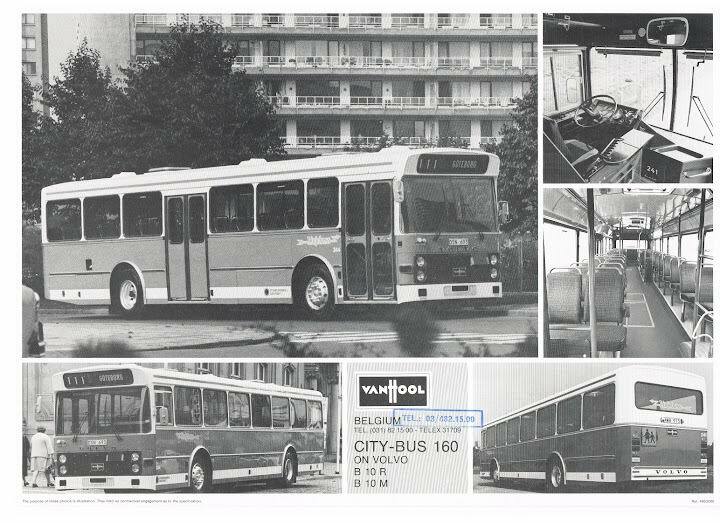 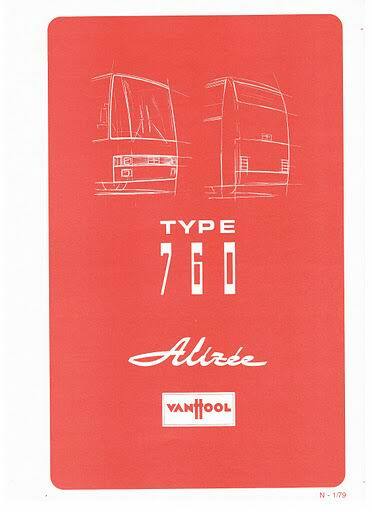 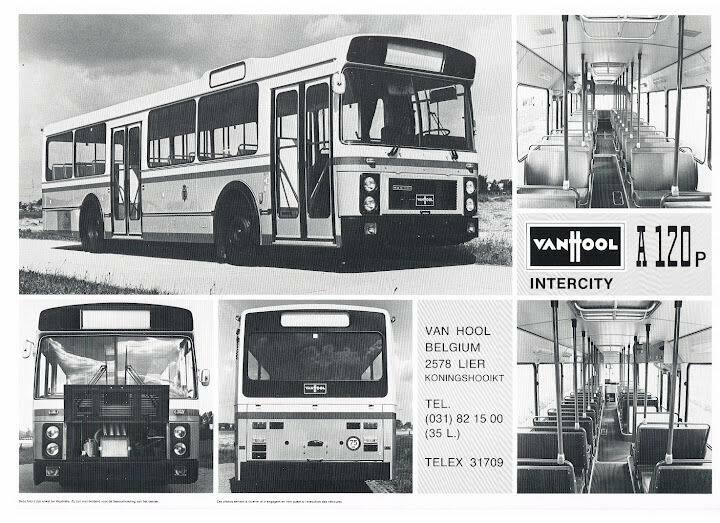 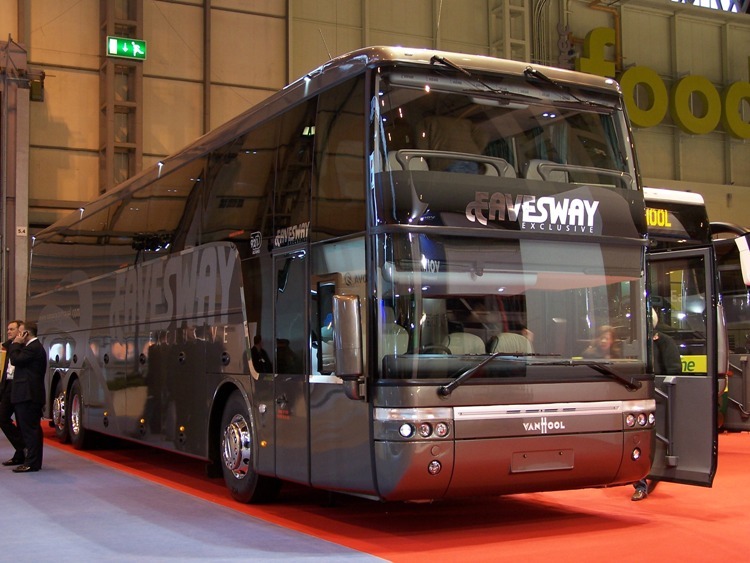 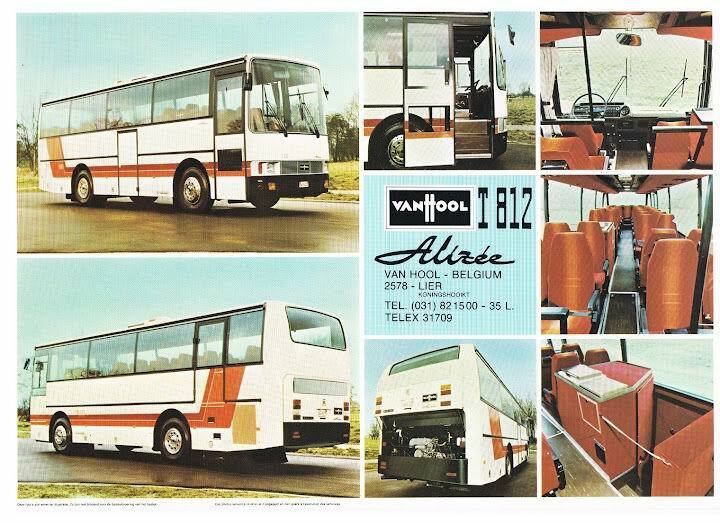 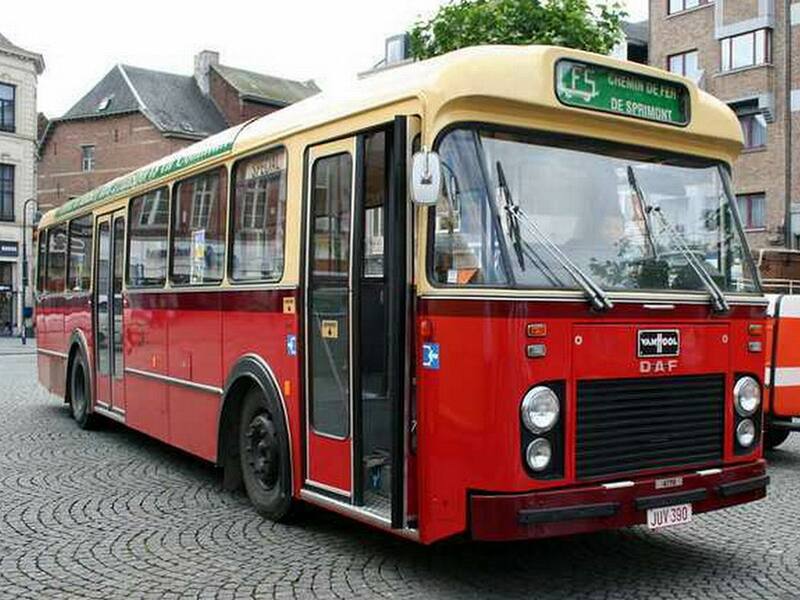 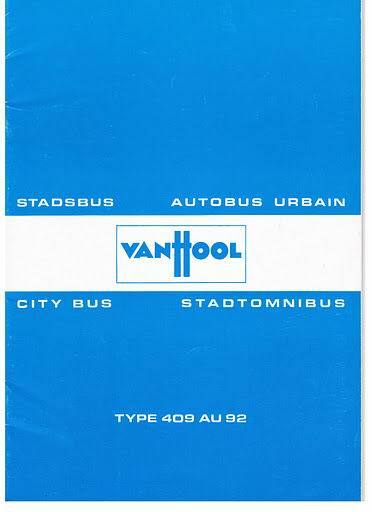 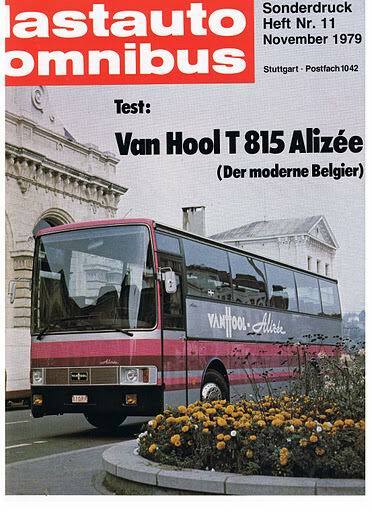 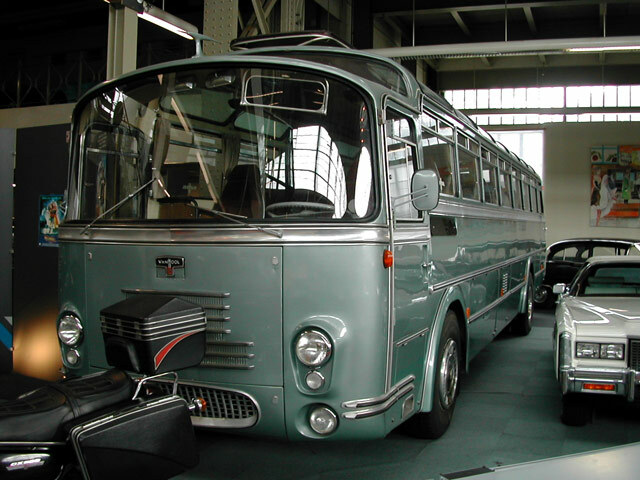 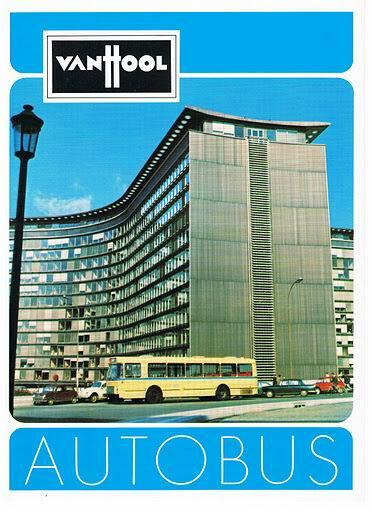 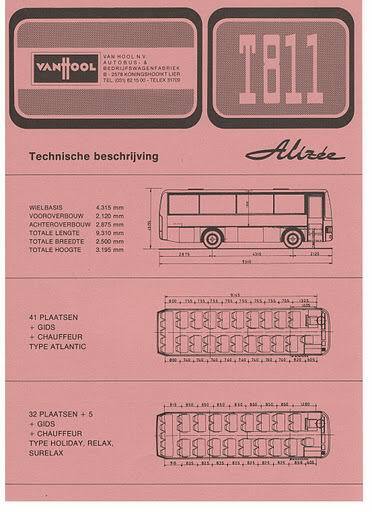 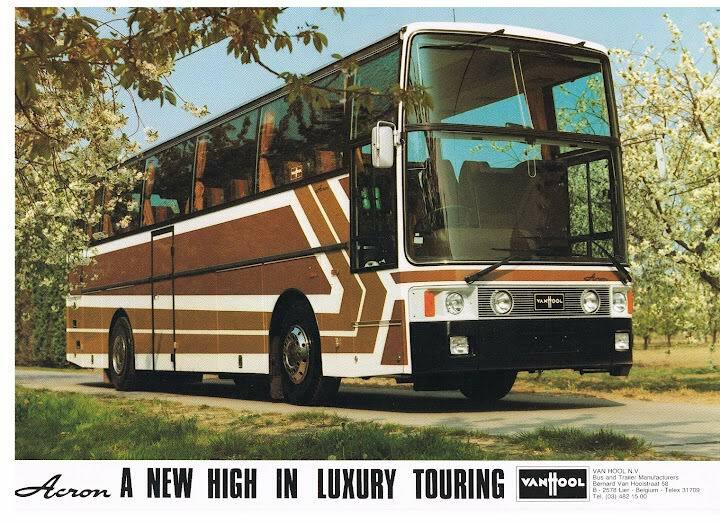 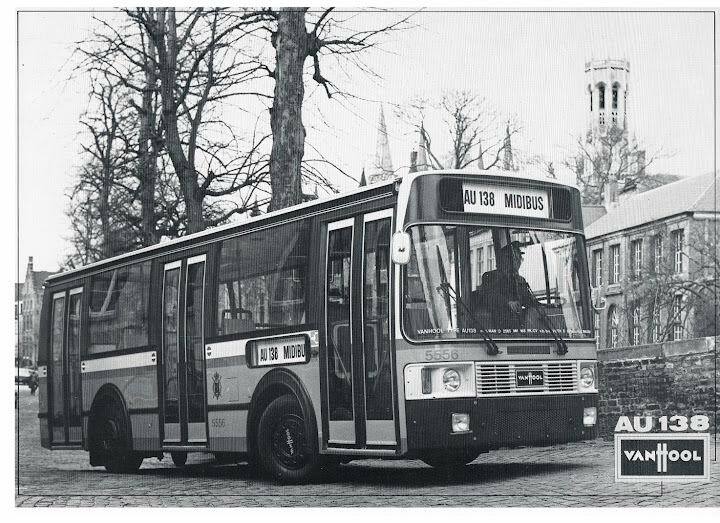 It developed from a coachbuilder to a Belgian manufacturer of integral buses and coaches, known as Van Hool-Fiat. 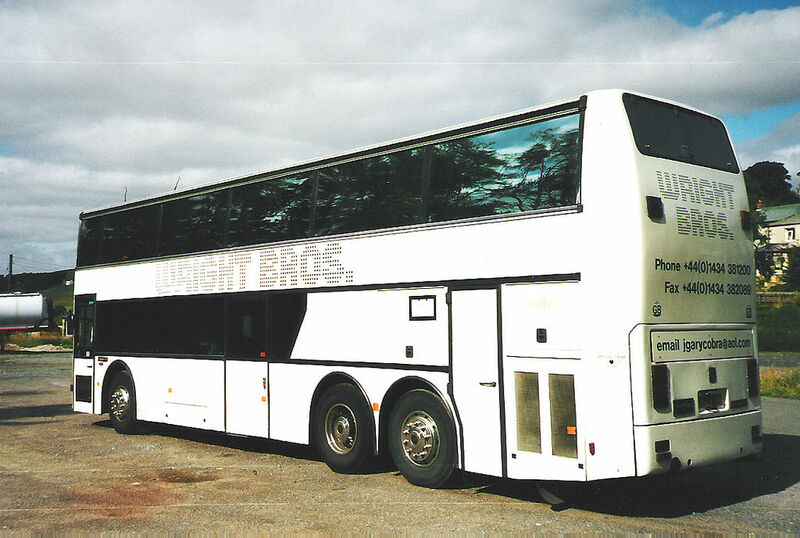 Alongside these activities, the company continued as a renowned coachbuilder, enabling further expansion. 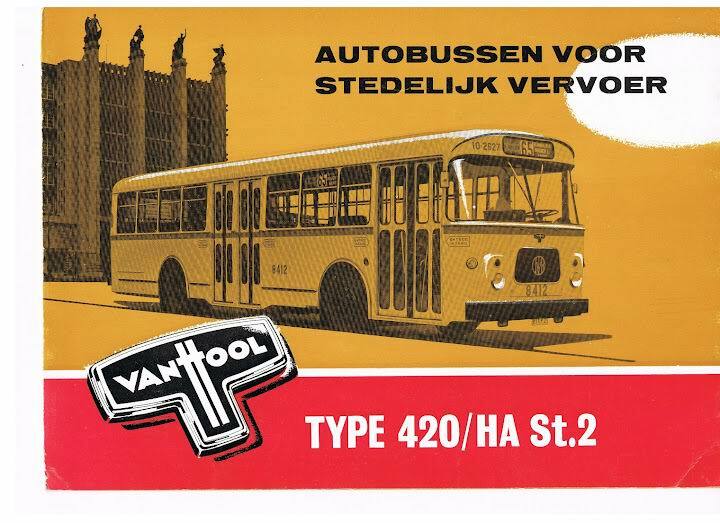 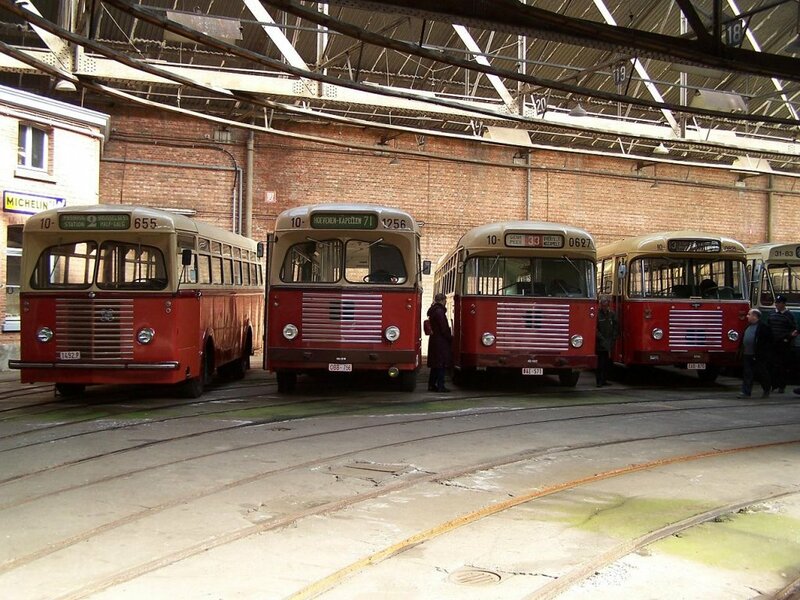 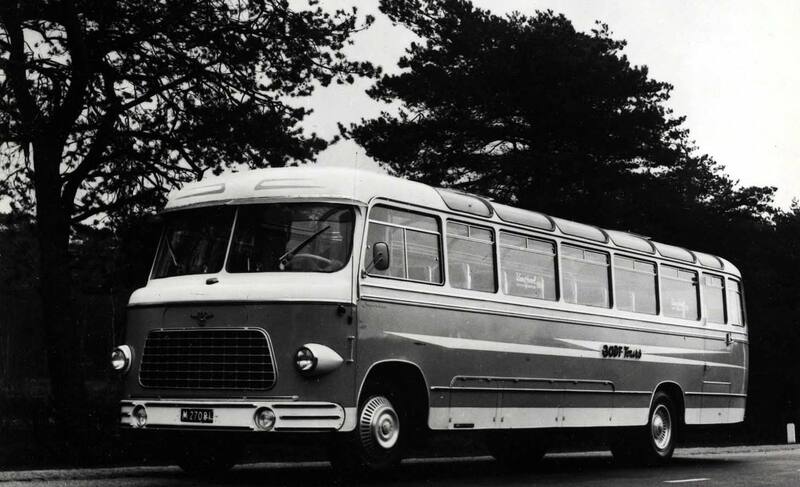 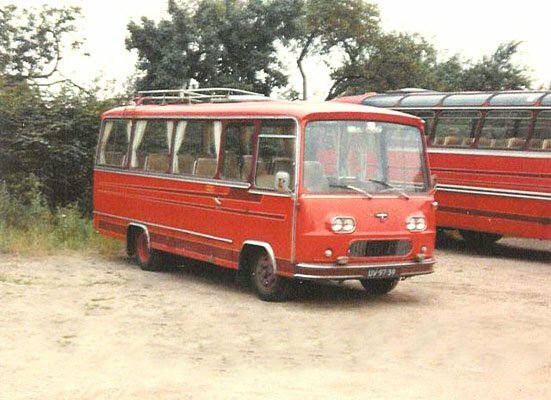 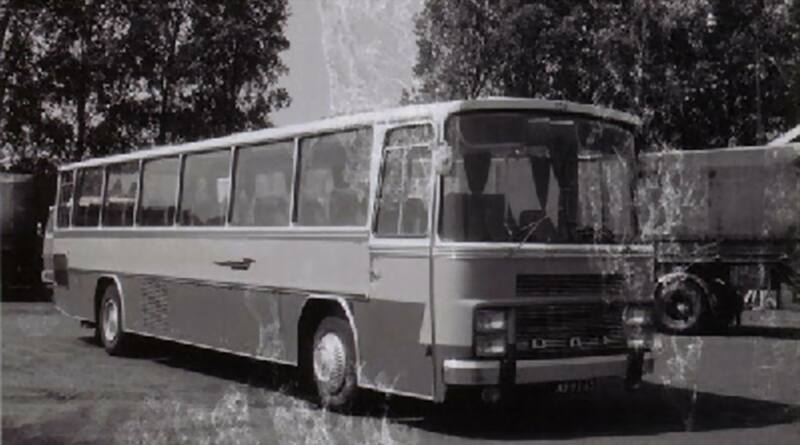 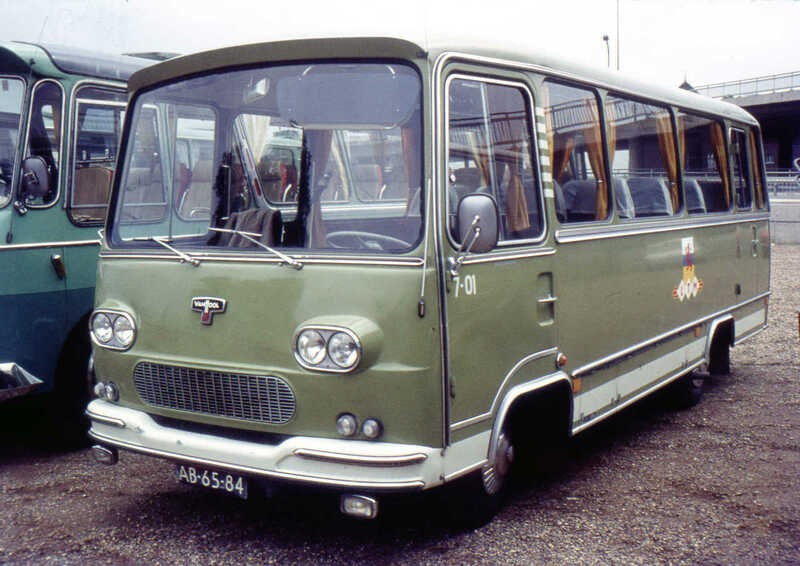 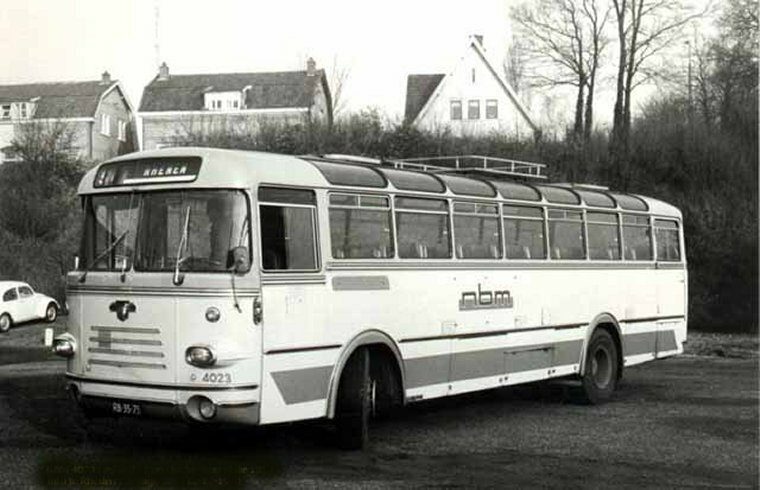 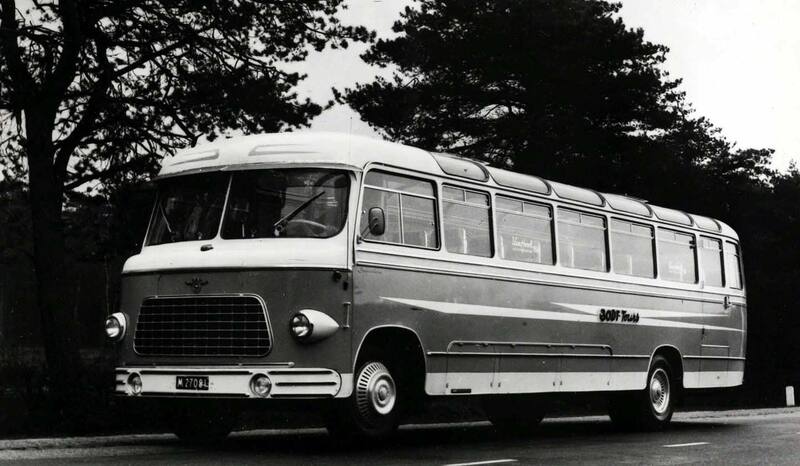 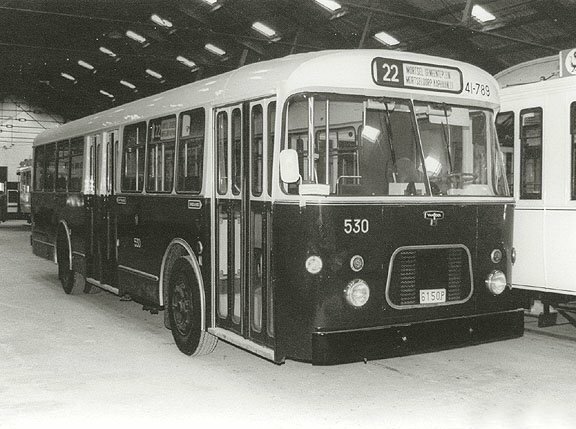 The Van Hool-Fiat co-operation was immediately a great success: a year and a half after the agreement was signed, in August 1958, the 100th Van Hool-Fiat was delivered, and by July 1961, the figure had exceeded 500. 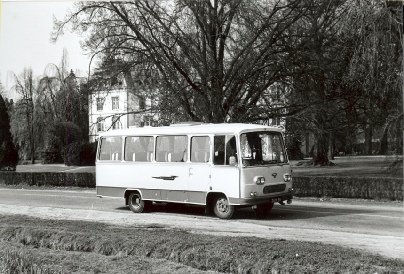 The co-operation agreement with Fiat was terminated in 1981. 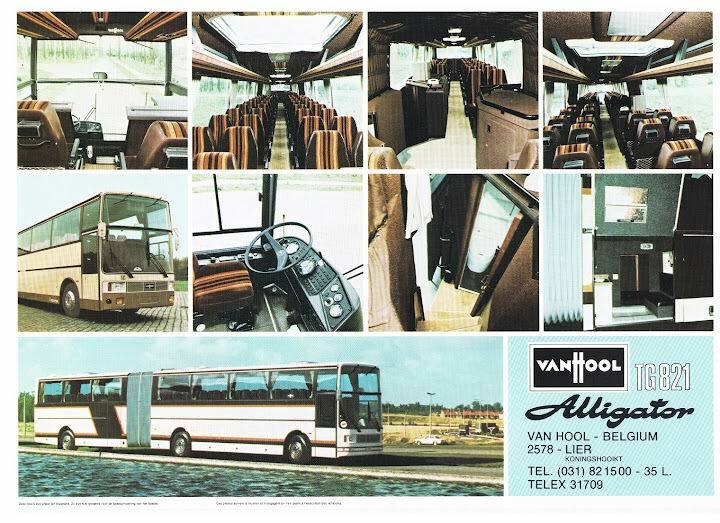 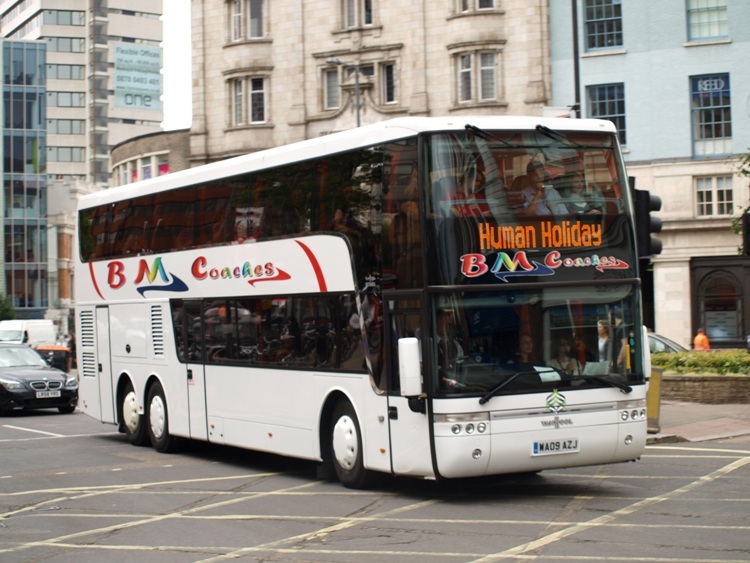 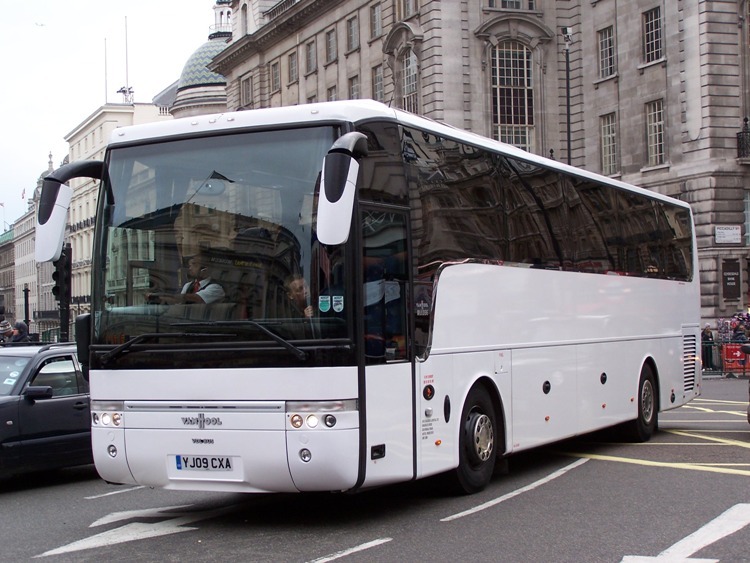 Most of the buses and coaches are built totally by Van Hool, with engines and axles sourced from Caterpillar, Cummins, DAF and MAN and gearboxes from ZF or Voith, with some of their production still consisting of building bus and coach bodies on separate bus chassis from manufacturers such as Volvo and Scania. 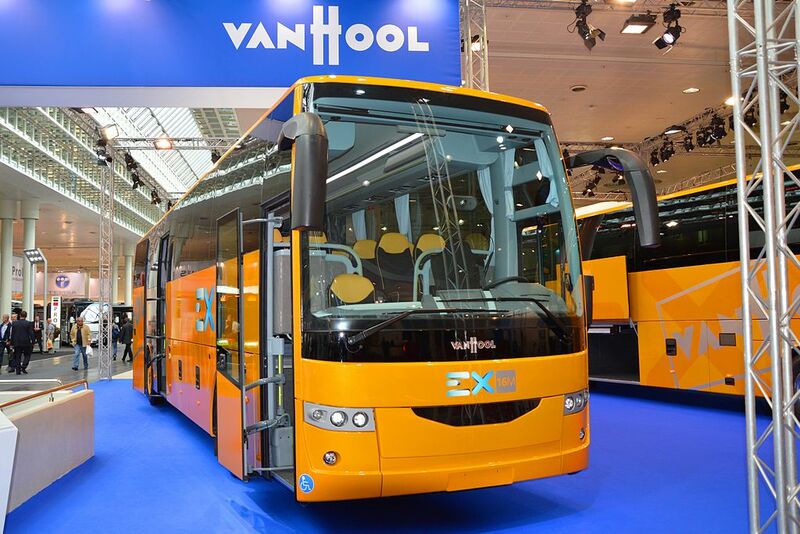 Worldwide, Van Hool employs 4,500 people and manufactures over 1,700 buses and coaches (bodyworks and complete vehicles combined) and 5,000 trailers each year. 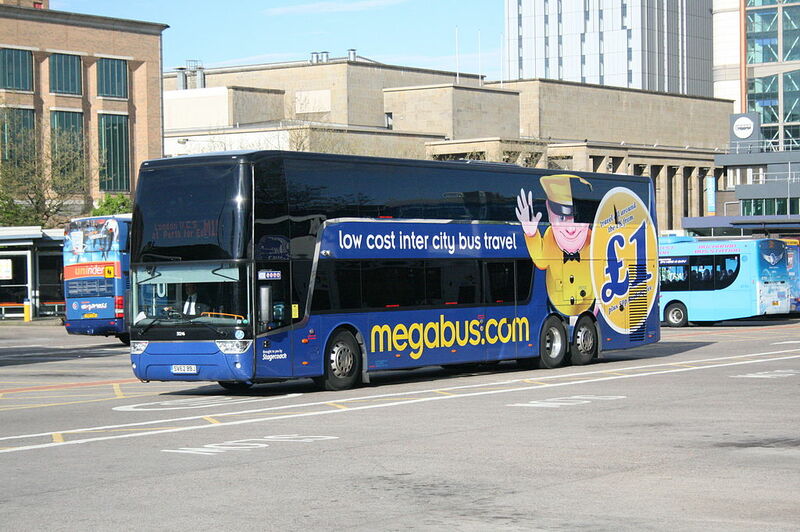 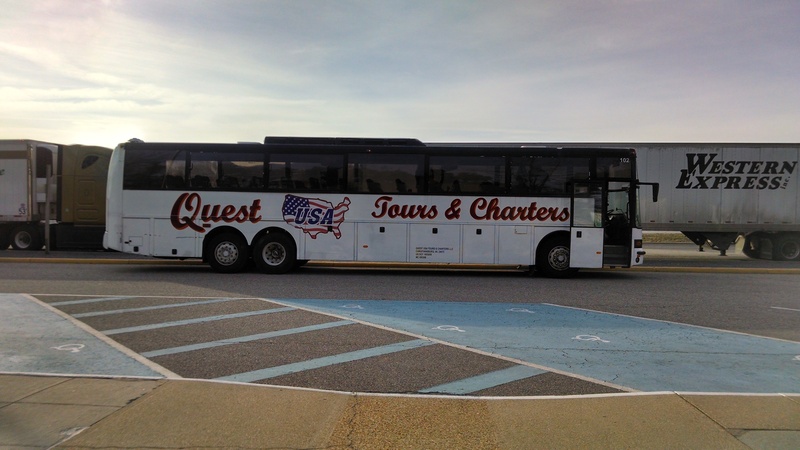 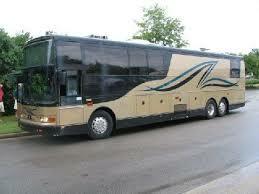 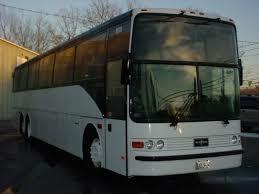 It sells an average of 600 coaches, annually, in the US. 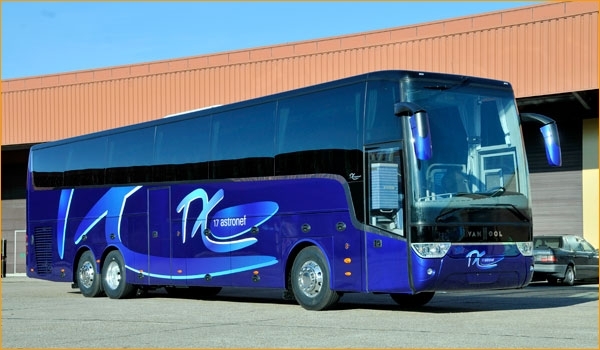 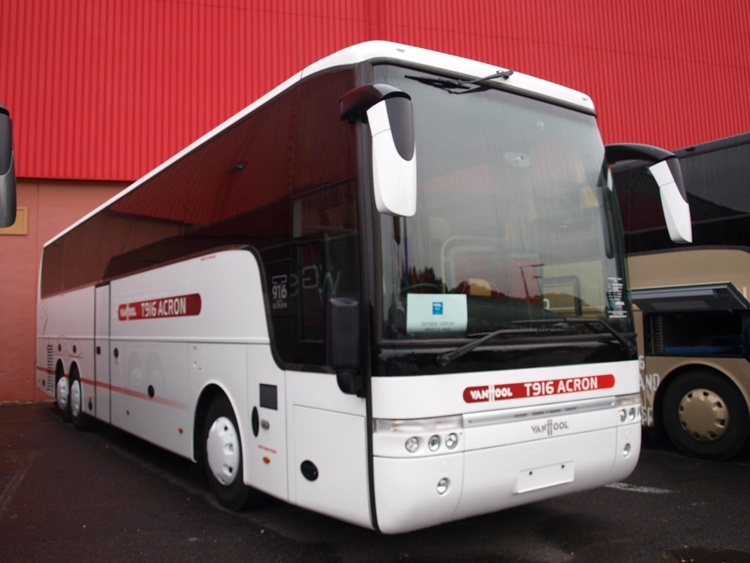 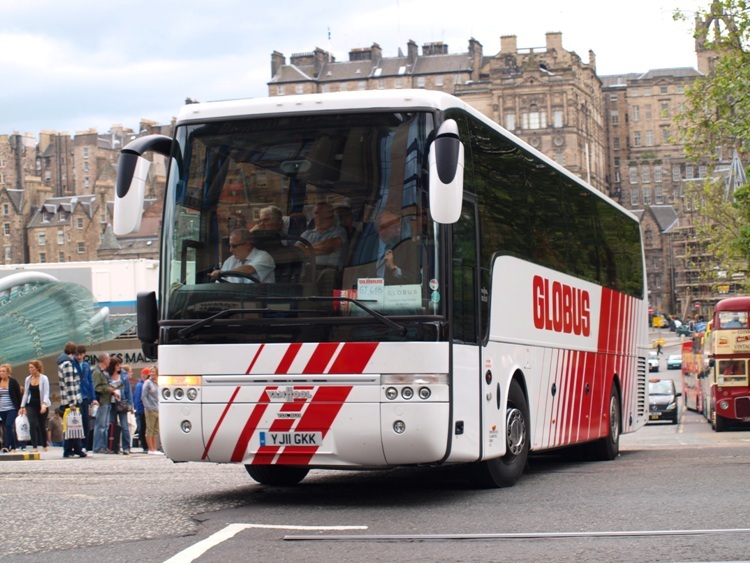 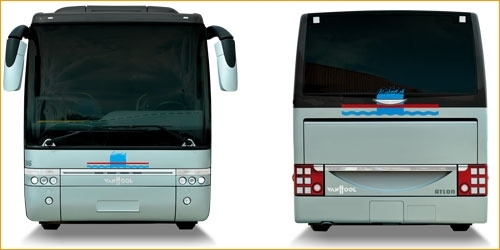 In Europe, Van Hool has the broadest range of coaches of all manufacturers on the market, though all designs share similar looks and are based on the same platform, the T9. 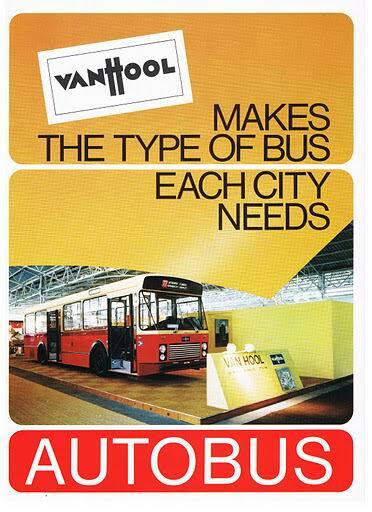 The same philosophy is used on the transit bus range, the A-series. 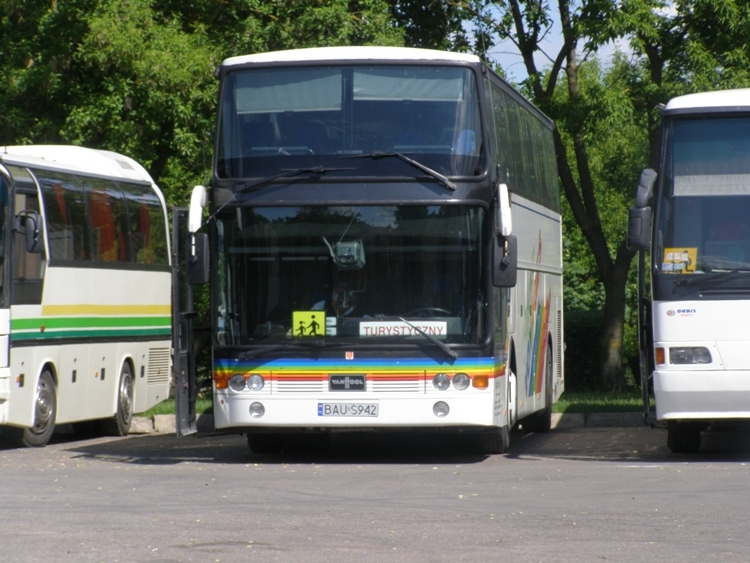 Many different versions are available, all sharing the same looks. 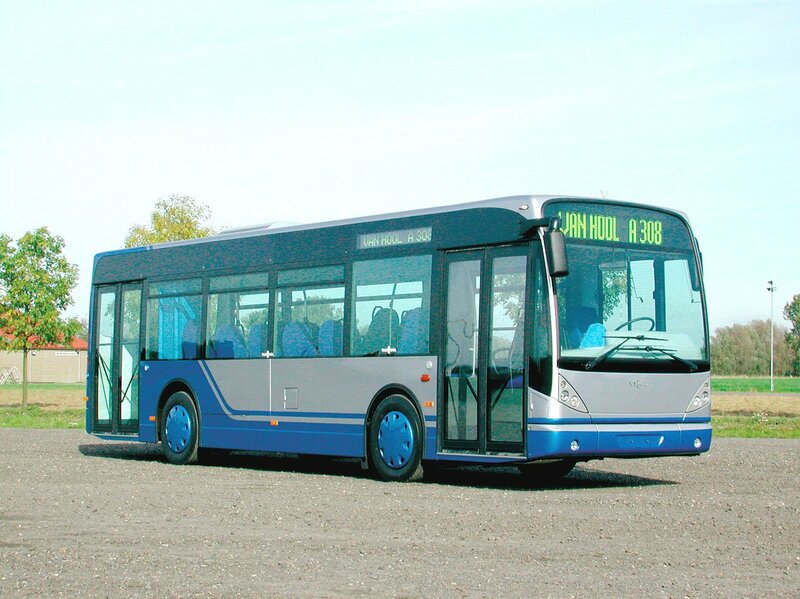 In recent years, the company has been focussing on new propulsion technologies, introducing fuel-cell hybrid buses as well as diesel-electric hybrids. 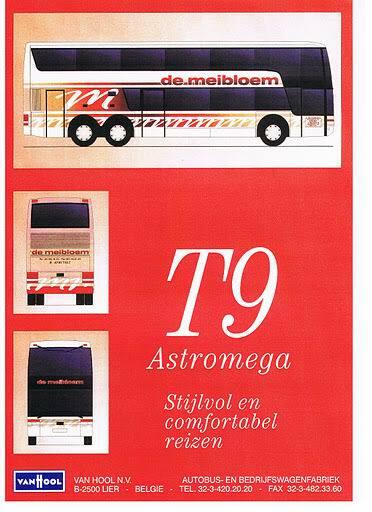 In 1991, an updated ‘T8 New Look’ was introduced. 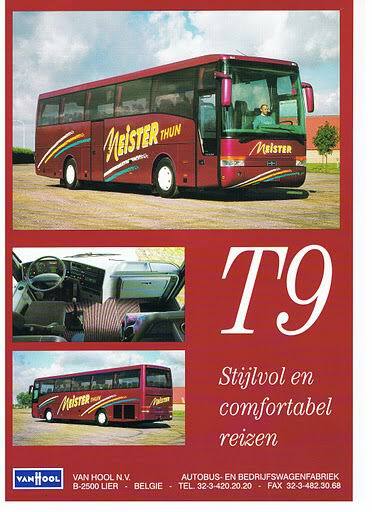 But this was called the T9 in its North American version. 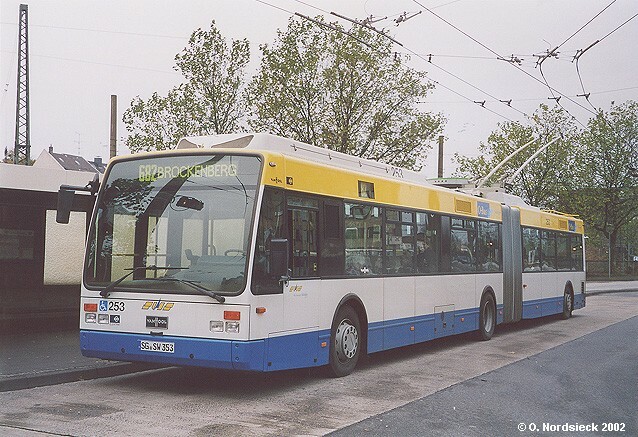 Production was ended in the late 1990s, following the introduction of the new (European) T9 platform. 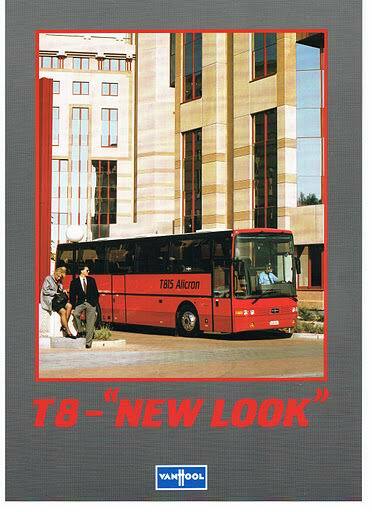 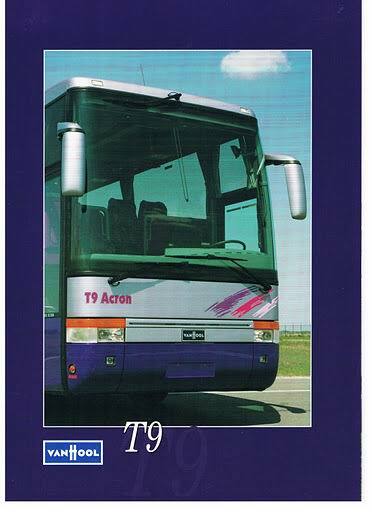 The new T9 series (not to be confused with the US T9 series, which corresponds with the European T8 New Look) was launched in 1995. 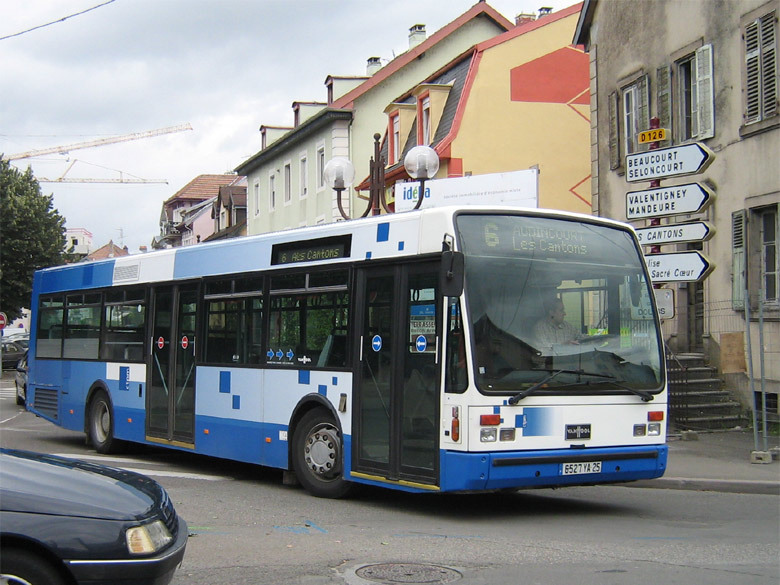 It included a completely new body design, as well as many other improvements. 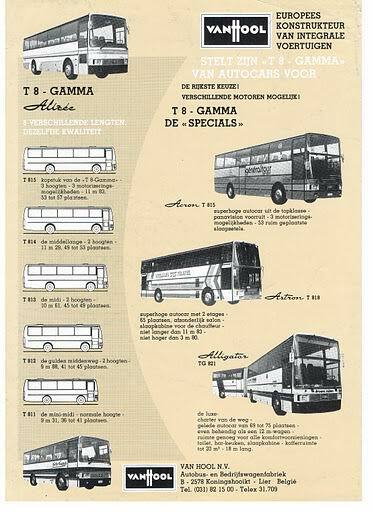 The same philosophy as with the T8 was applied: one platform, many different versions. 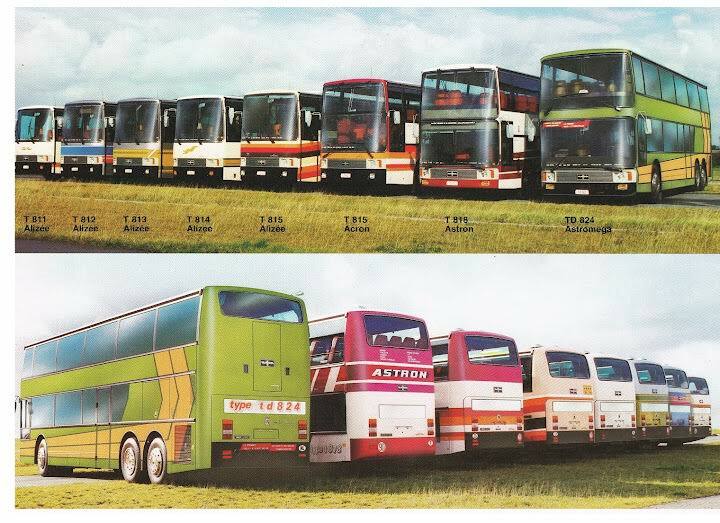 Also, the naming convention was retained. 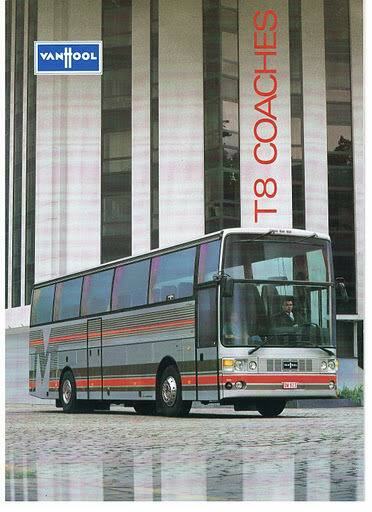 Over the years, many new variants have been developed, making the T9-series the most extensive series of motorcoaches available today. 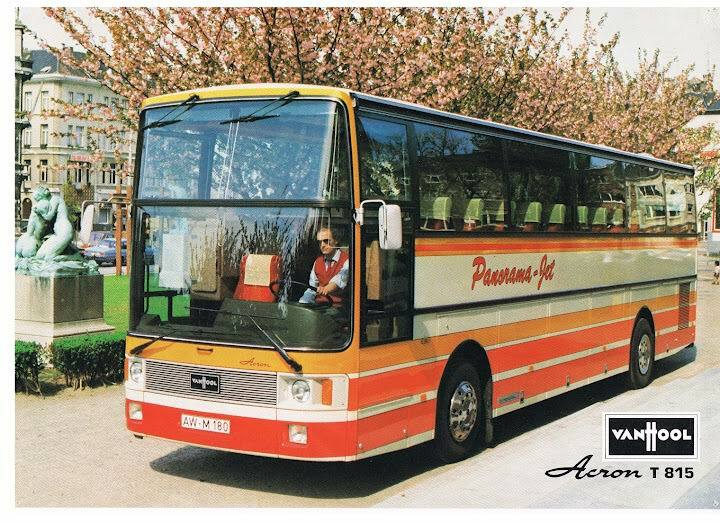 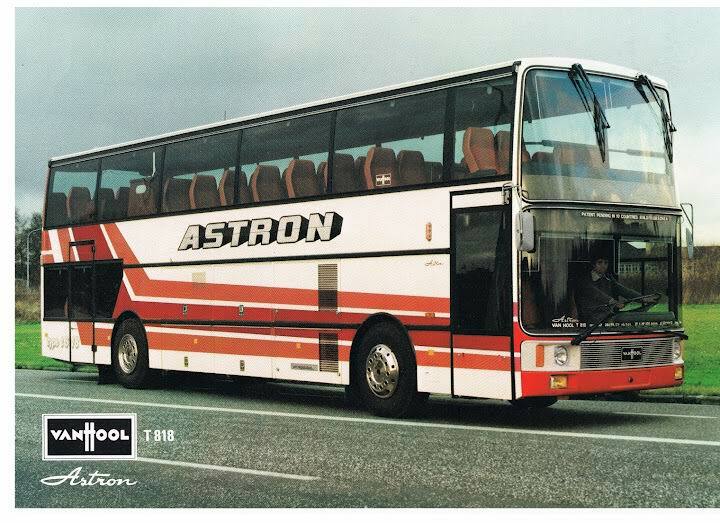 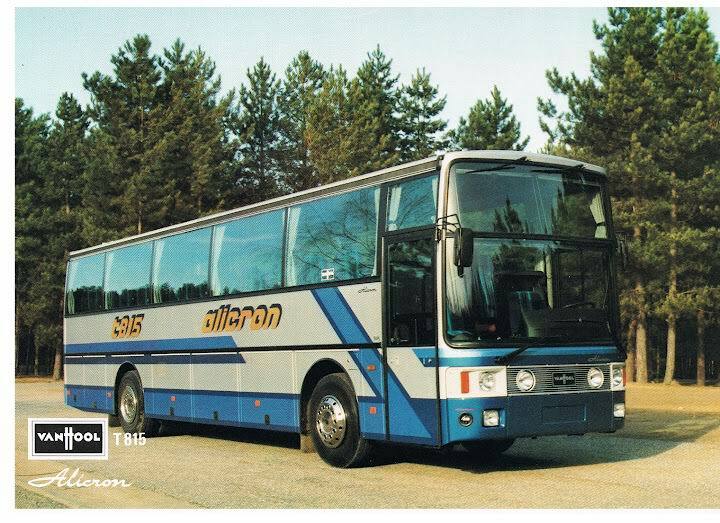 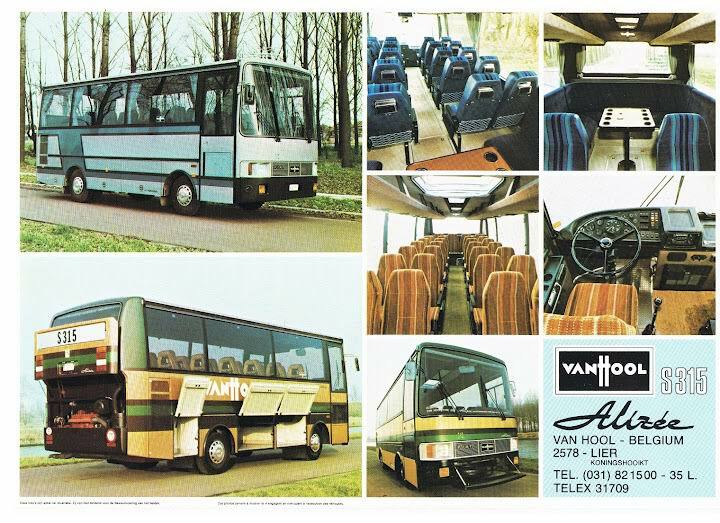 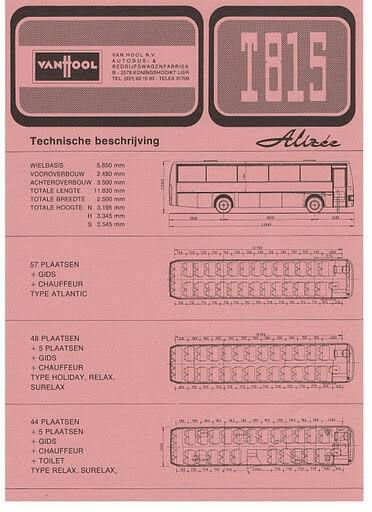 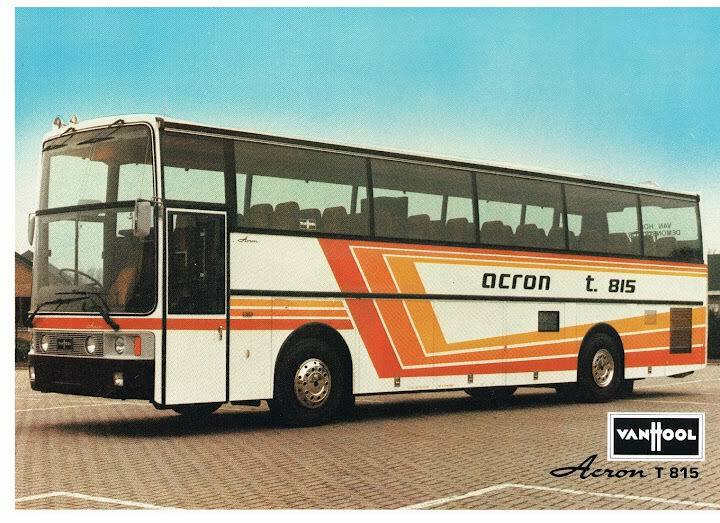 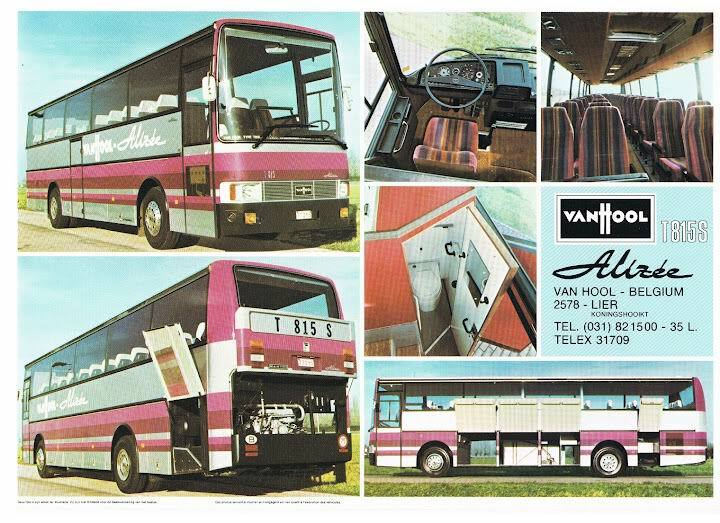 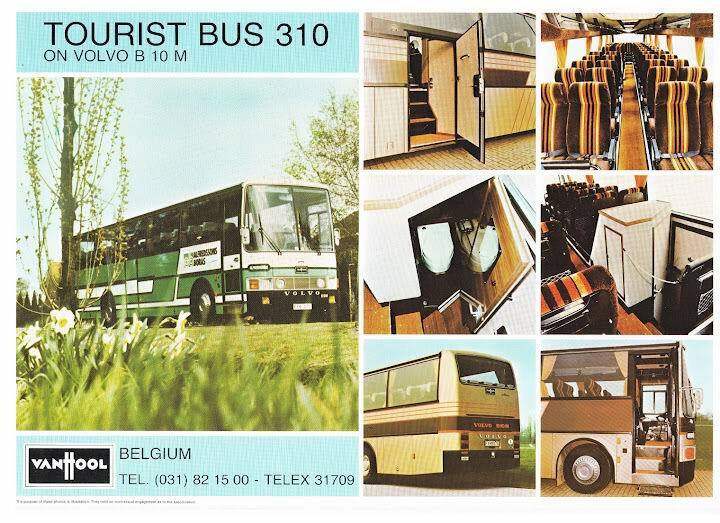 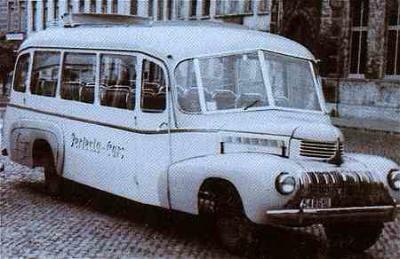 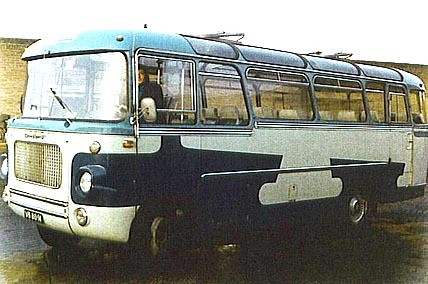 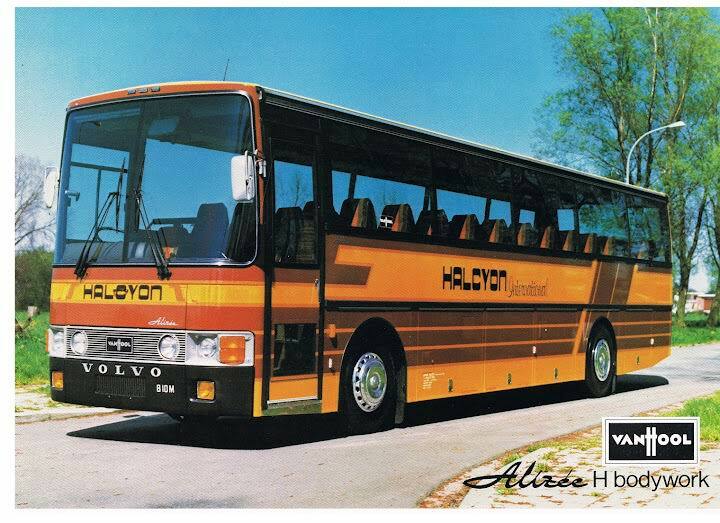 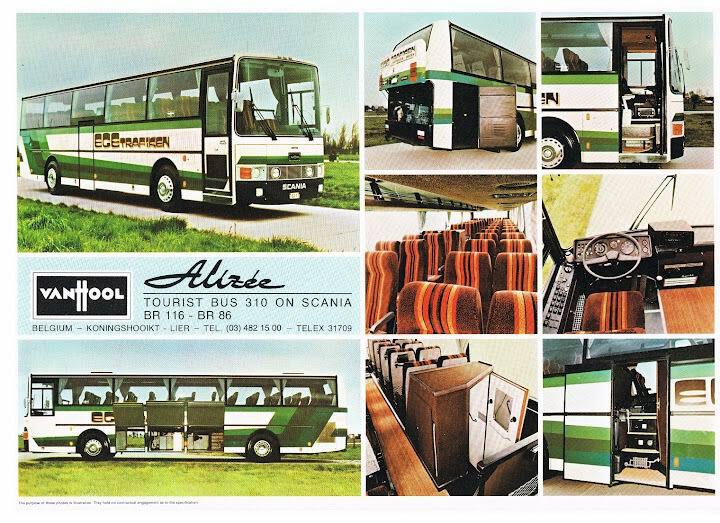 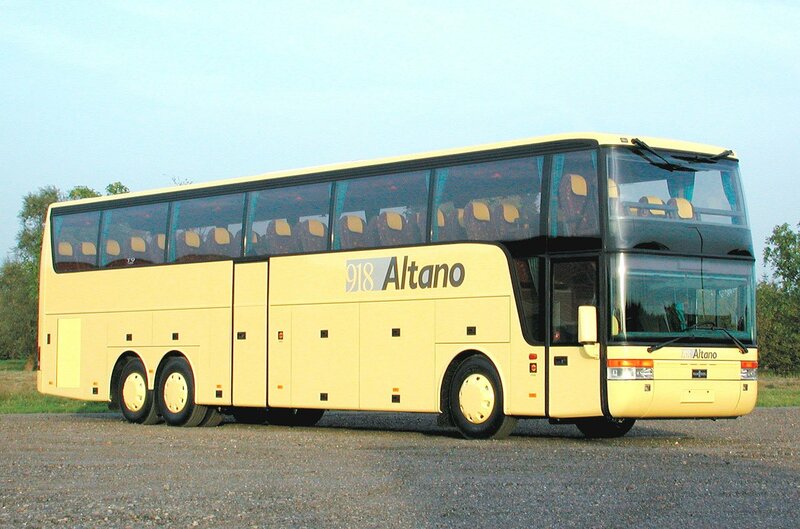 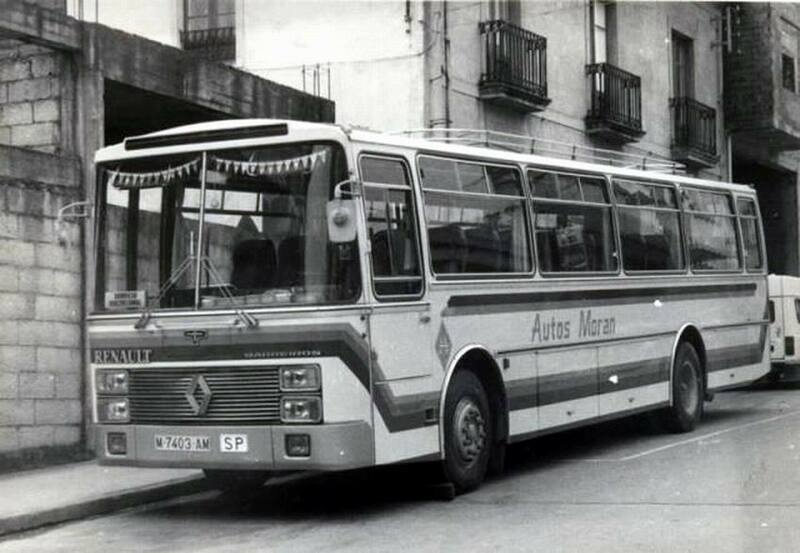 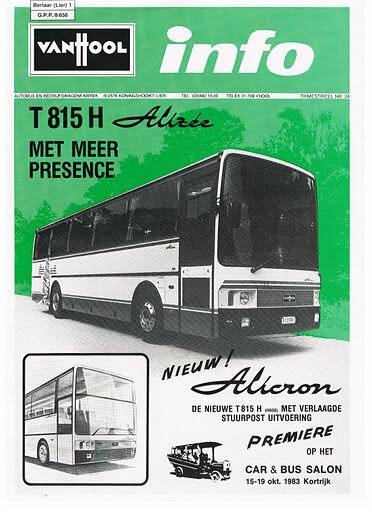 Different models (all available in at least 2 lengths, see ‘products’ below) include the Atlino and Atlon, so-called double earners, with different floor heights, the Alicron, Acron and Astron, standard touring coaches with different heights and thus different luggage space, the Altano, which has an underfloor cockpit, the Astronef, which features a sloping theatre-style floor, and the double deck Astromega. 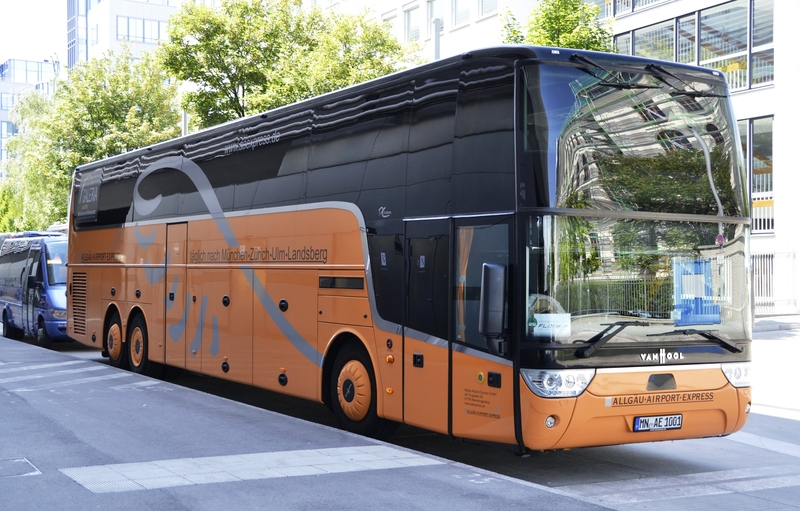 Additionally, the T9 body is also available on chassis by Scania, Volvo and VDL, though only in Sweden and on the British Isles. 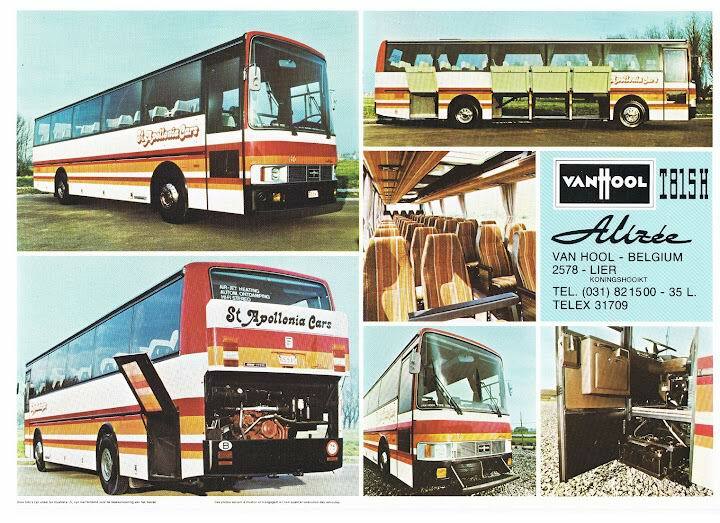 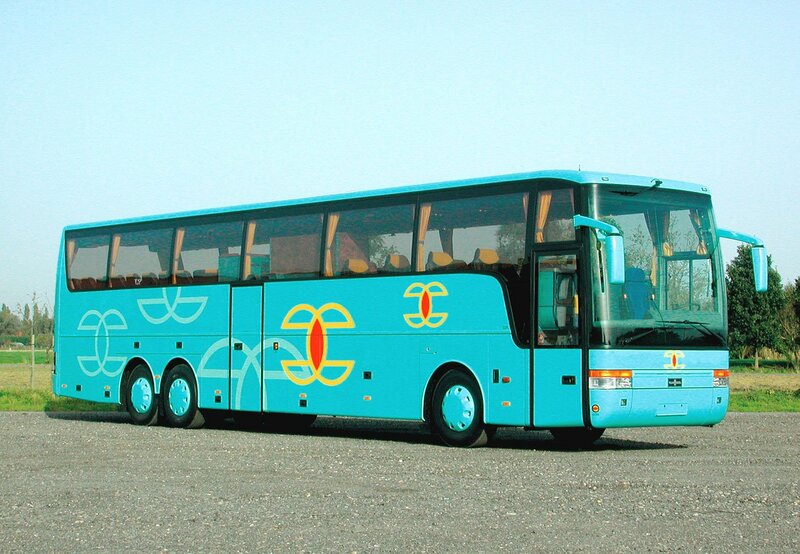 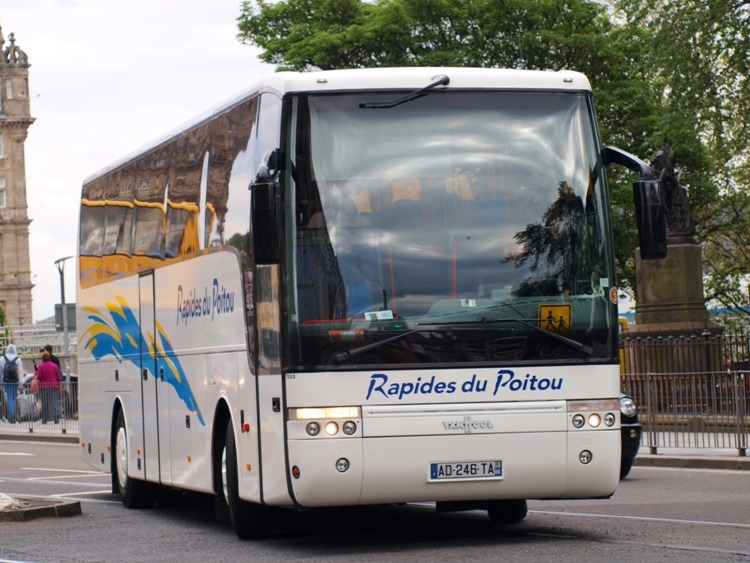 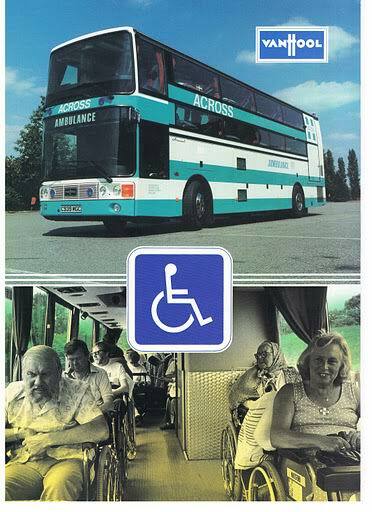 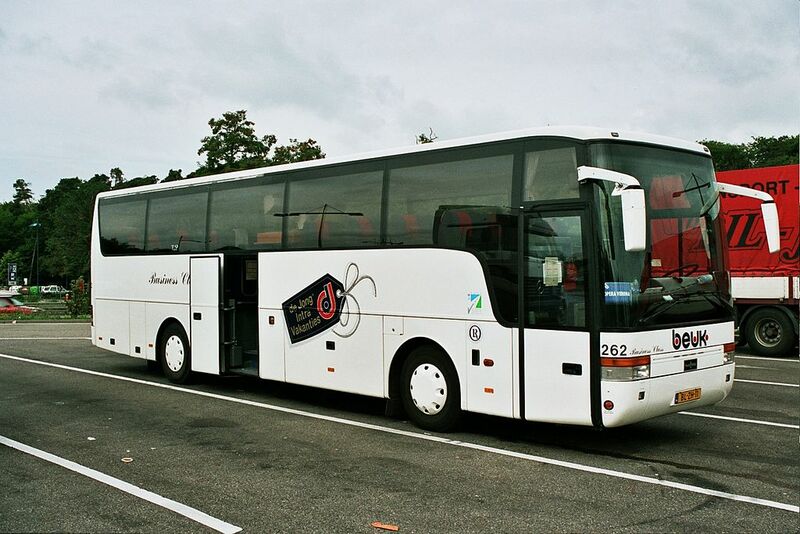 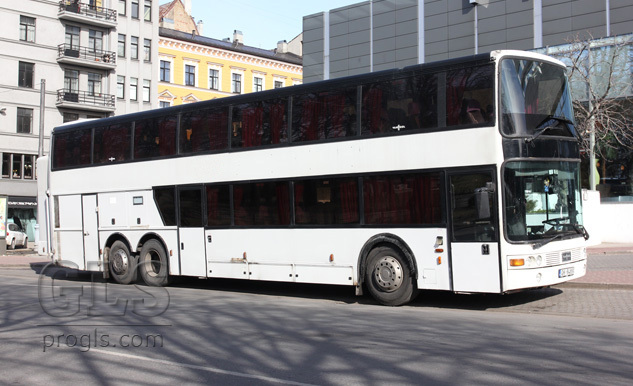 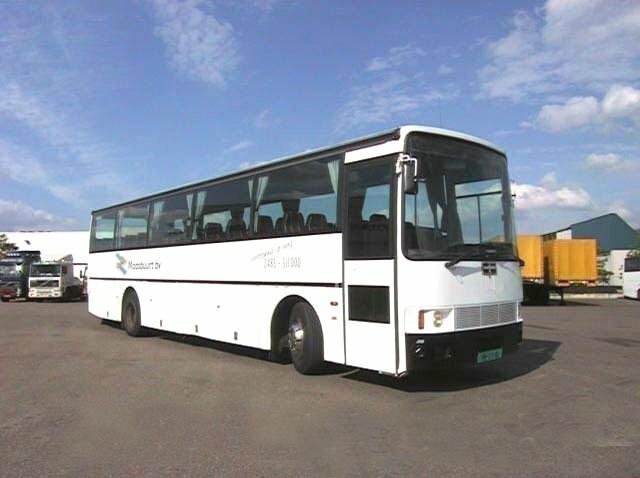 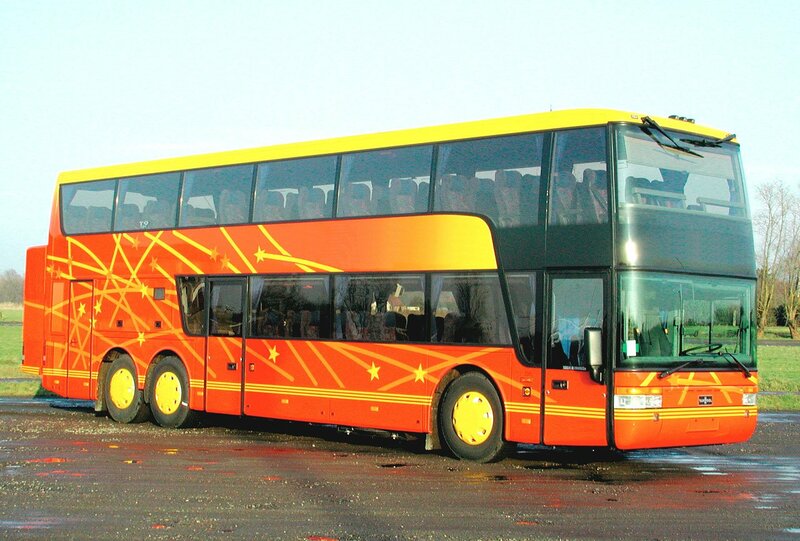 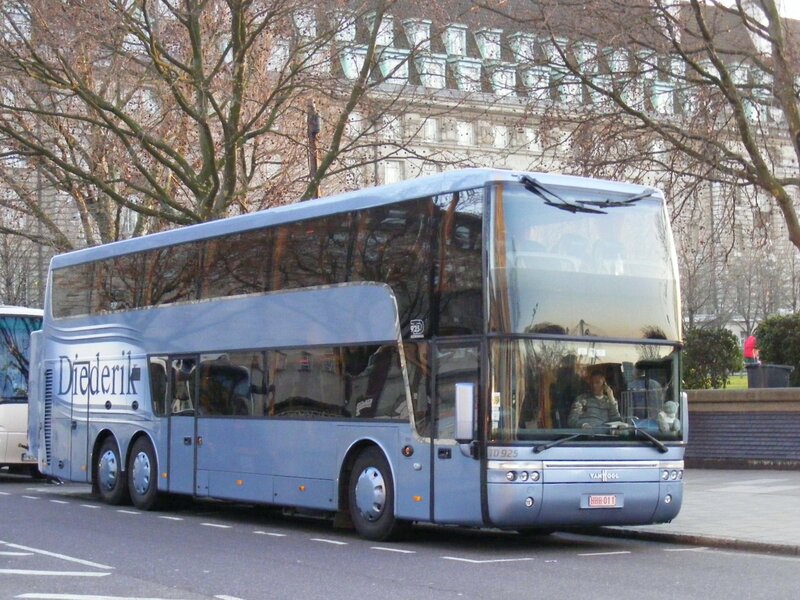 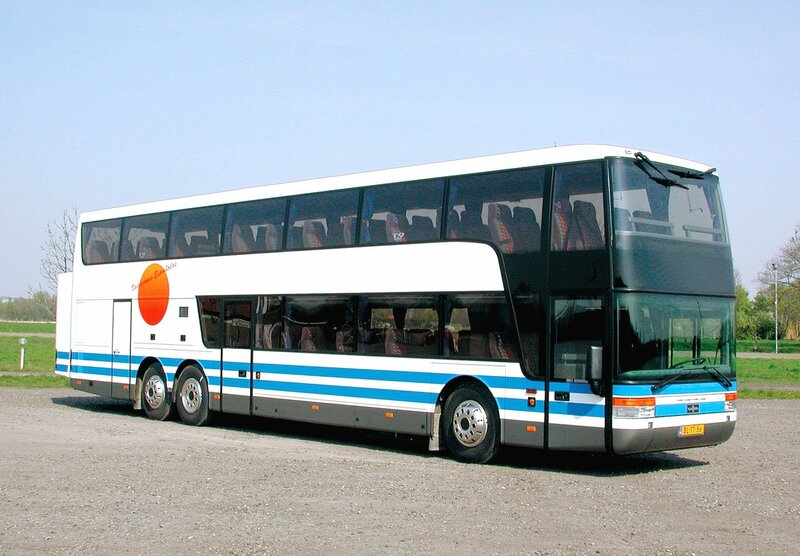 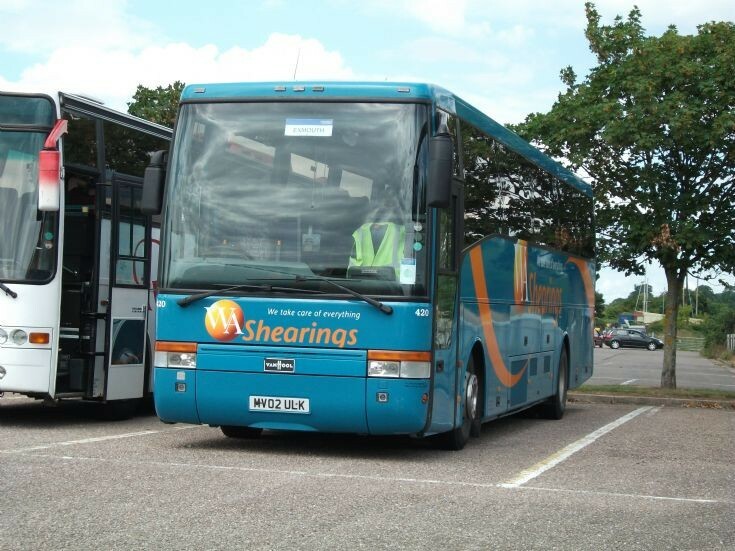 These motorcoaches are referred to as Alizee (single deck) and Astrobel (double deck). 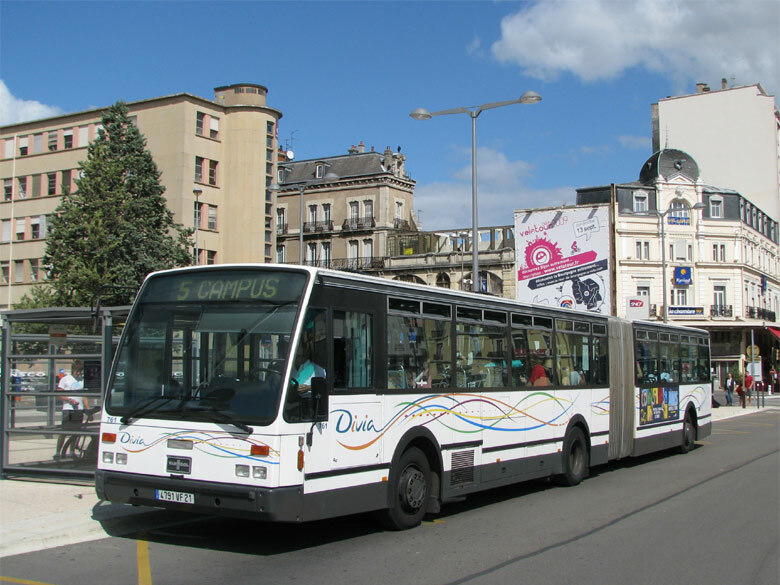 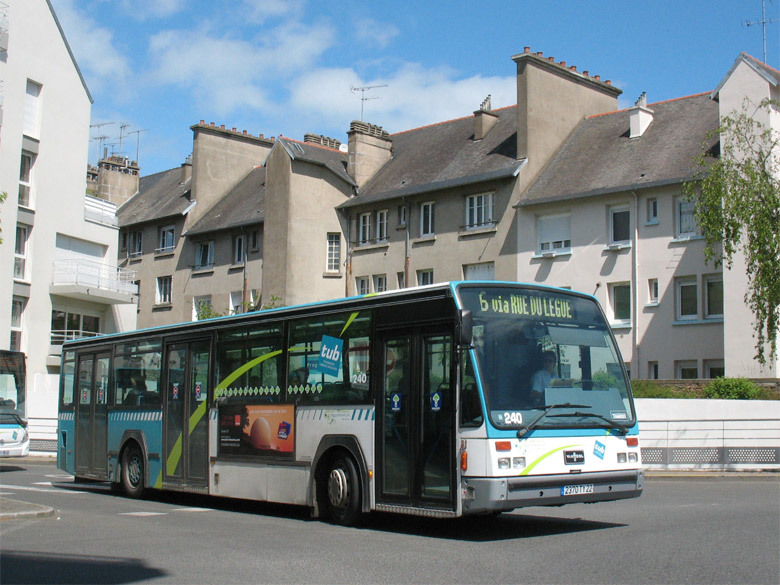 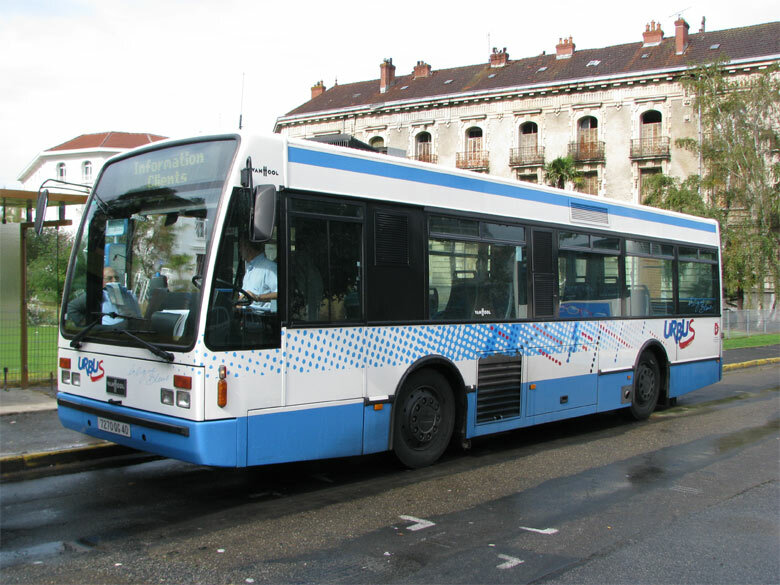 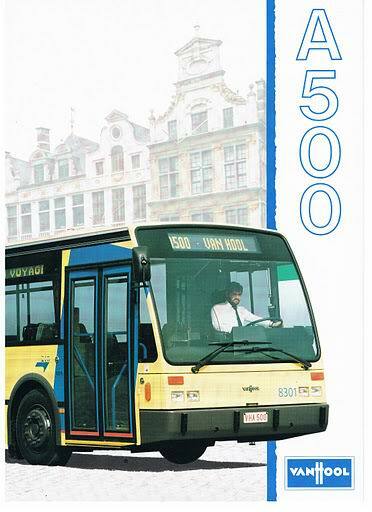 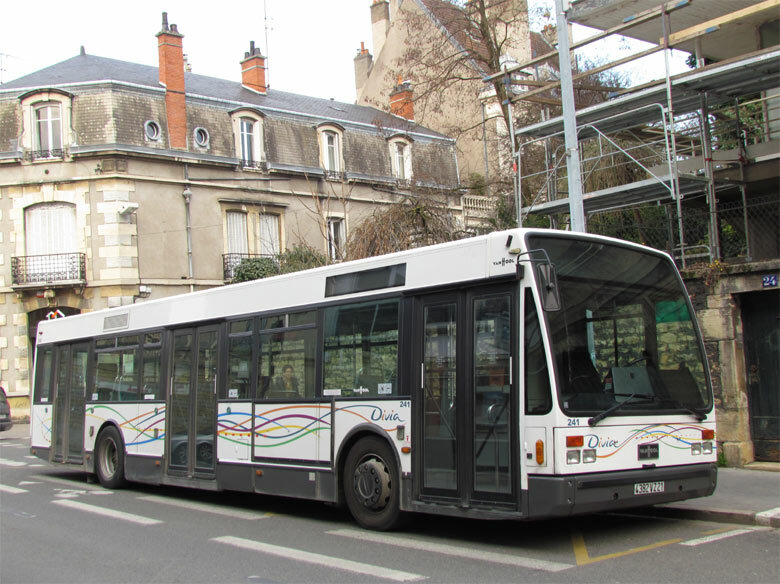 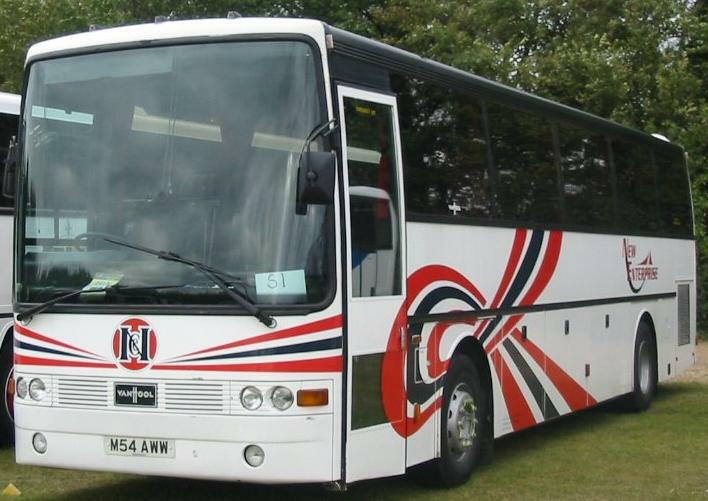 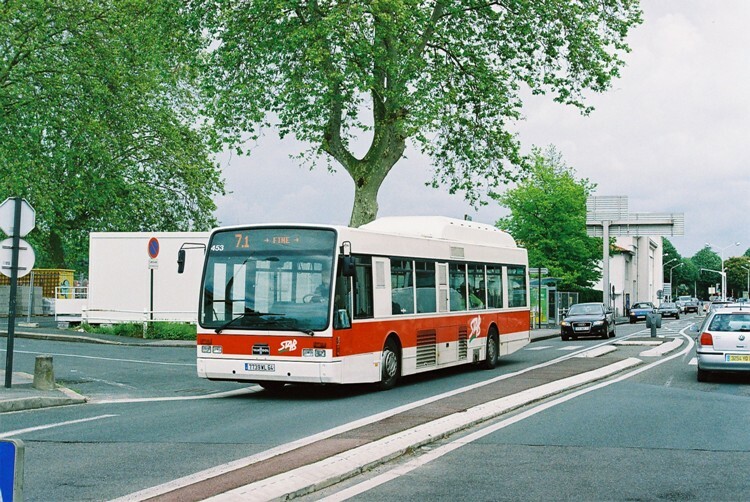 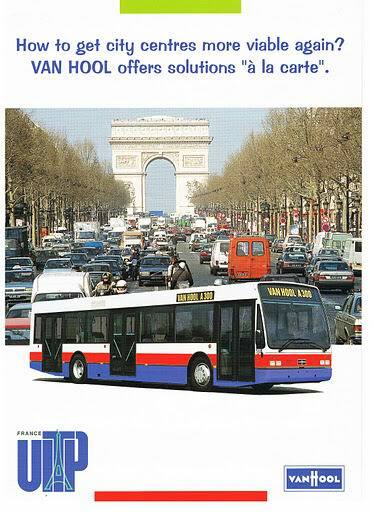 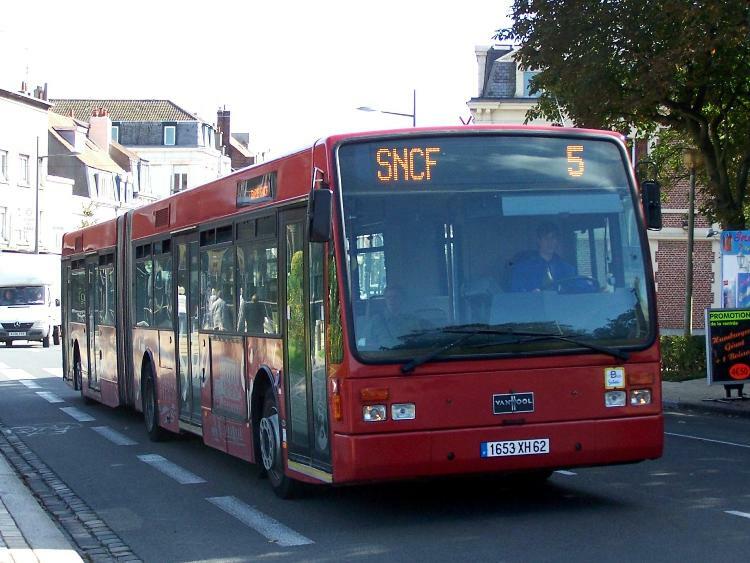 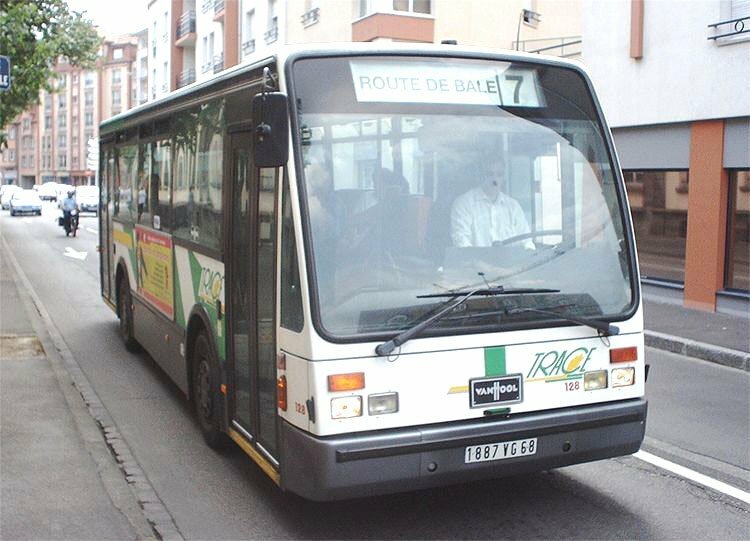 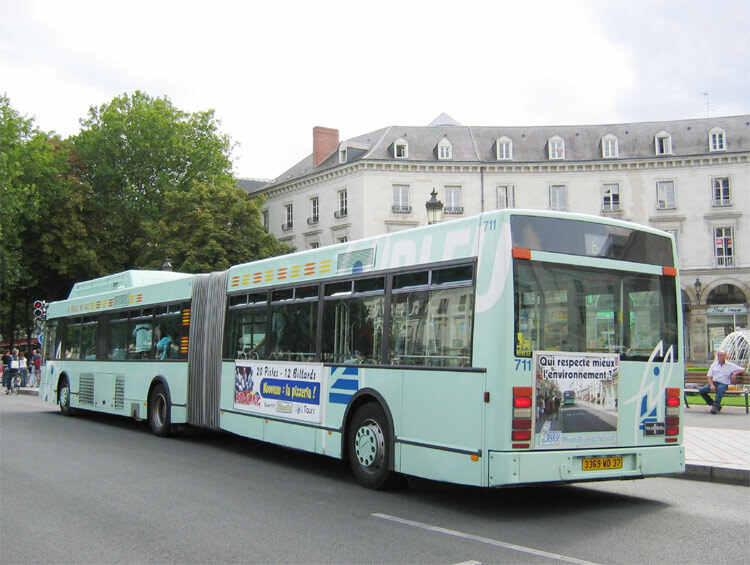 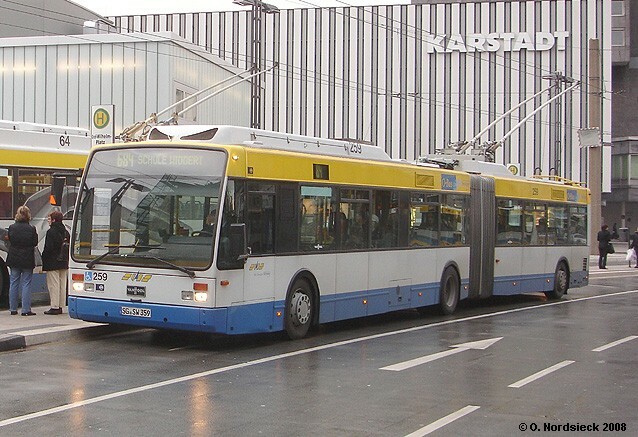 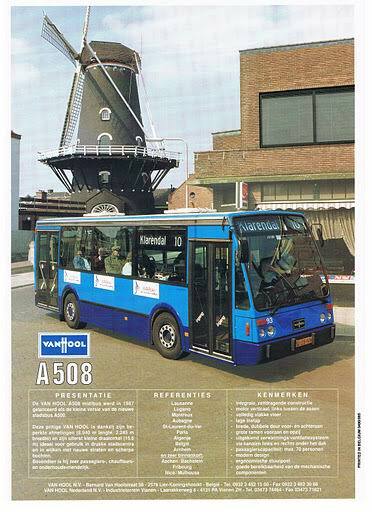 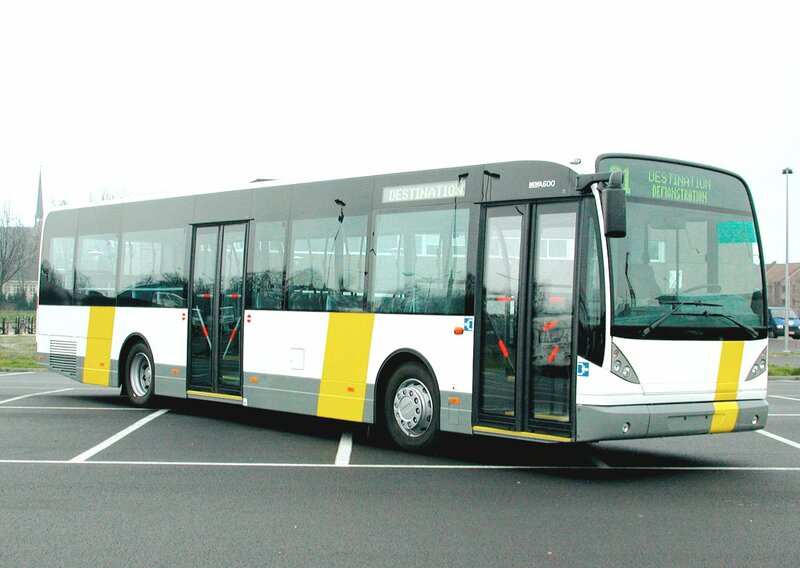 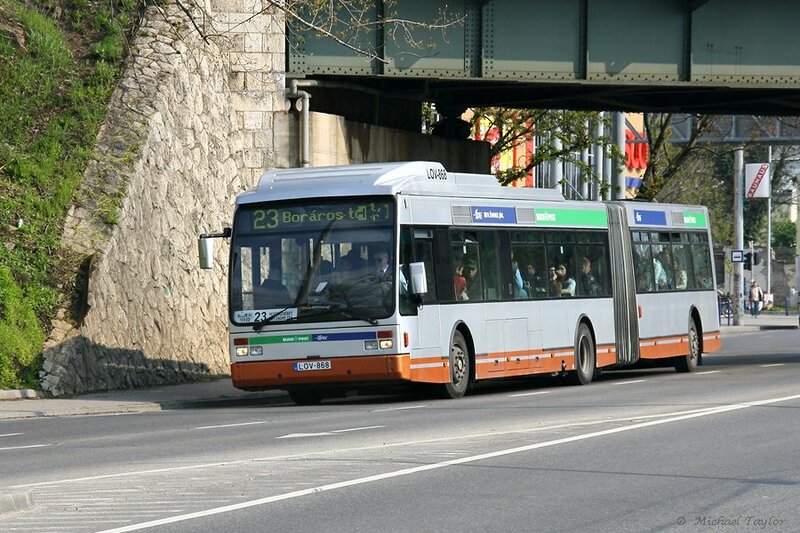 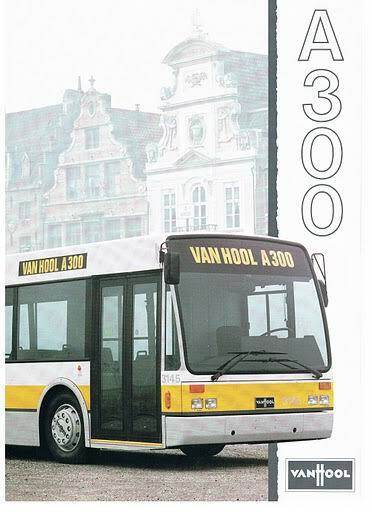 In 2001, Van Hool introduced the newA series transit buses, replacing the A series. 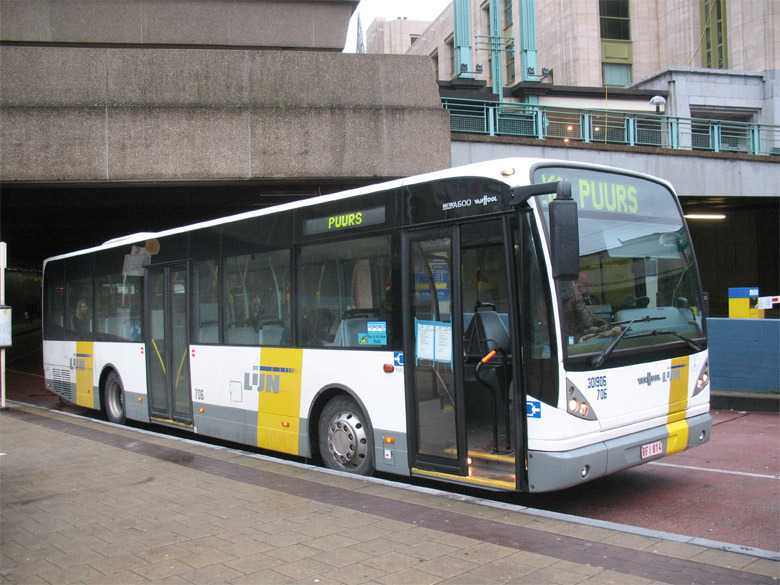 It featured a new body design and many other improvements. 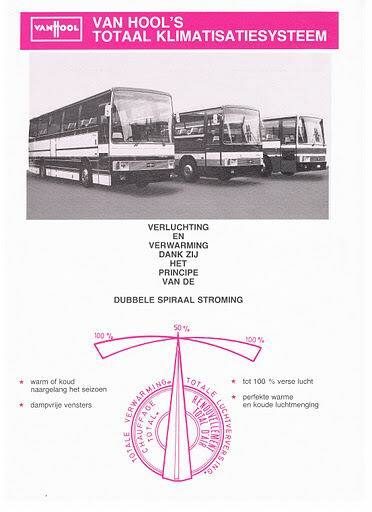 A complete family was developed, with different length and configurations. 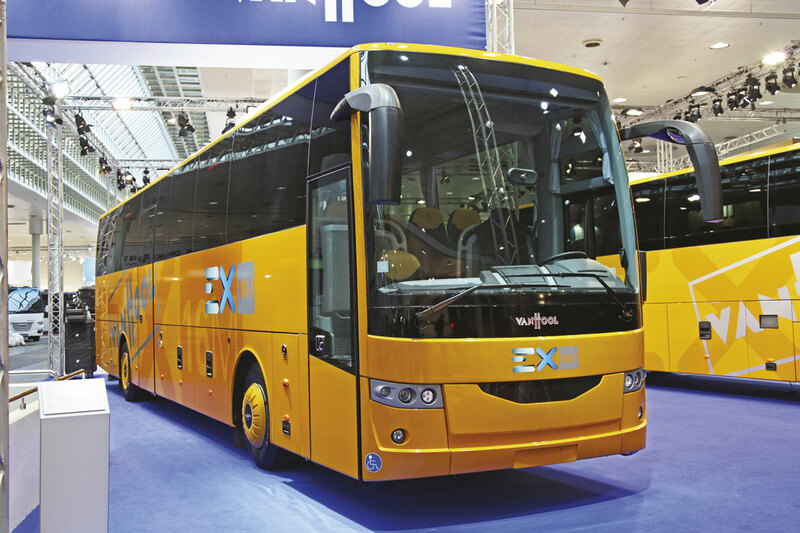 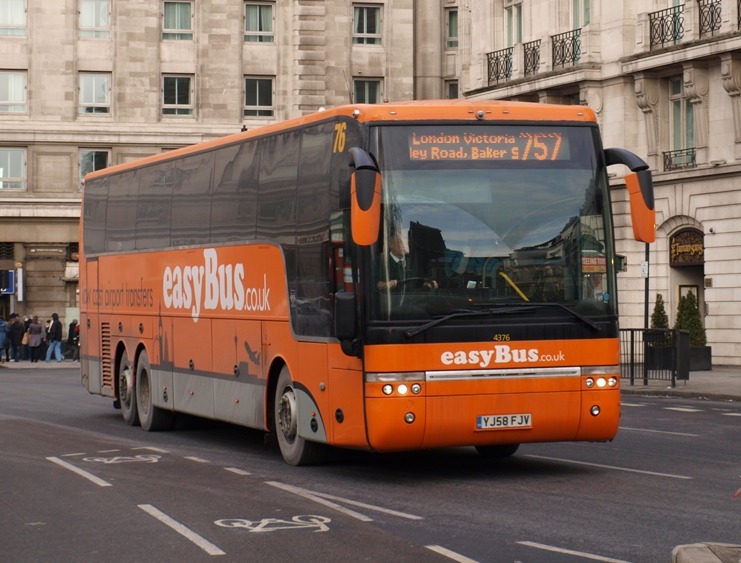 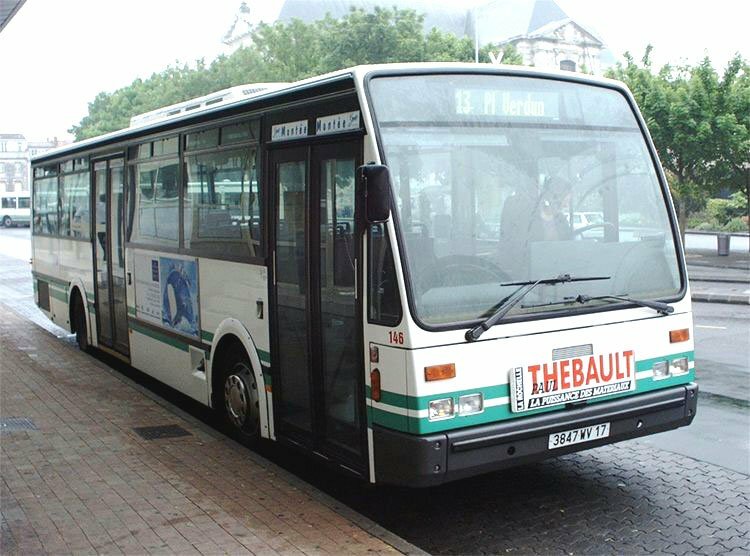 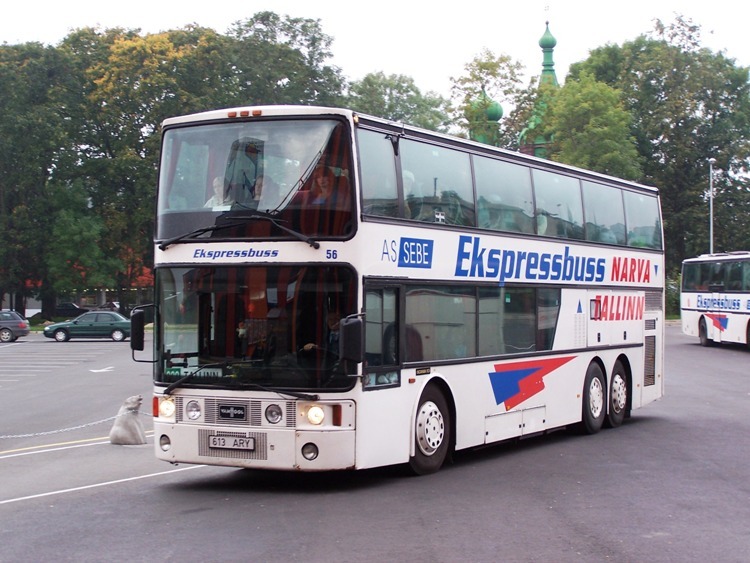 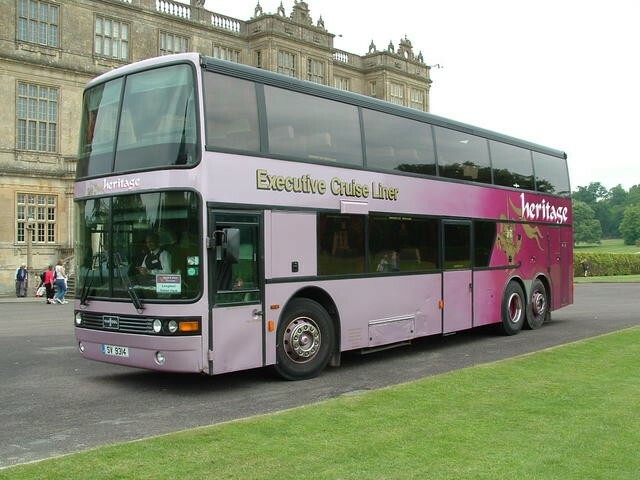 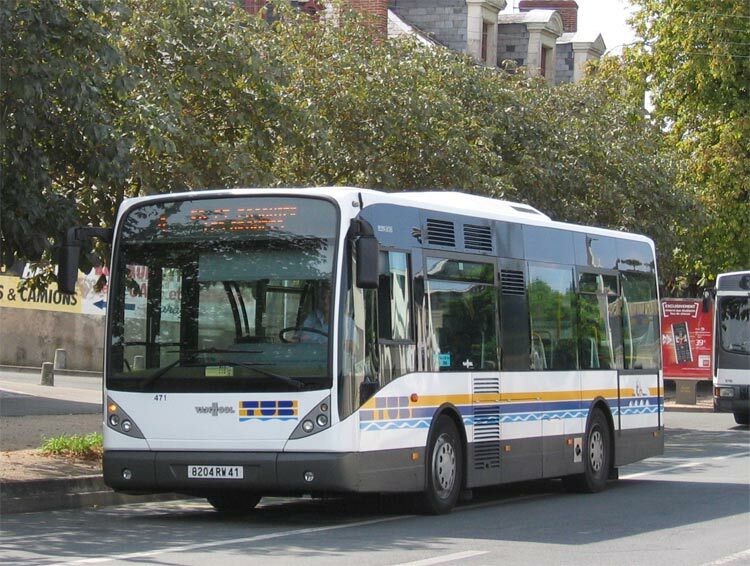 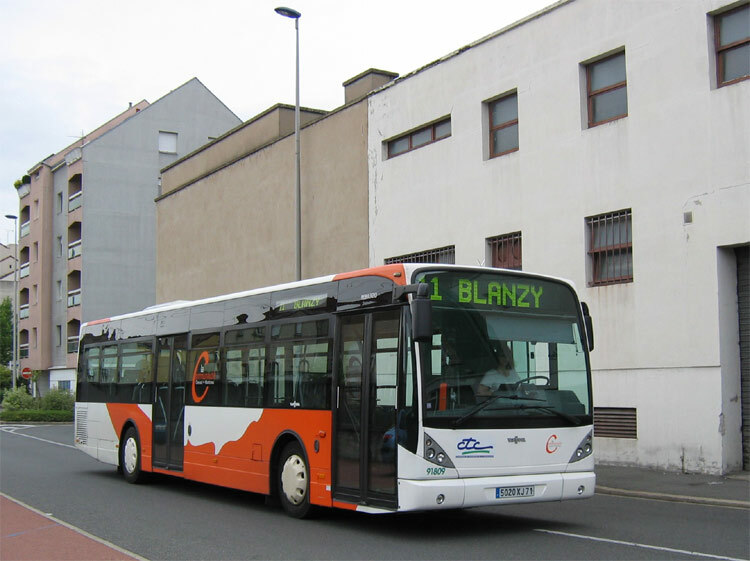 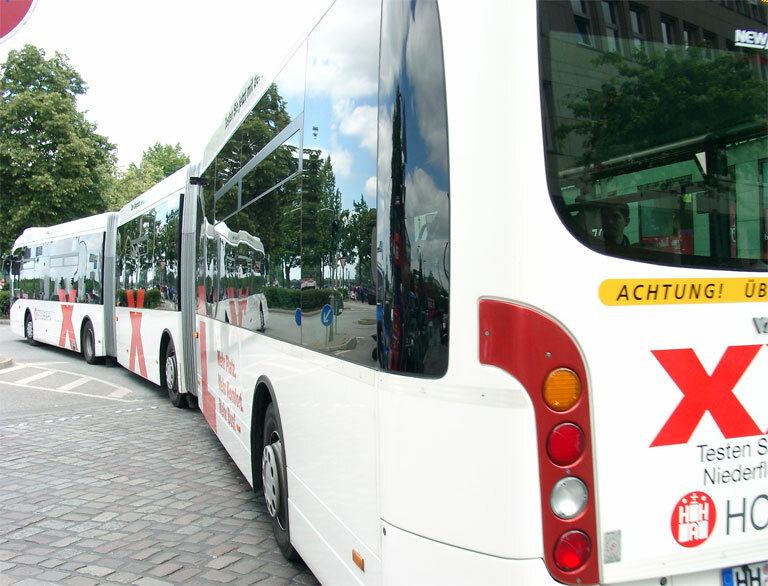 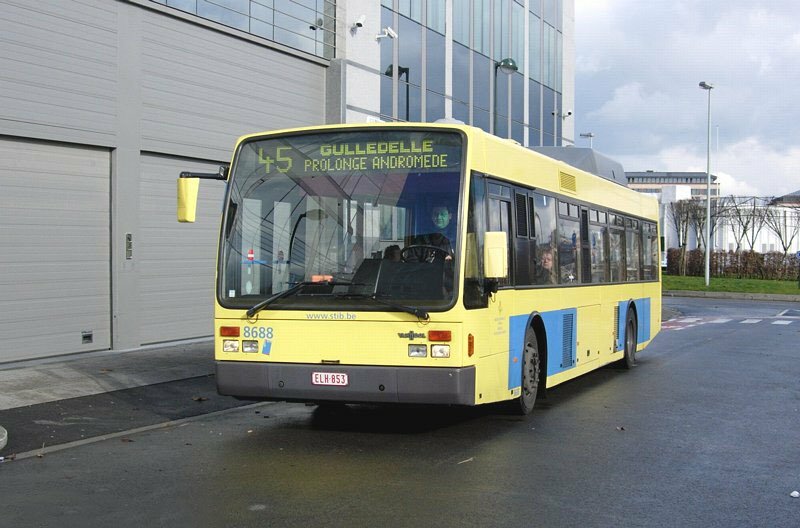 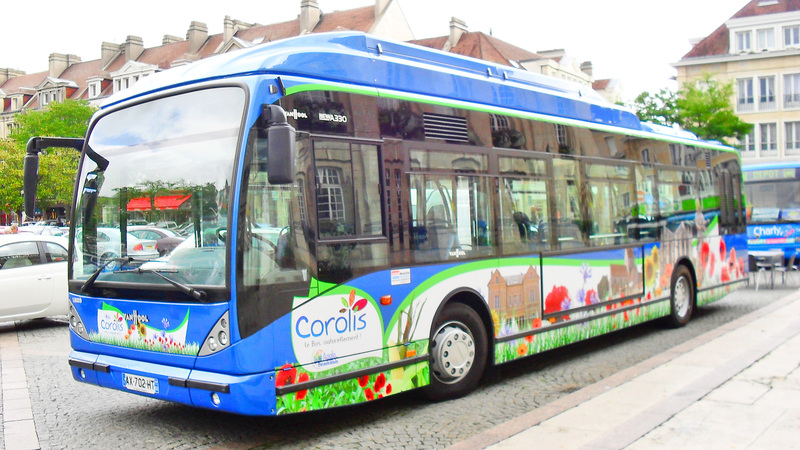 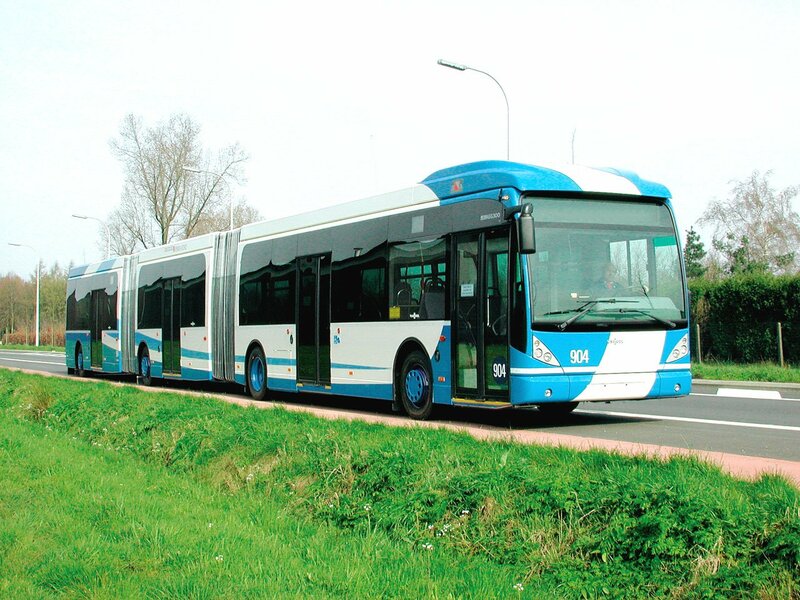 In April 2011 Van Hool launched a new Multi Propulsion Platform called ExquiCity, aimed specifically at the BRT market. 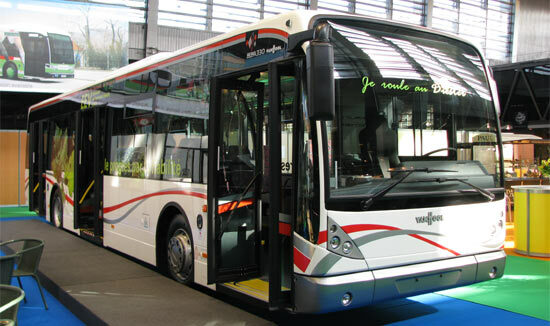 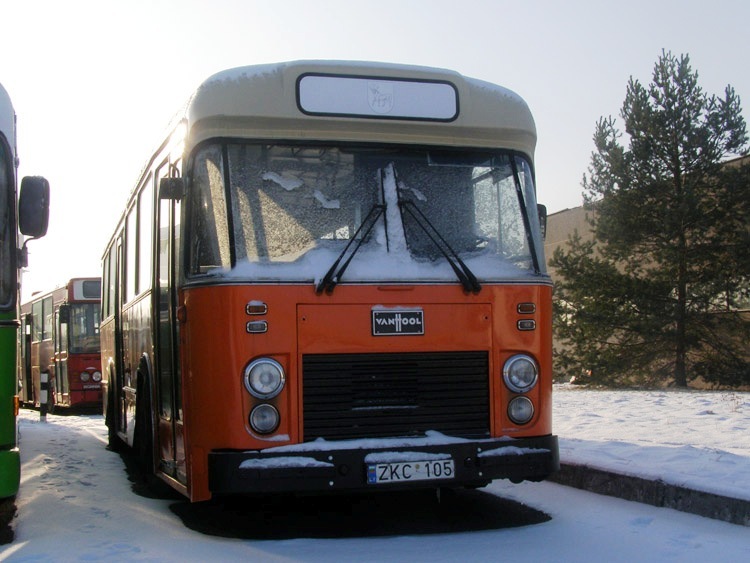 The bus has the styling and comfort of a tram, with the flexibility and cost of a bus. 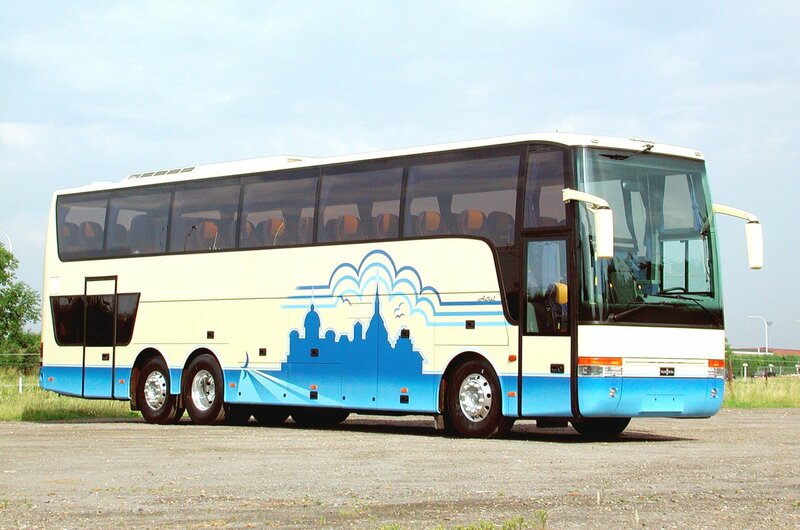 The ExquiCity was launched in two lengths, the single-articulated ExquiCity 18 and the double-articulated ExquiCity 24. 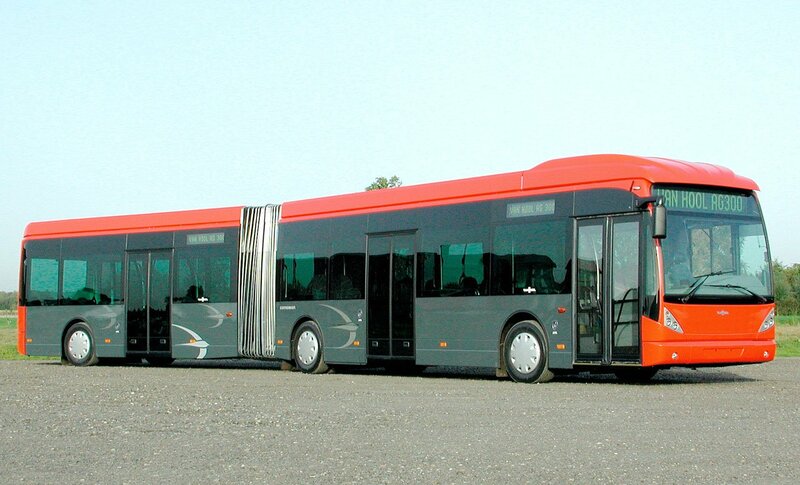 Both are available as trolley buses, diesel-electric hybrids, fuel-cell hybrids or full-electric buses. 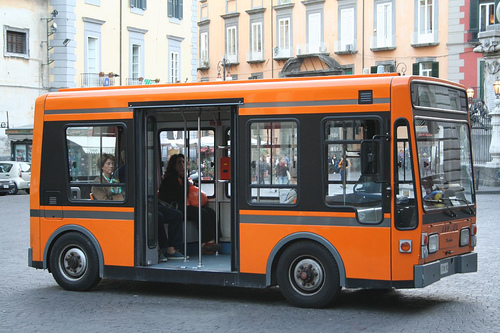 First orders were placed by the Italian city of Parma (ExquiCity 18 trolley) and the French city of Metz (ExquiCity 24 diesel electric hybrid). 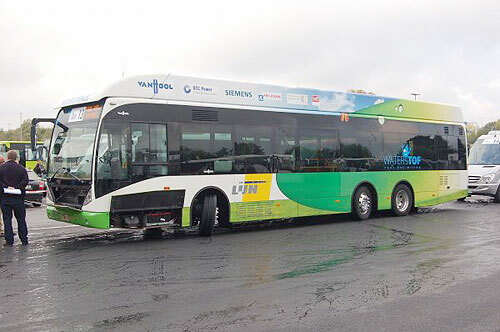 A mock-up was presented at the UITP Congress in Dubai. 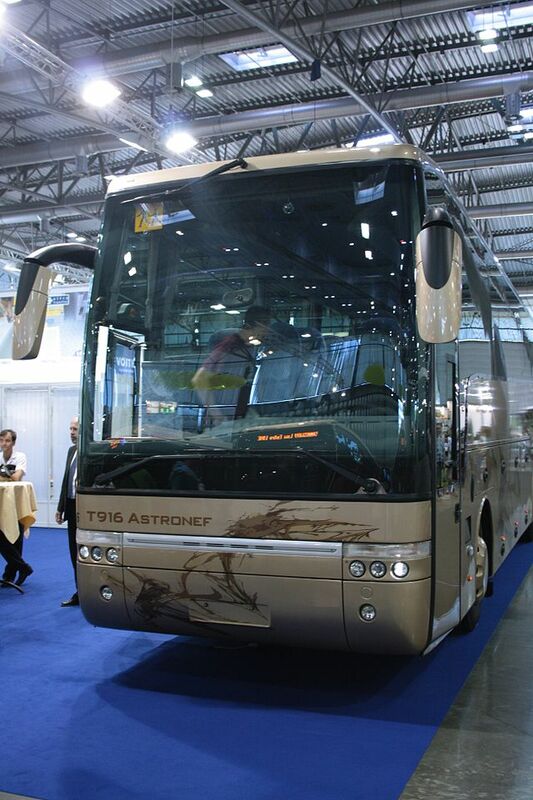 At the Internationale Automobil-Ausstellung 2014 in Hanover, Germany, Van Hool presented a new series of touring coaches for the European market. 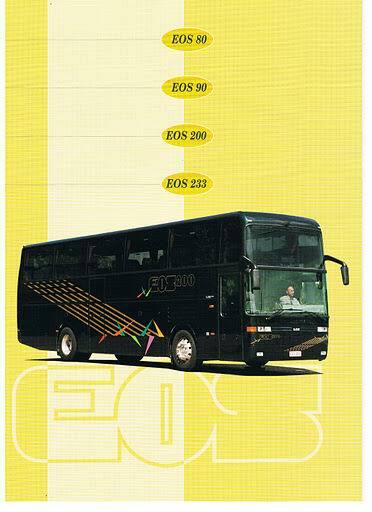 This new line is called EX. 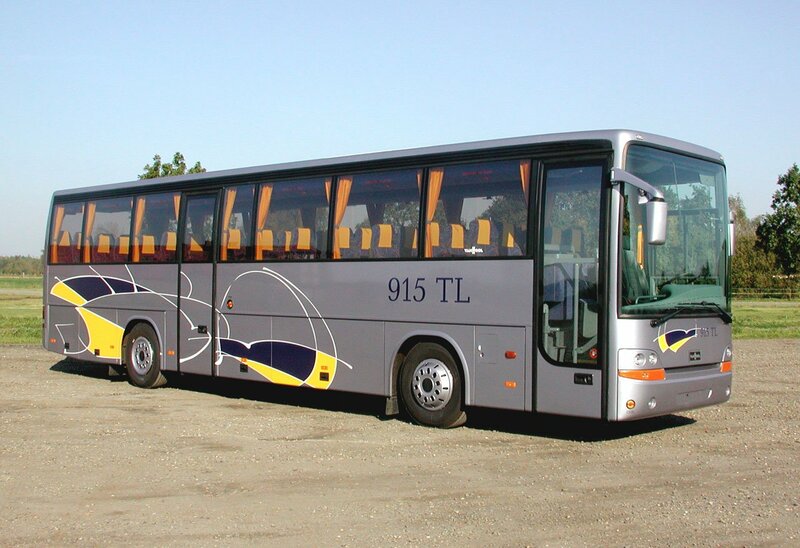 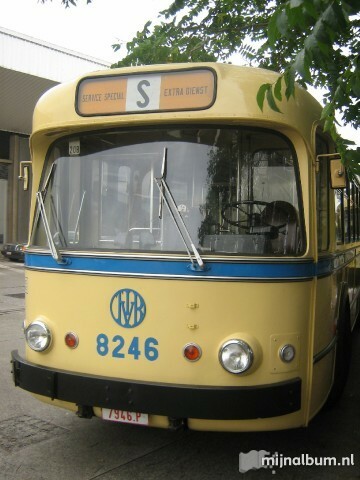 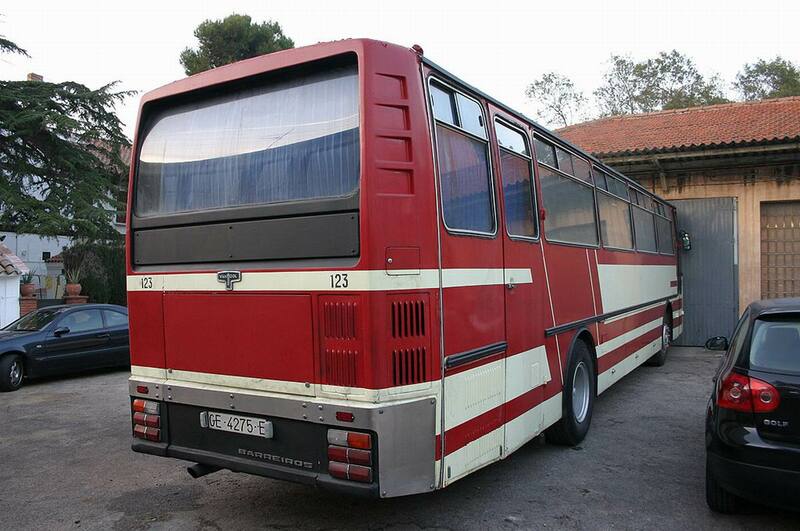 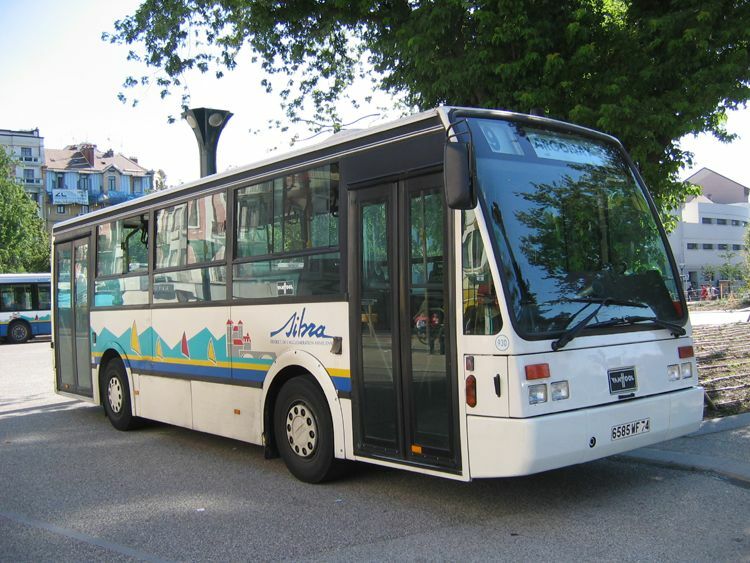 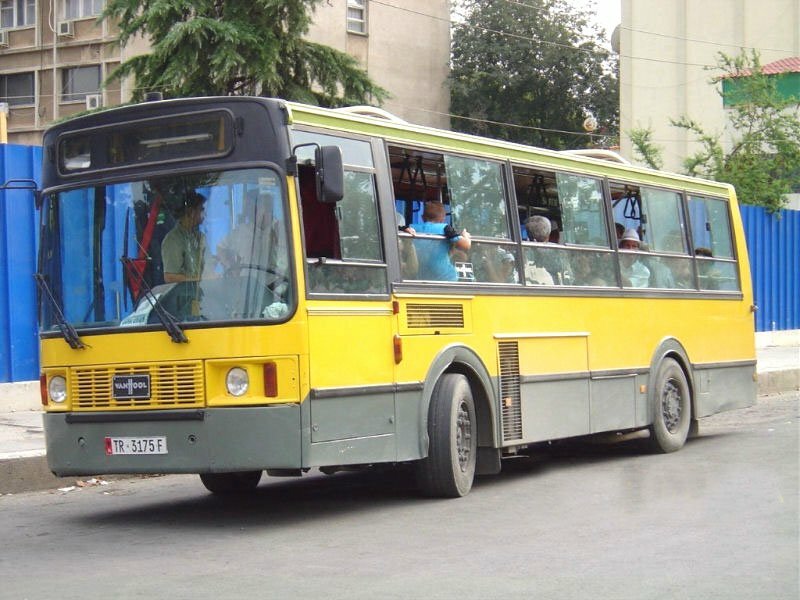 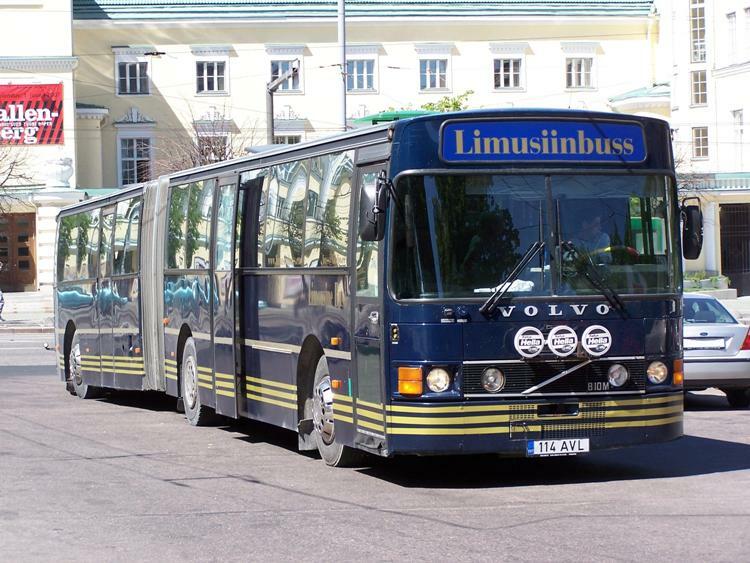 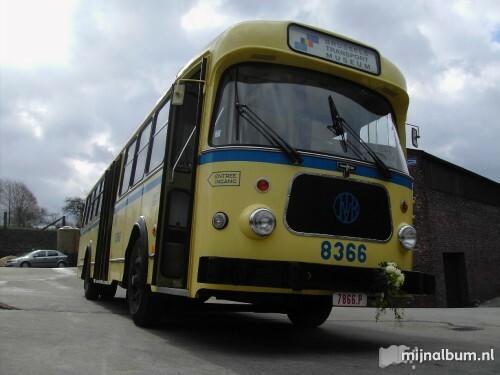 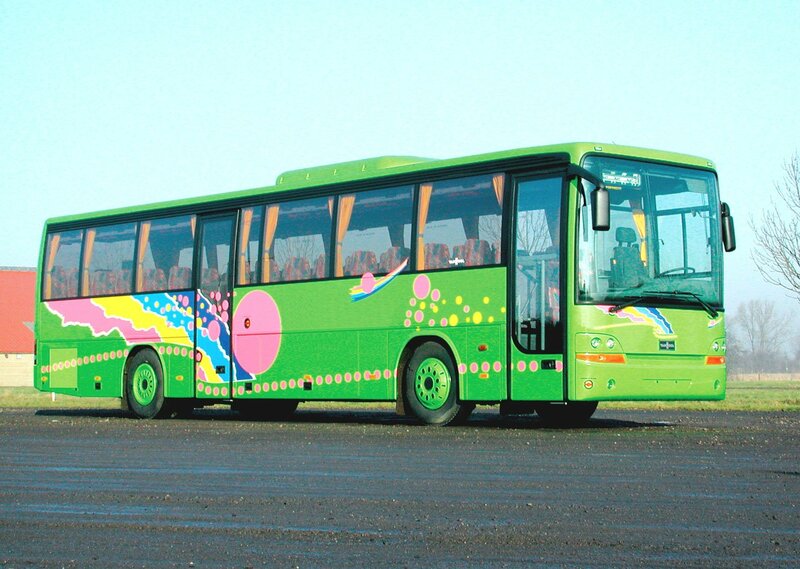 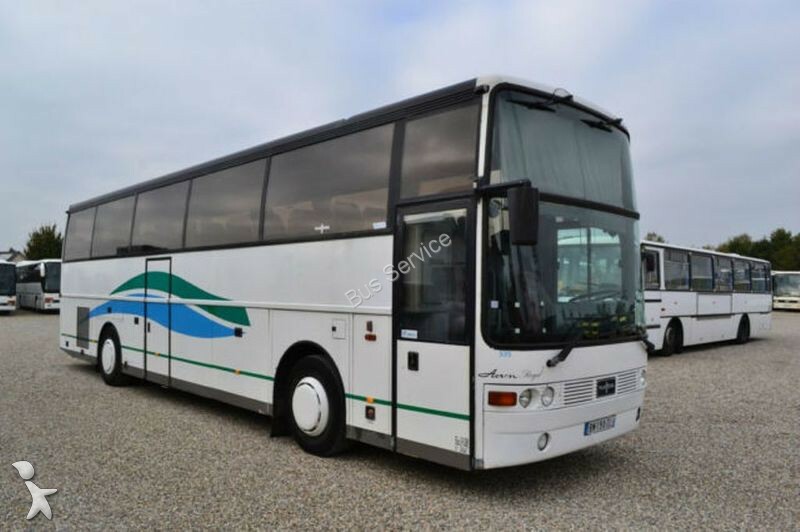 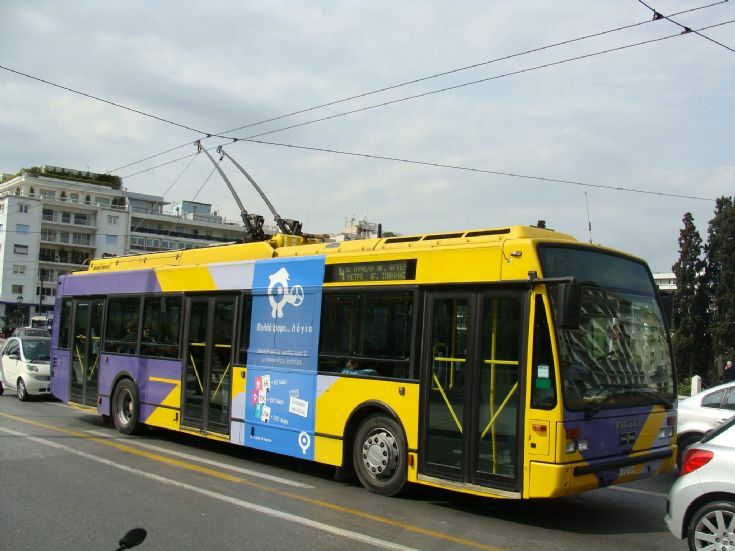 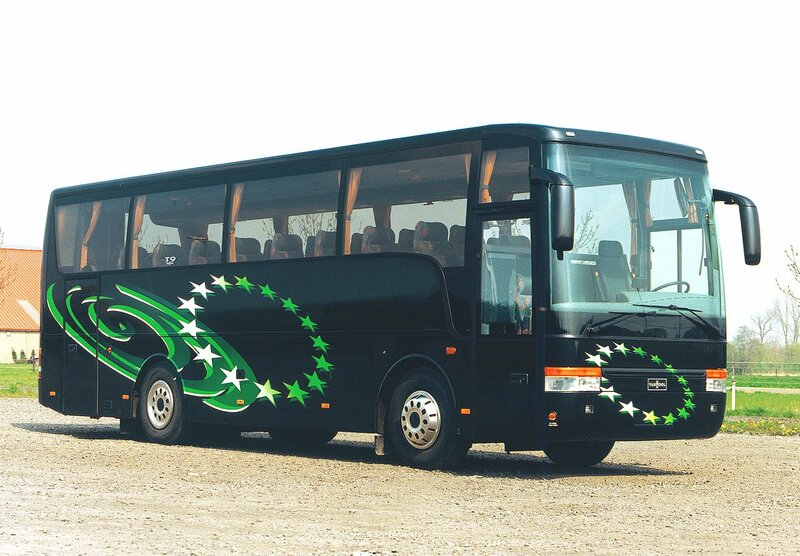 It is produced in the Van Hool factory in Skopje, the capital of the Republic of Macedonia. 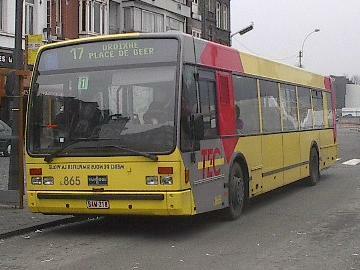 Macedonia is considered to be alow-wage country where production costs are much lower than in Belgium. 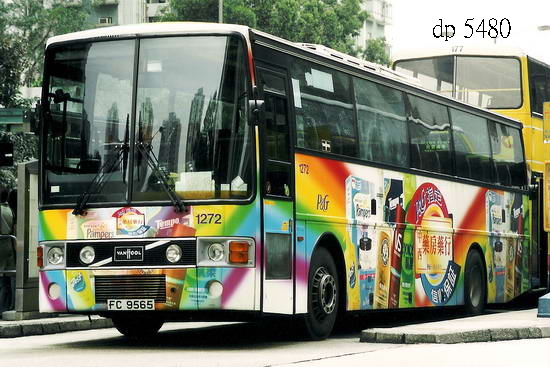 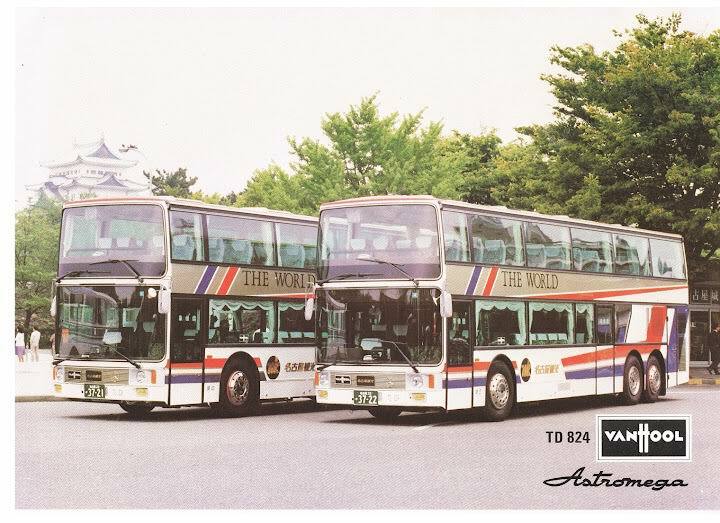 TD925 double-decker coach, and the A-series transit buses. 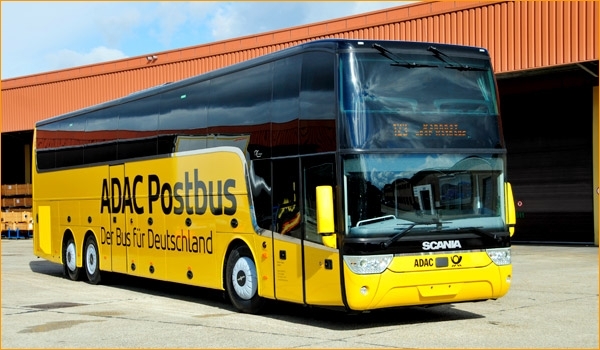 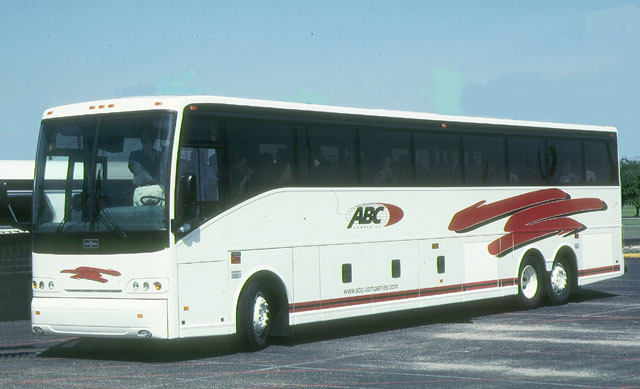 Van Hool’s exclusive dealer in the US is ABC Companies. 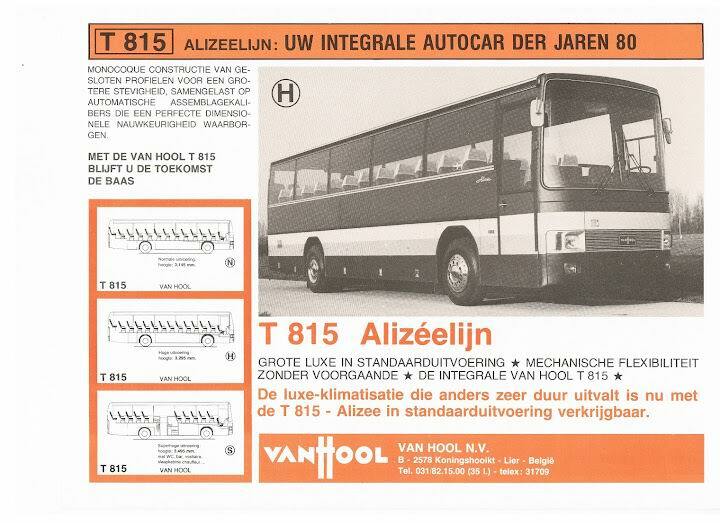 The T815 was first introduced to the US market in 1987. 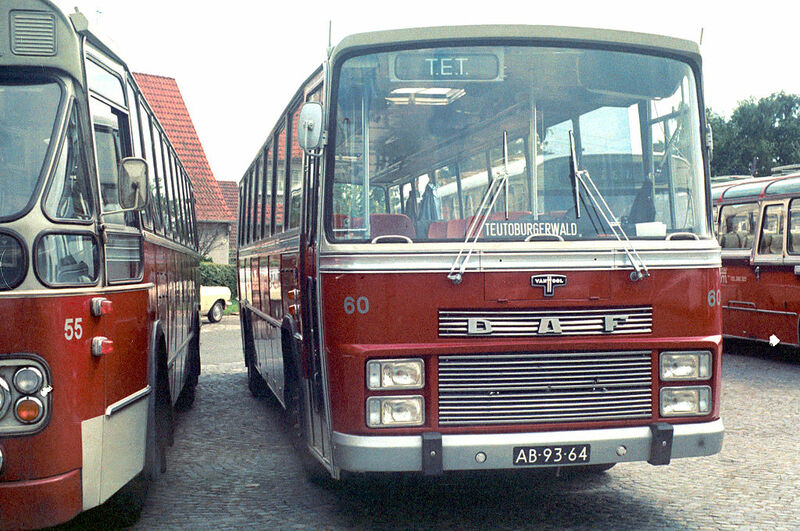 Later subsequent models are collectively known as the T8 series. 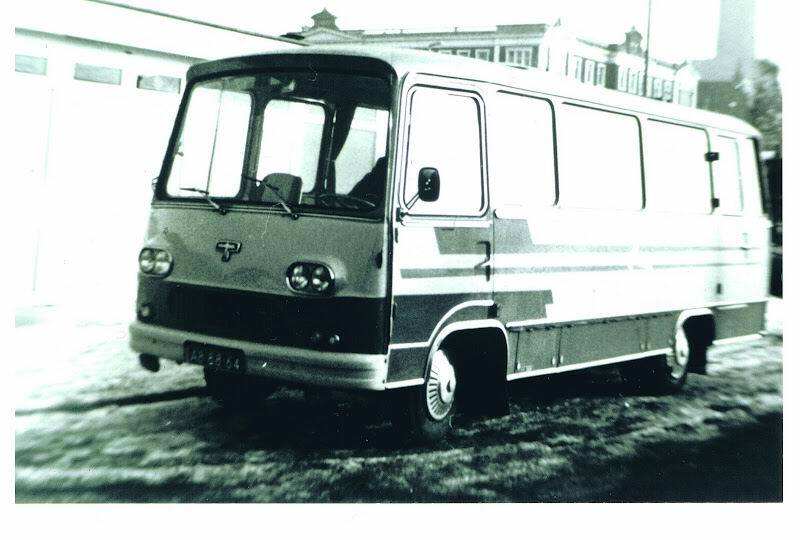 The earliest use Cummins L10 diesels. 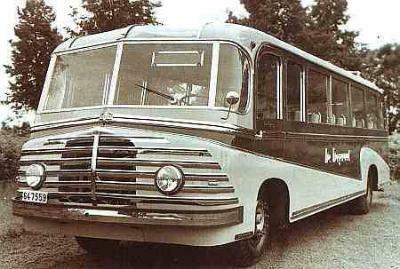 Later versions use Cummins M11 diesels. 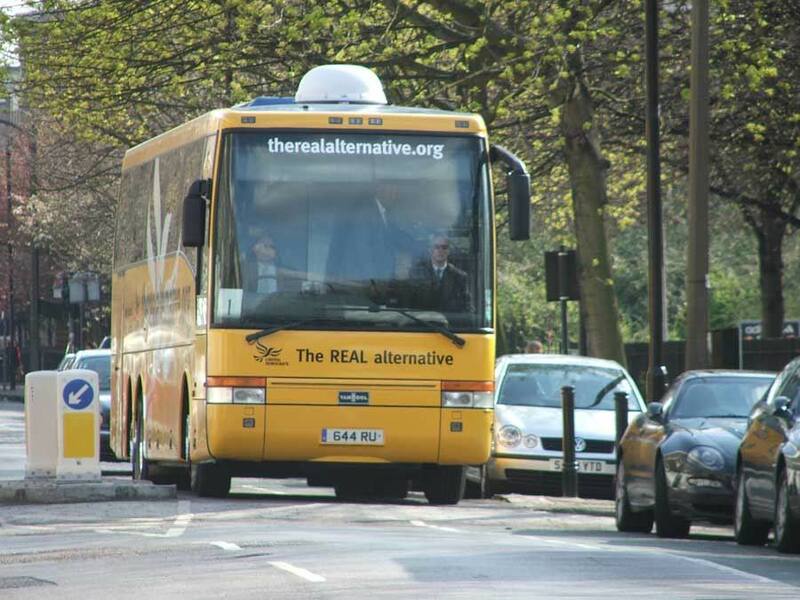 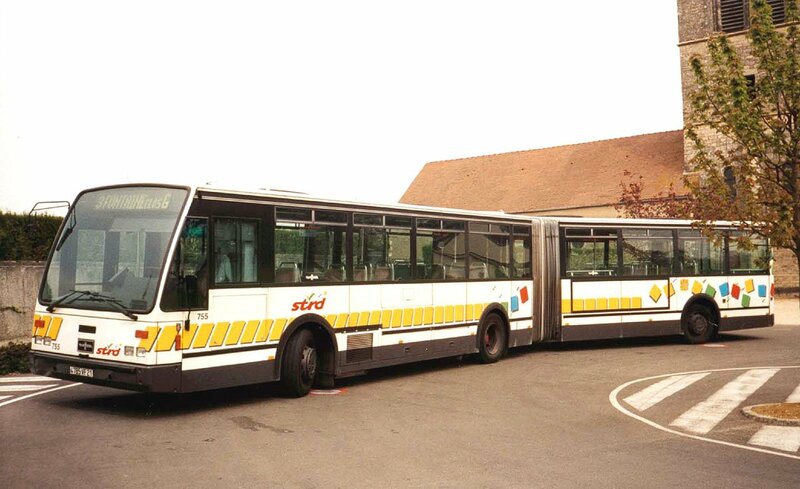 It was available as 30, 40 and 45 foot length versions. 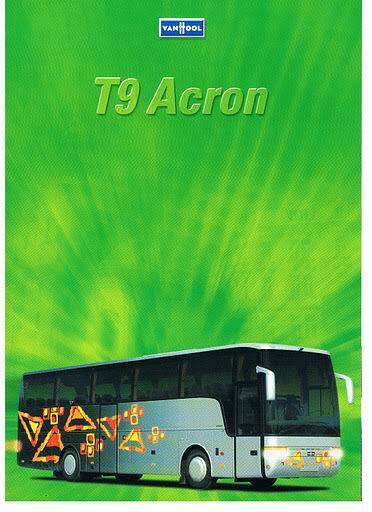 T9 series are almost identical to the T8 series visually, and are largely identical mechanically as well, except for incremental updates. 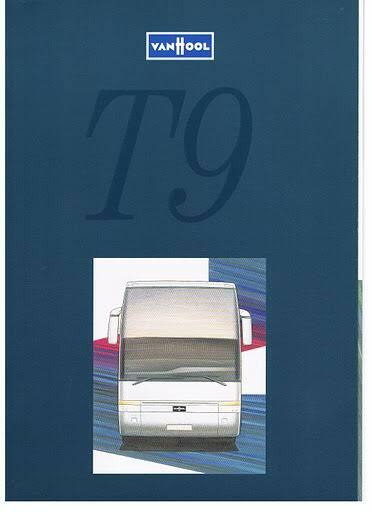 T9 series upgraded the suspension airbags to larger heavy-duty versions, as well as upgraded front axle to disc brakes instead of drum brakes. 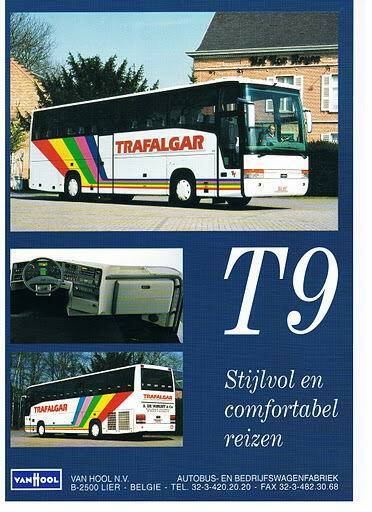 However, many of the earliest T9’s indeed lack these upgrades. 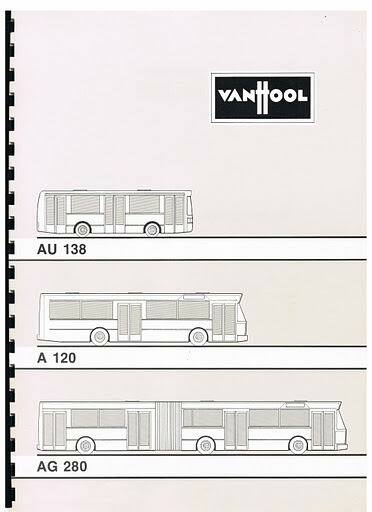 What’s even more interesting, Van Hool’s VIN consider T8 and T9 to be the same family. 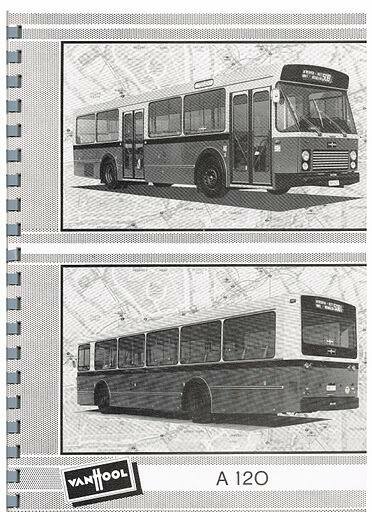 It was available as 40-foot (T940) or extended 45-foot (T945) versions. 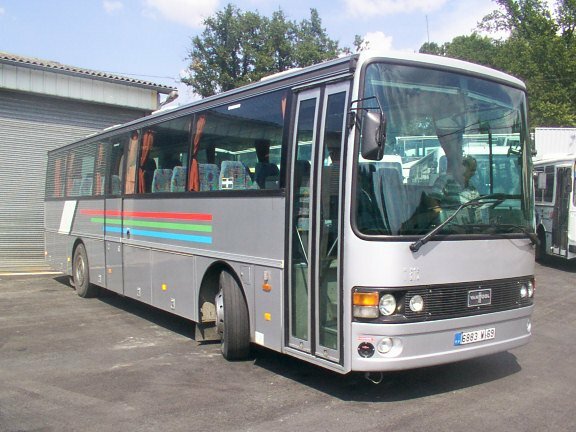 Introduced in 1996 and based on the European T9 platform, the T21 series features an updated stream-line design and more engine choices. 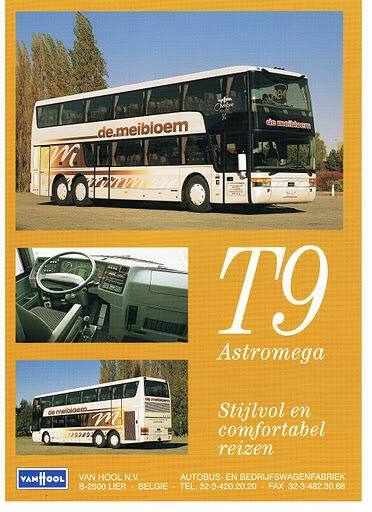 Whereas T8 and T9 series are almost exclusively powered by Cummins diesel engines, T21 are available with Cummins M11 plus engine, Detroit Diesel series 60 engine, or the latest Caterpillar C13 ACERT “clean diesel” engine. 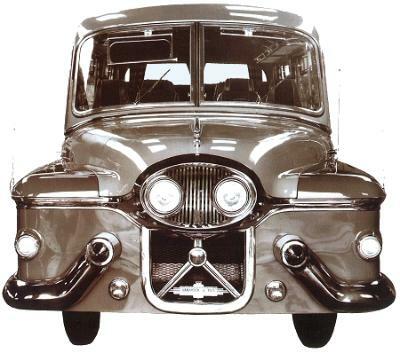 Most recent versions simplified the windshield into 2 panes only, replaced headlight assemblies with individual projector lamps, and consolidated the driver console. 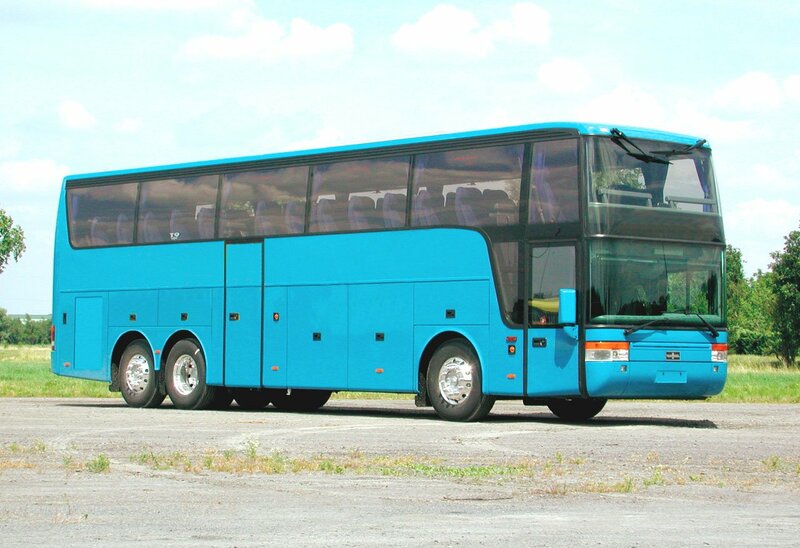 Available as 40-foot (T2140) or extended 45-foot (T2145) versions. 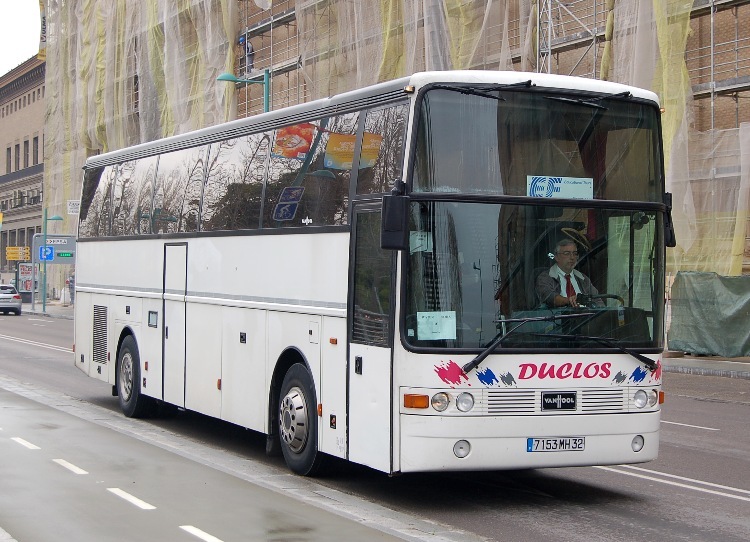 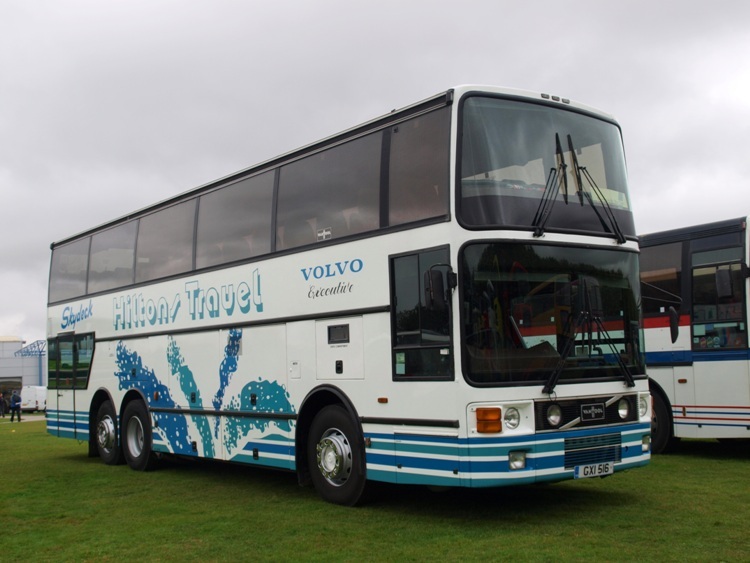 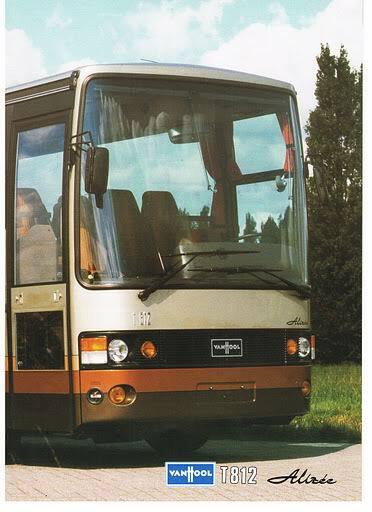 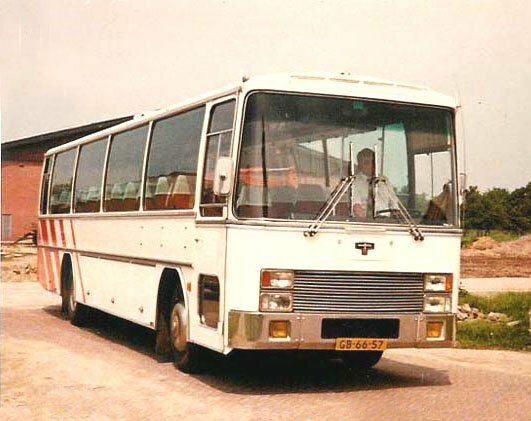 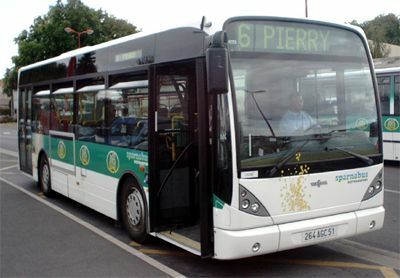 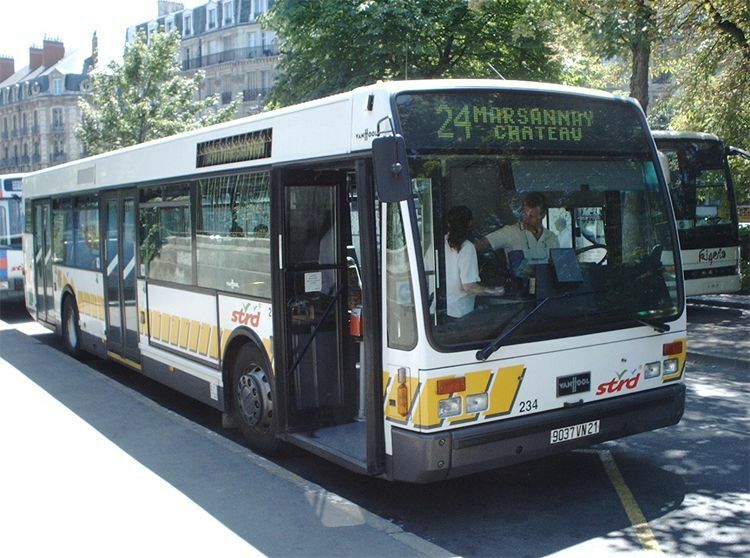 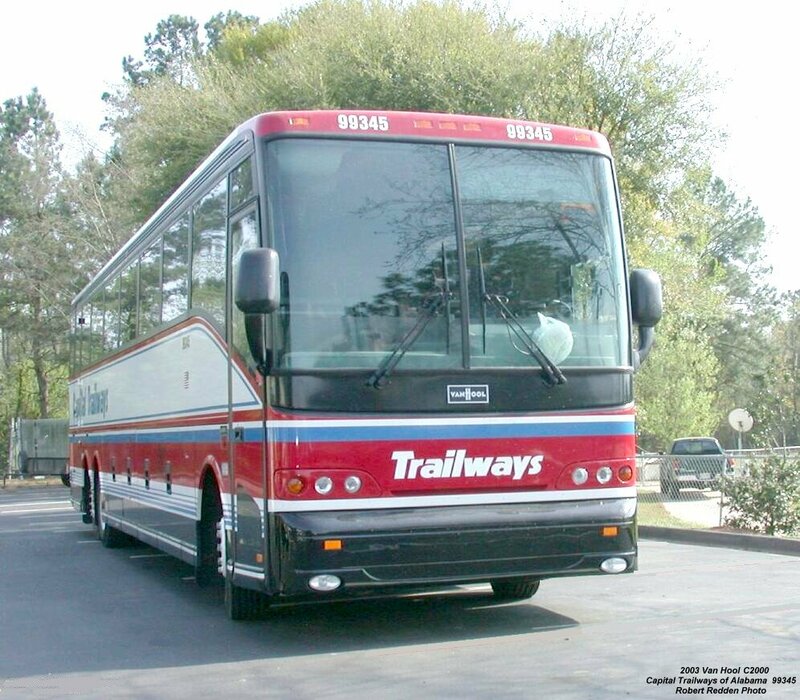 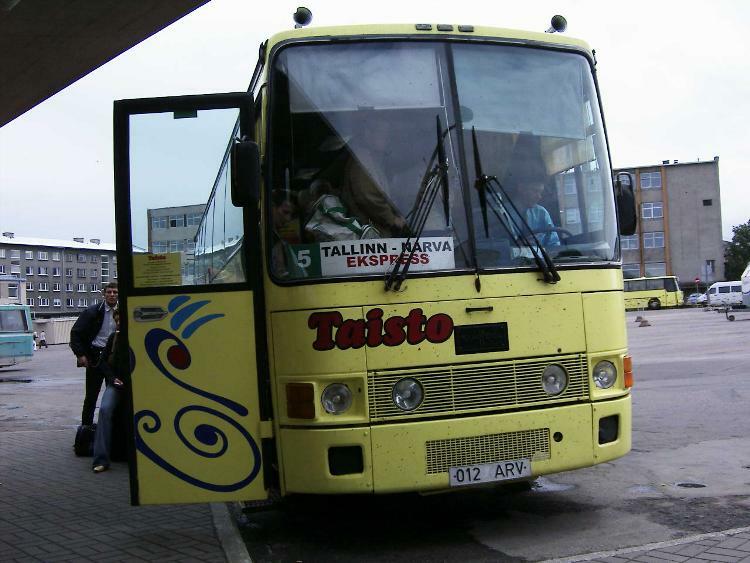 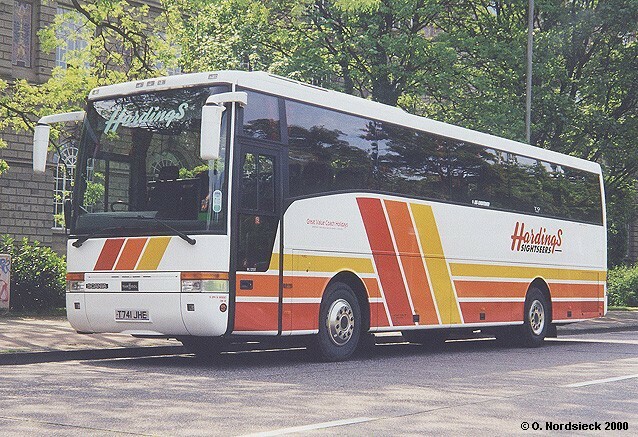 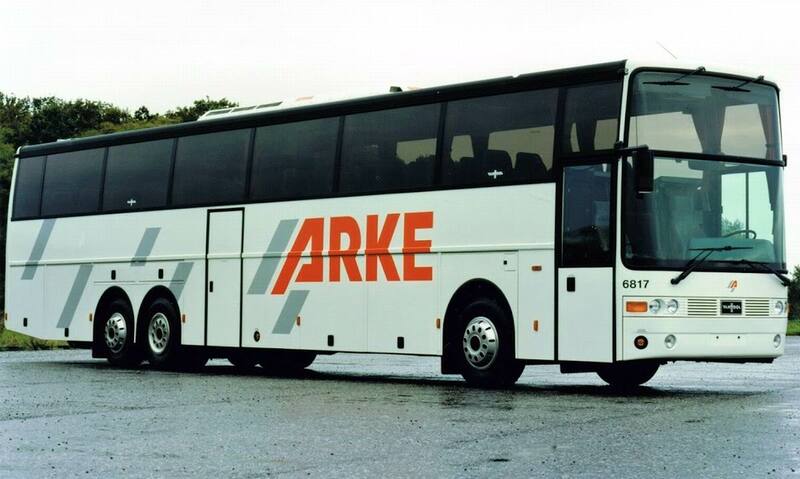 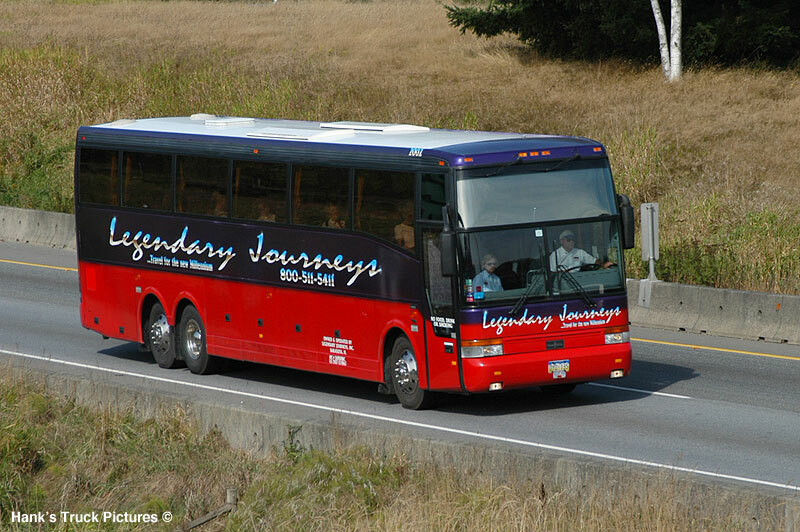 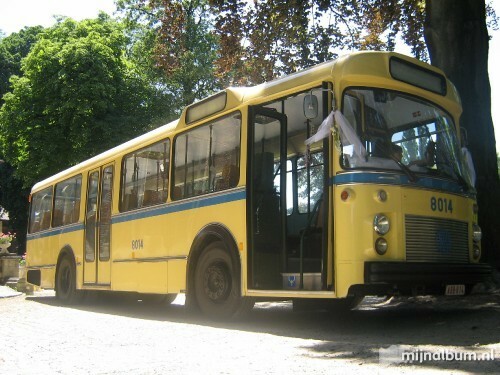 Introduced as a lower-cost coach intended for long-line duty, the C20 series, with similar European looks to the T21 series, was introduced in 2000 to the US market. 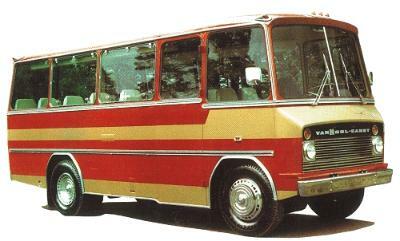 C20 is available with Cummins ISX12 or Detroit Diesel DD13 engine. 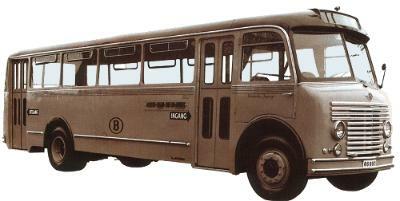 Previous generations could also be equipped with Cummins M11 plus, Detroit Diesel series 60 and Caterpillar C13 engine. 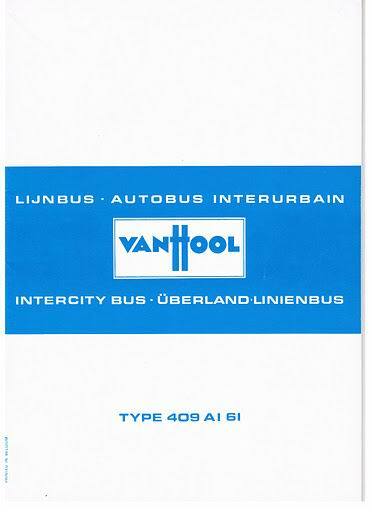 Both Allison B500 automatic and ZF AS Tronic automated gearboxes are available. 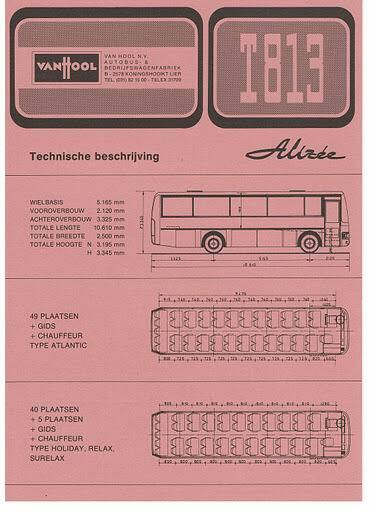 Available as extended 45-foot (C2045) version only. 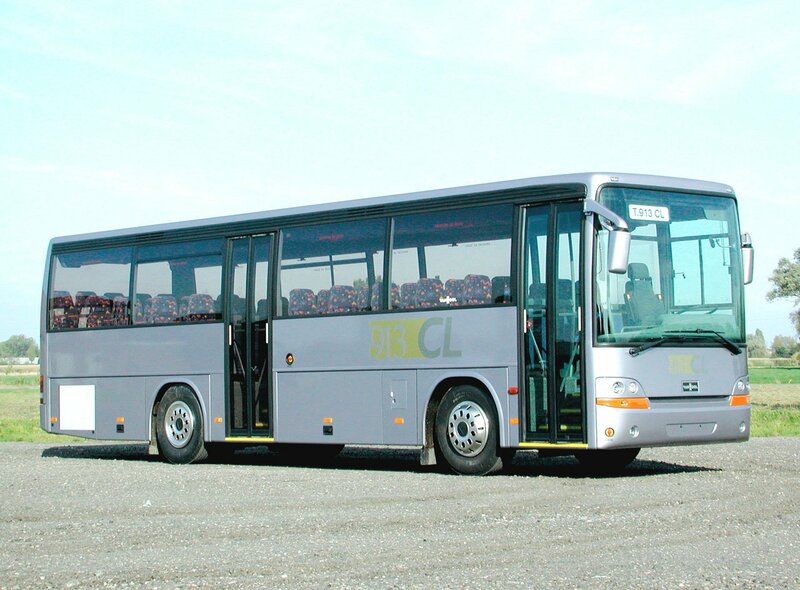 Current model is C2045E. 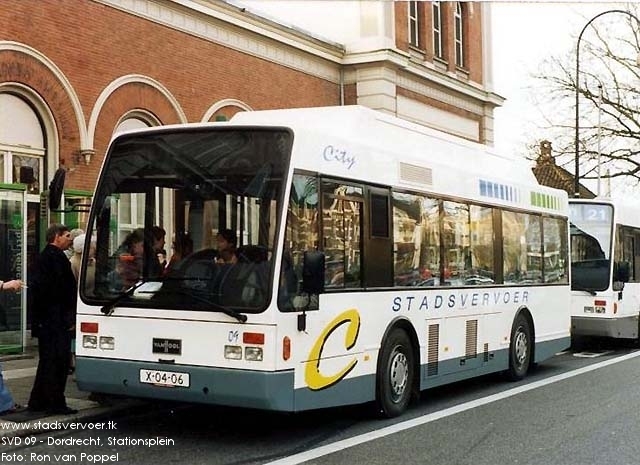 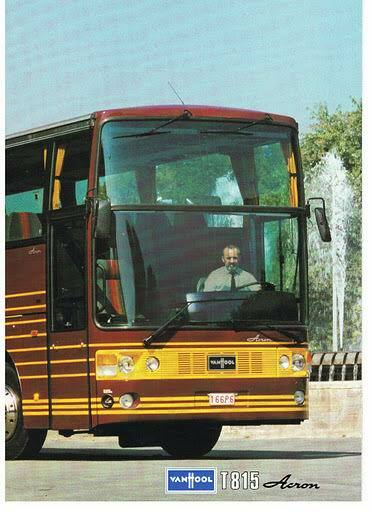 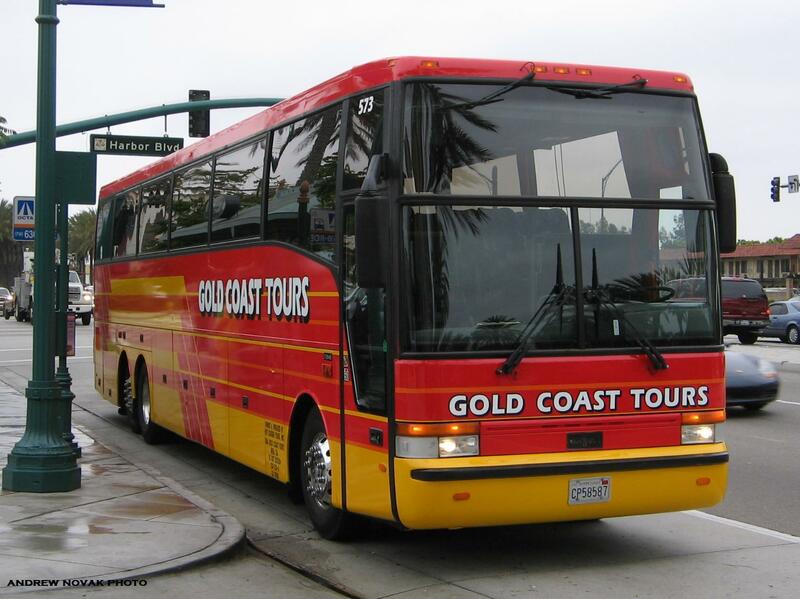 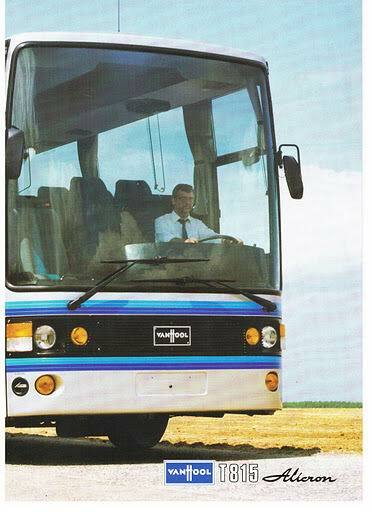 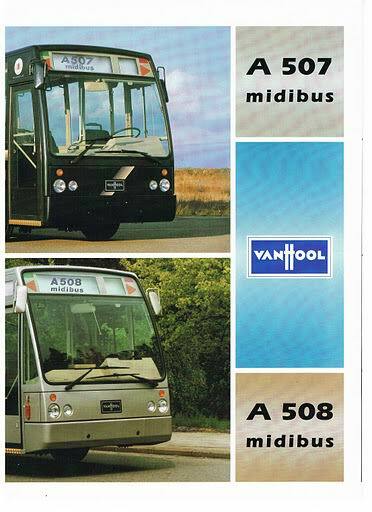 The popularity of A3 series in Europe led Van Hool and ABC to partner with AC Transit (Alameda and Contra Costa counties, California) to demo the A3 series as a future transit alternative in 2002. 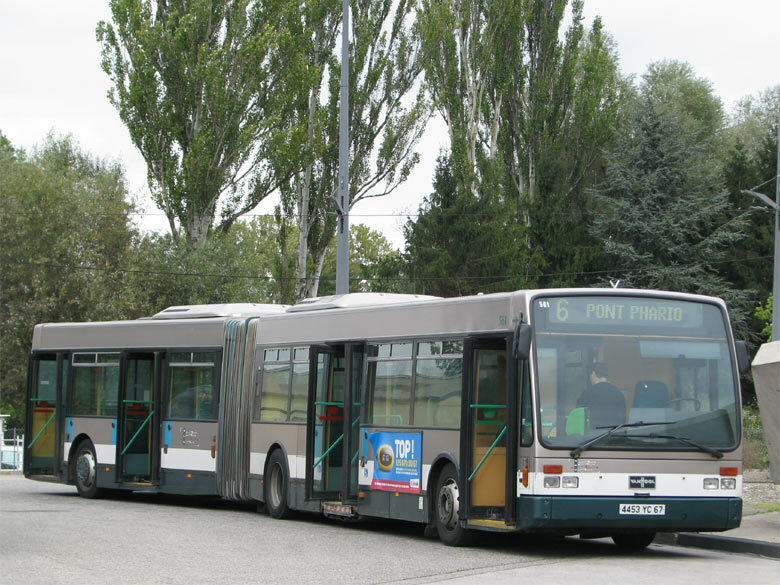 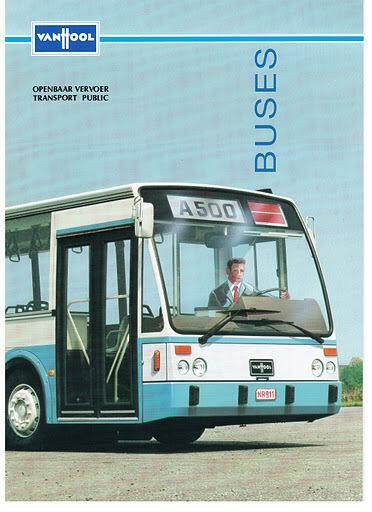 The A330 and AG300 low floor transit coaches formally entered service in AC transit fleet in June 2003. 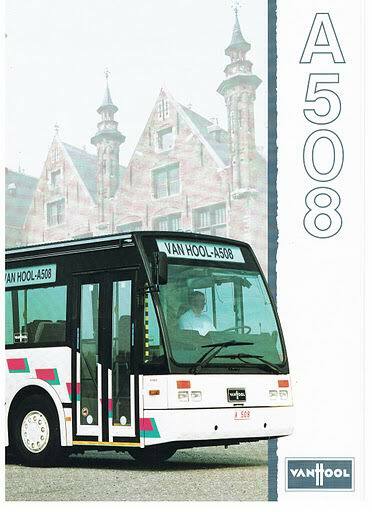 AC Transit now has over 330 Van Hool buses either in its fleet or on order as of August 2009. 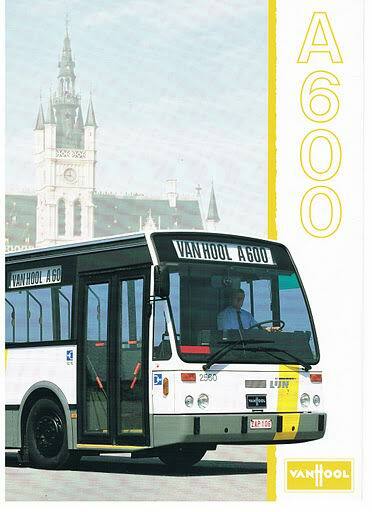 Van Hool is building 16 hydrogen fuel cell buses for the USA at present (August 2009). 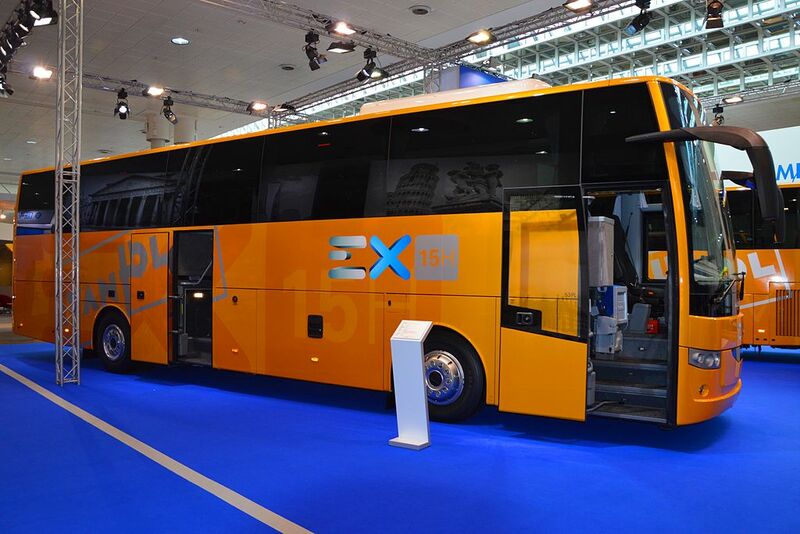 These buses are powered by fuel cells from UTC Power and lithium batteries from EnerDell. 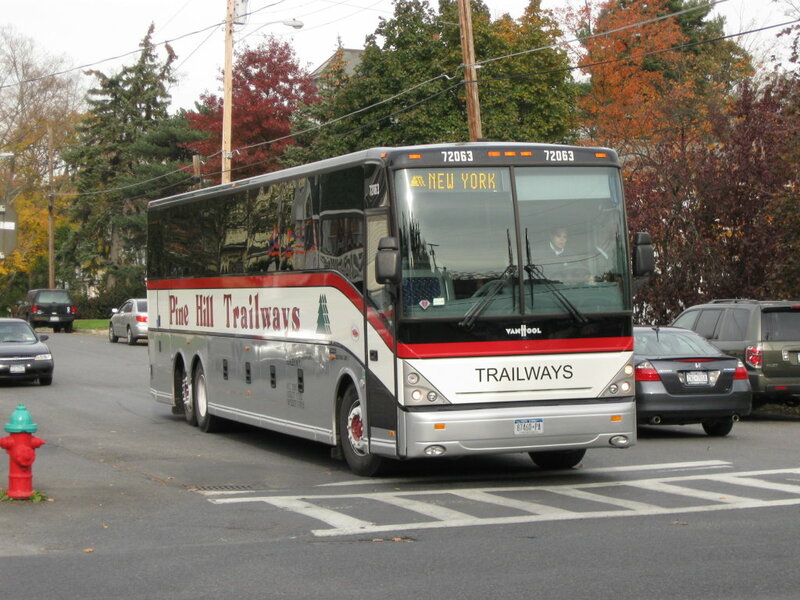 Twelve of the buses are being purchased by AC Transit and four by CT Transit of Hartford Connecticut. 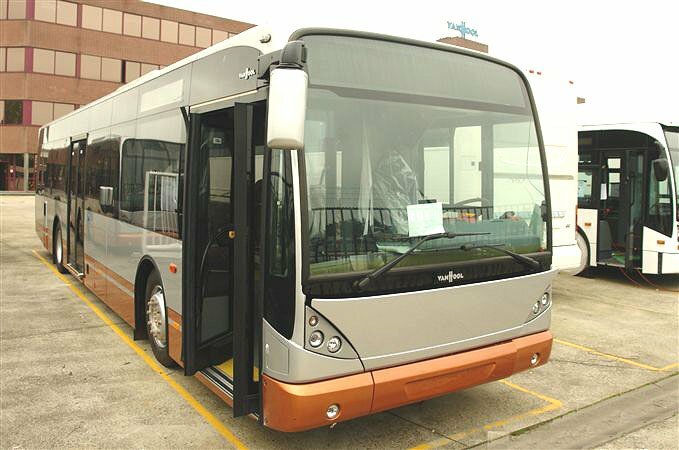 This project is unusual in that the buses have been designed from the ground up as fuel cell buses and are designed, built, and integrated by a single manufacturer. 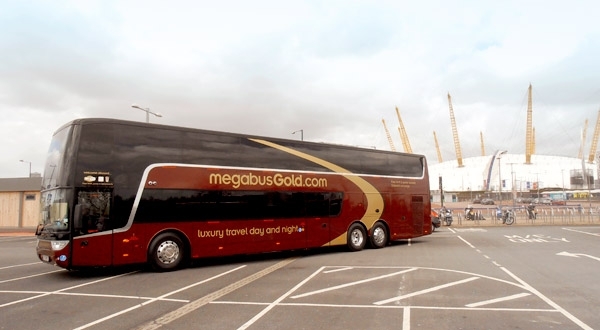 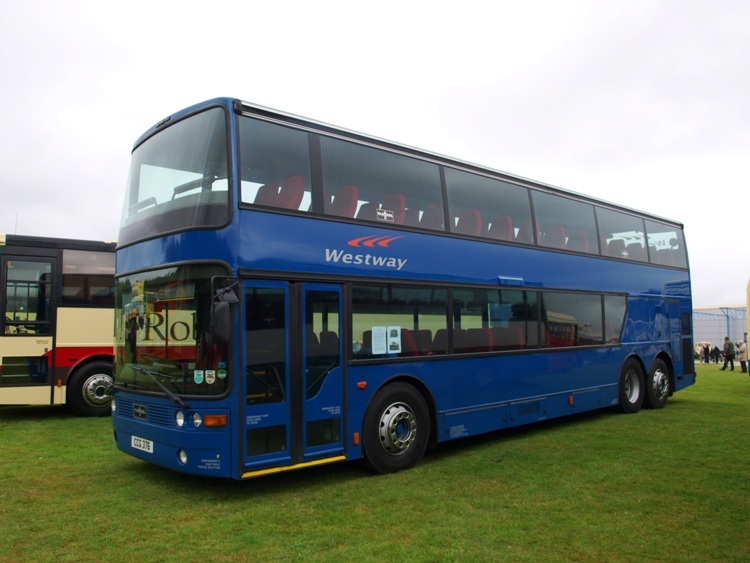 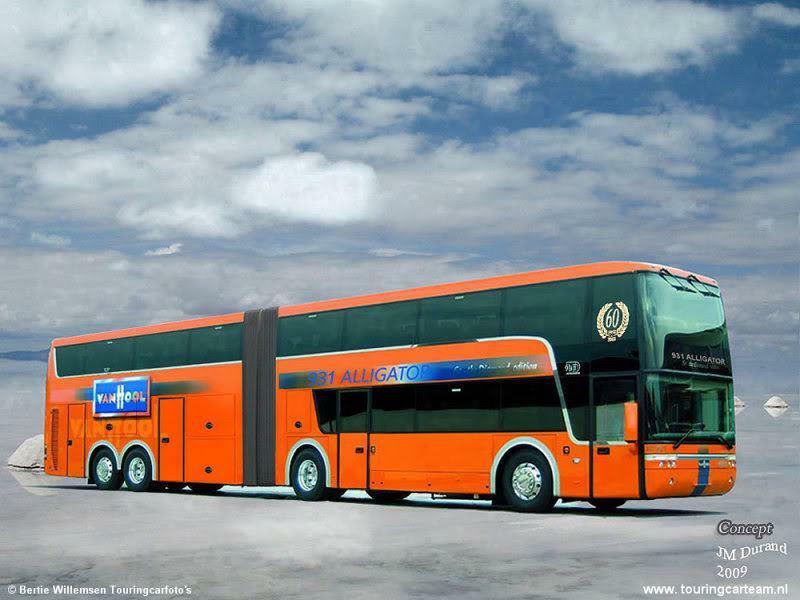 The AG300 is an articulated 60-foot bus, while the A330 is a 40-foot bus. 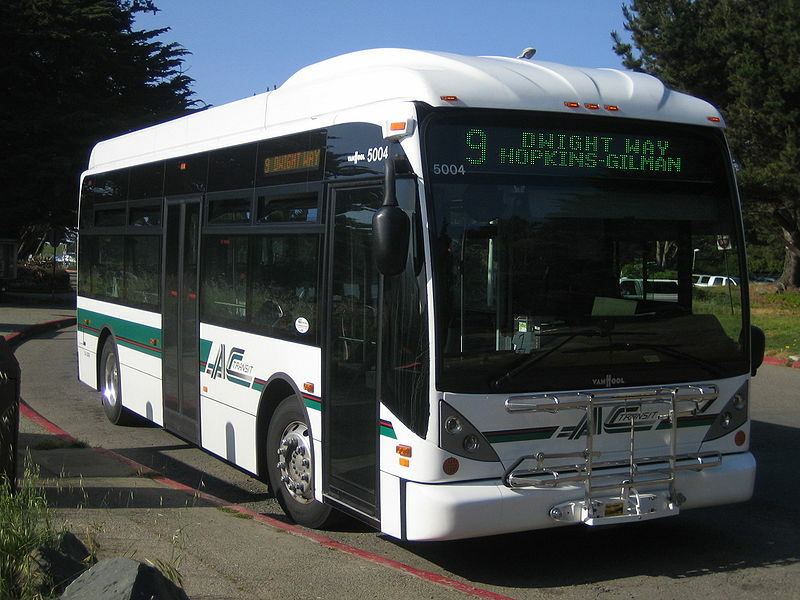 In 2008, AC Transit took delivery of a fleet of new model A300L forty-foot buses. 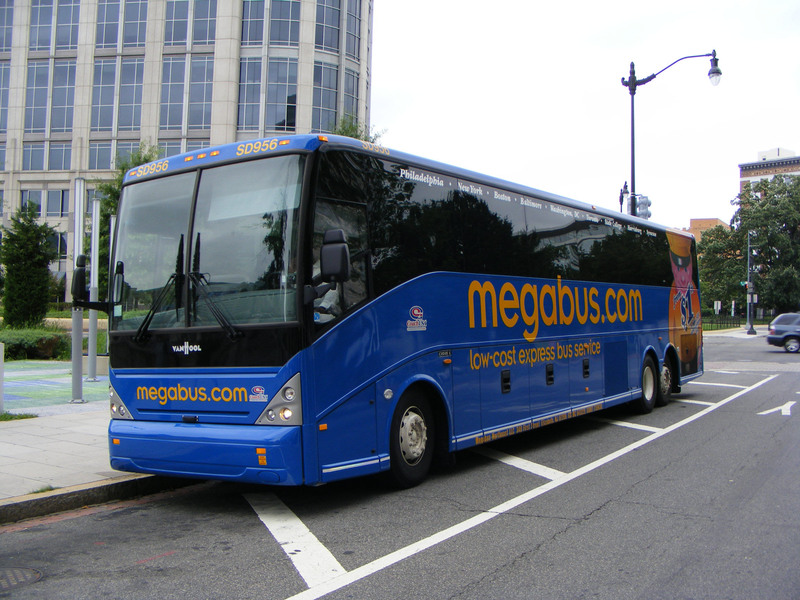 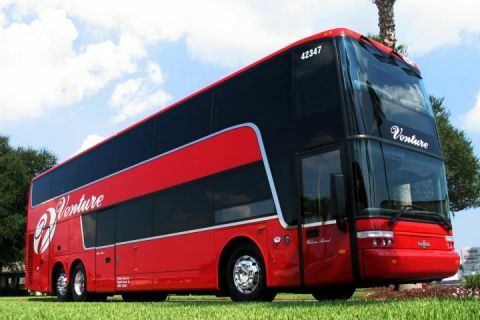 These buses are unique in the US market as they have their engines mounted in the wheelbase which makes their ride quality extremely stable and smooth. 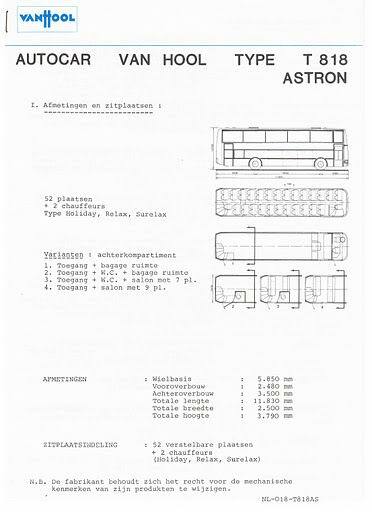 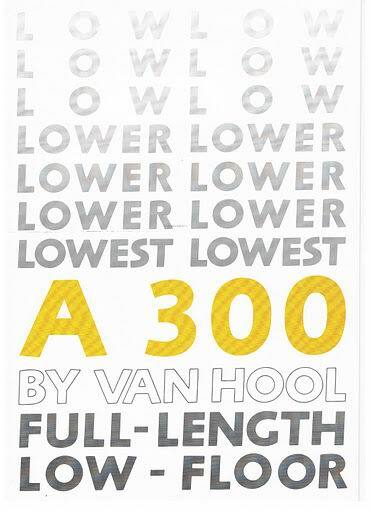 The new layout capitalizes on basic architectural design of the A300L’s earlier released little brother the 30-foot A300K (K stands for kort, “short” in Dutch and L for lang, “long”). 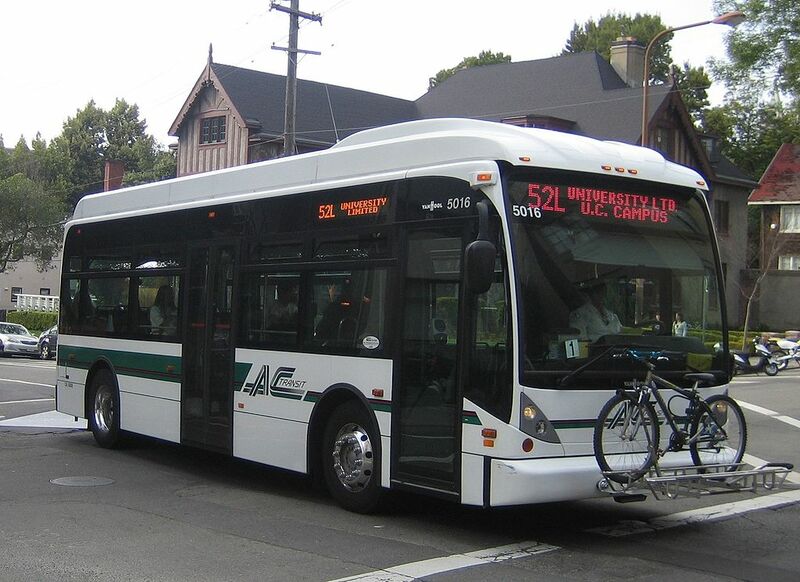 A recent survey of AC Transit riders overwhelmingly approves of the design and quality of the new buses. 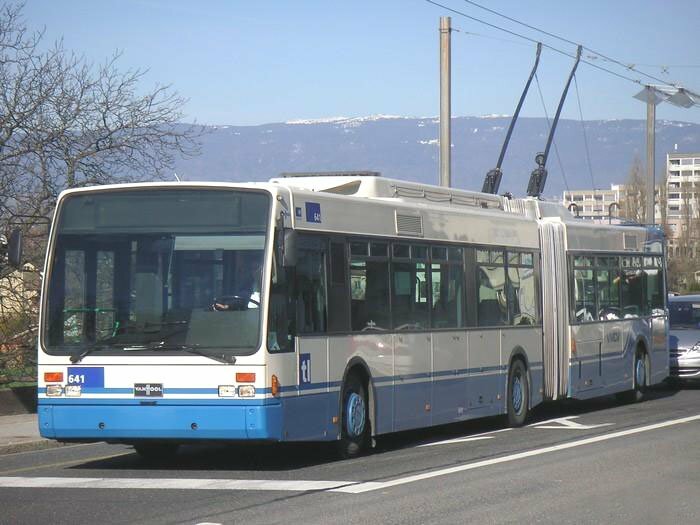 Salt Lake City (Utah Transit Authority) has purchased ten A300L 40-foot buses for its MAX Bus Rapid Transit system. 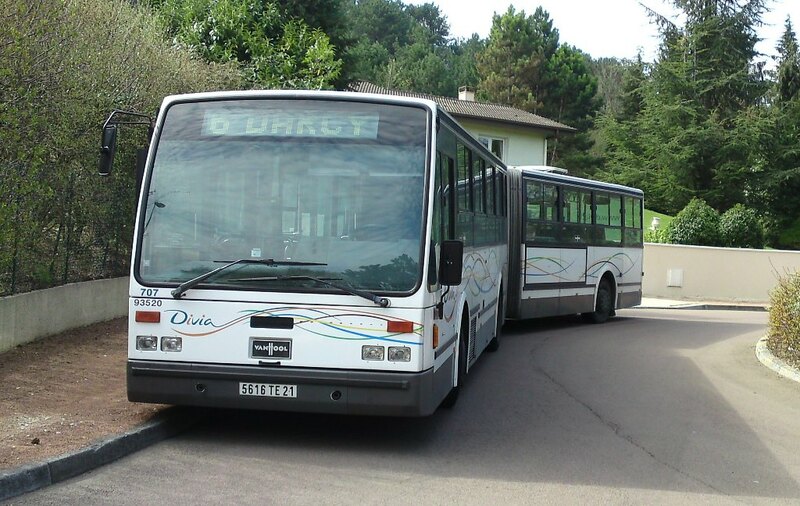 These buses differ from AC Transit’s A300Ls as they have three doors and are equipped for cold weather and high altitude operations. 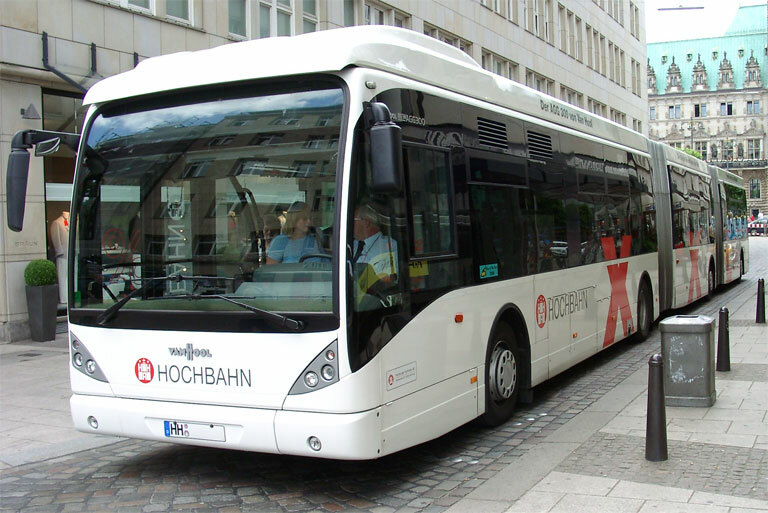 They have also recently placed an order for four more because of overwhelmingly positive support of the first 10 buses and the “MAX” BRT service they operate. 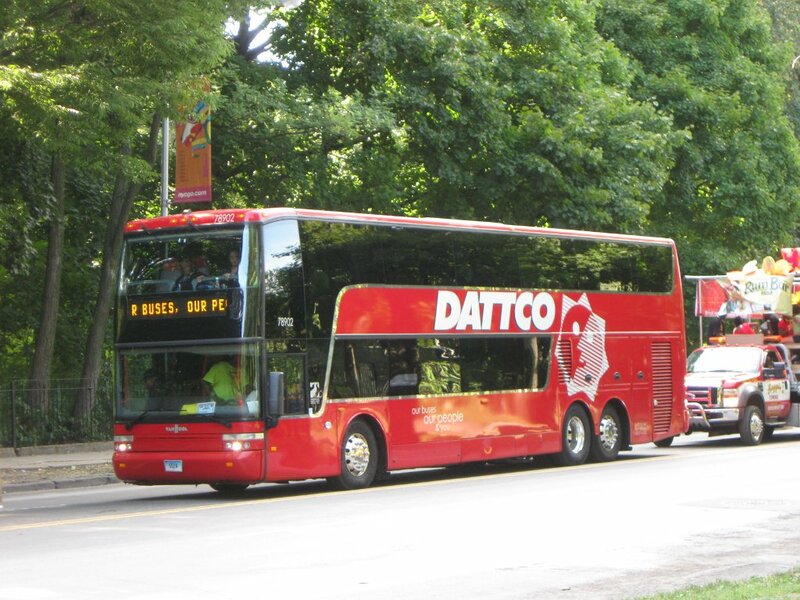 Washington, D.C.‘s Circulator uses the A330 buses. 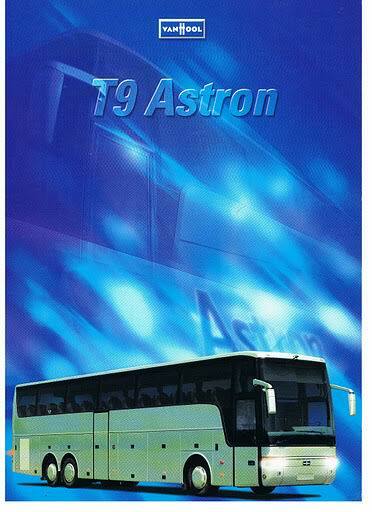 These 29 buses were purchased from AC Transit in 2005. 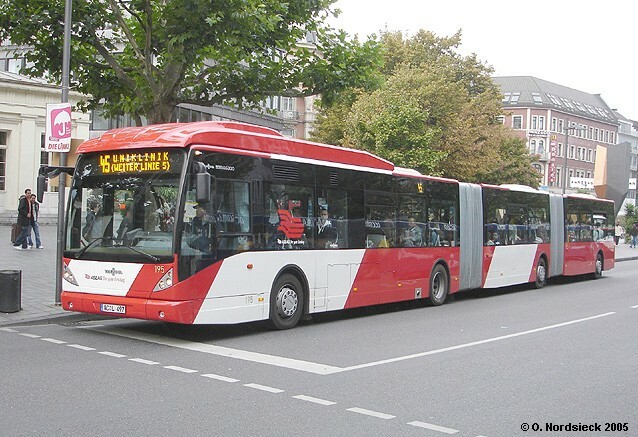 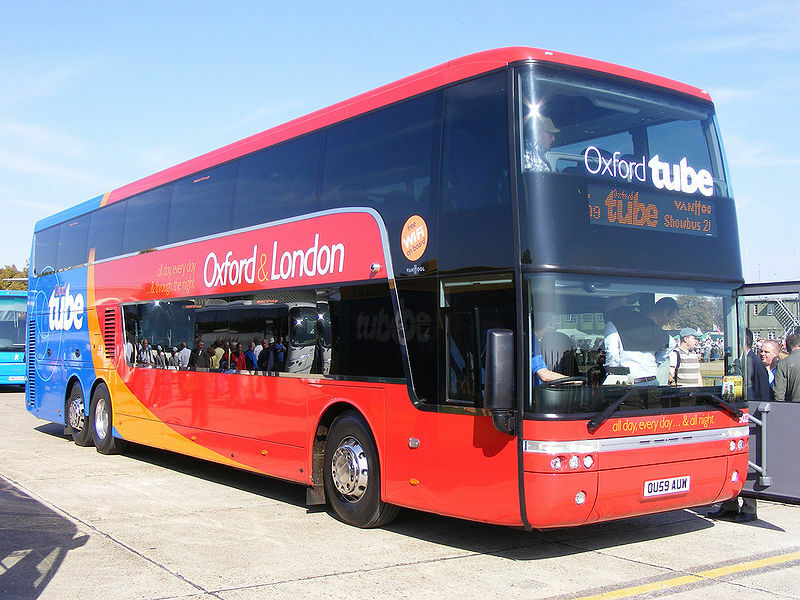 In addition to the A330 models, the Circulator now uses the new A300K buses, which first went into service in April 2009. 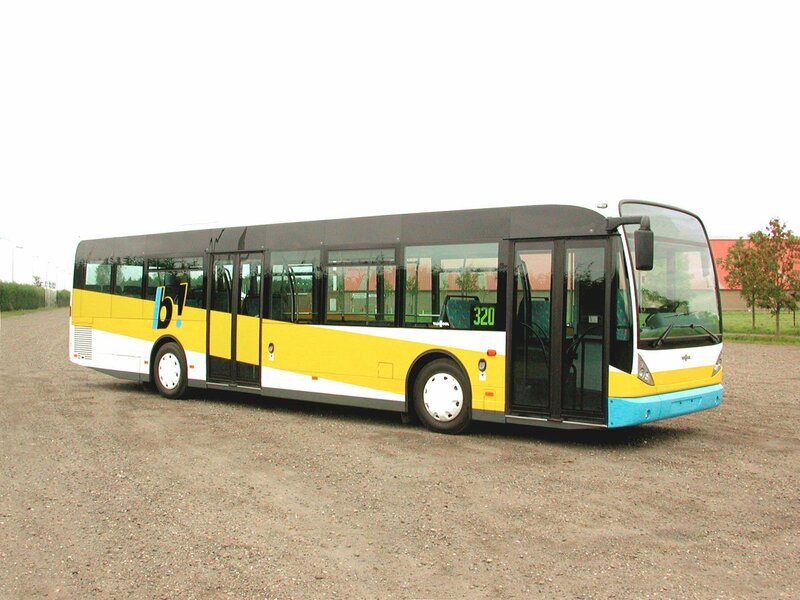 The Circulator recently took delivery of 14 A300K, 31-foot buses to build out its route structure. 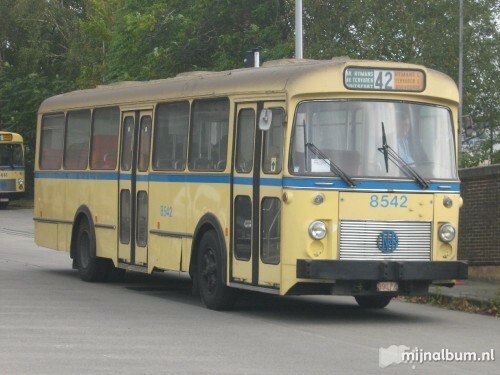 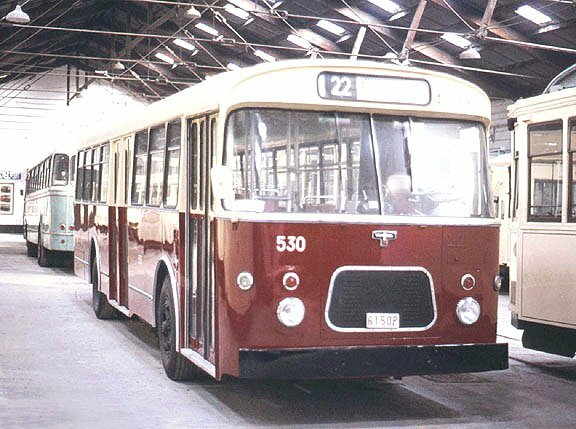 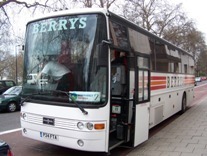 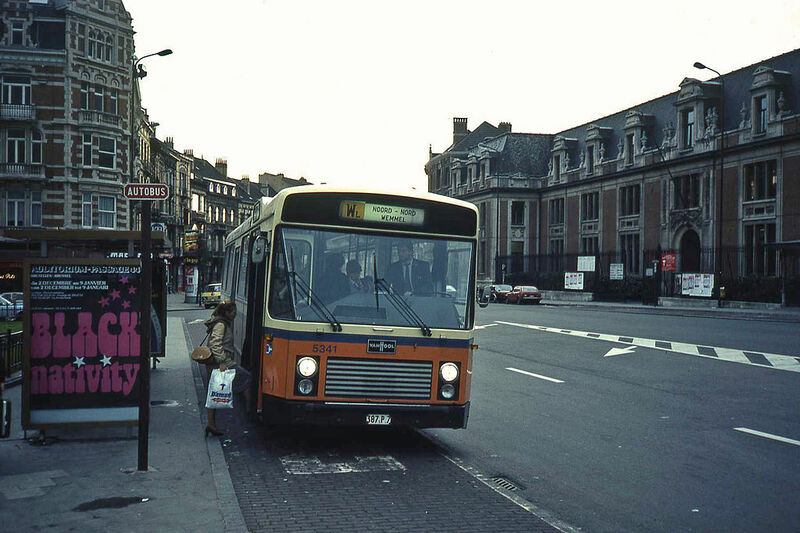 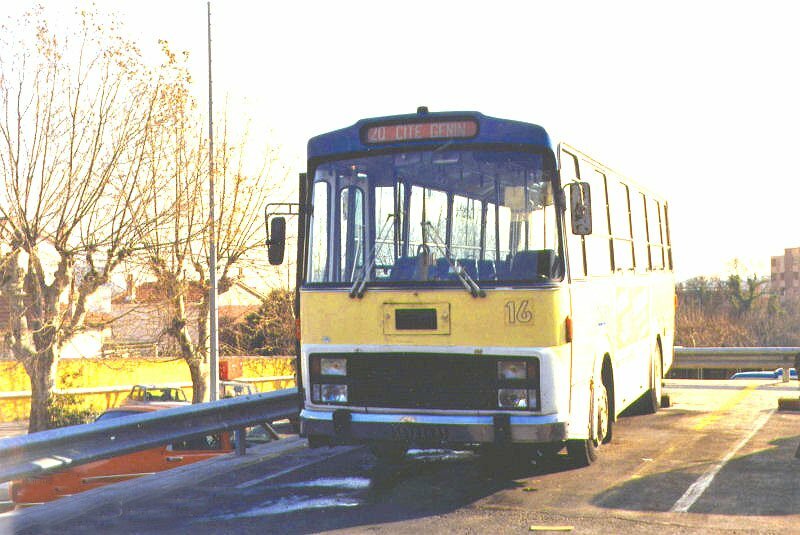 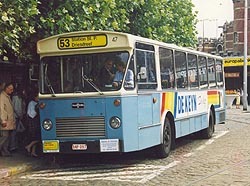 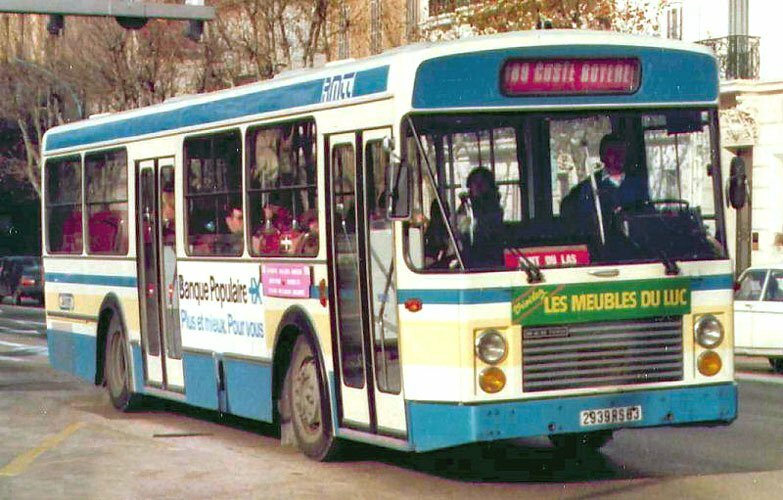 The A300K was chosen because of its unique ability to do the work of forty-foot buses for nearly all operations in the smaller envelope and with the smaller engine of a midi bus. 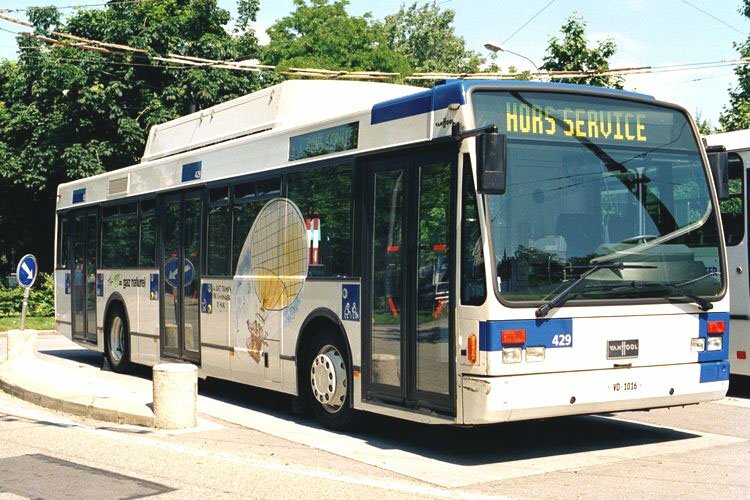 Baltimore, Maryland‘s Charm City Circulator have recently ordered and since put 5 A300Ls into service early 2011. 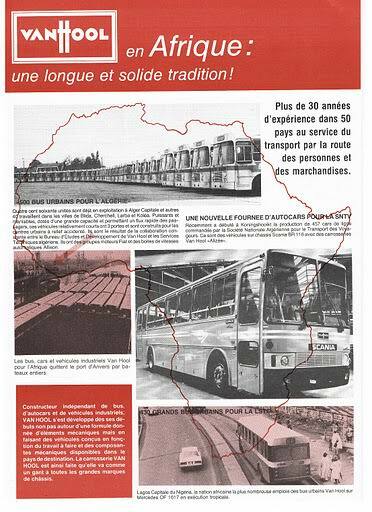 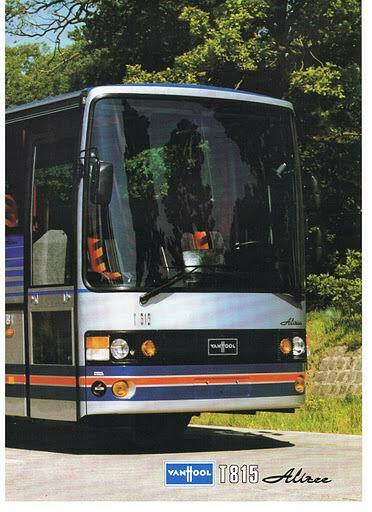 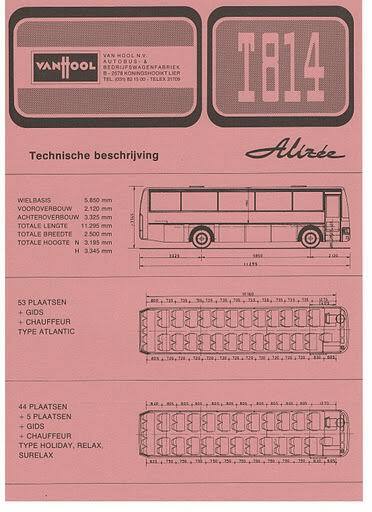 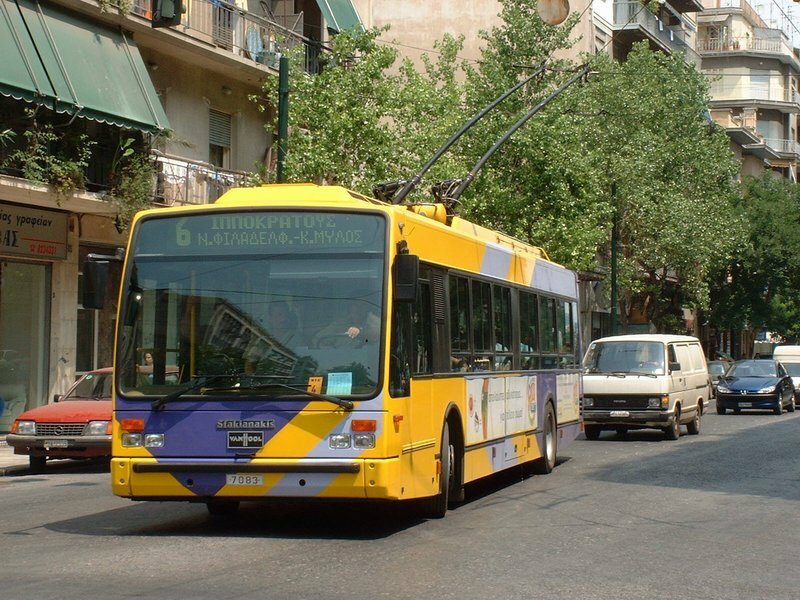 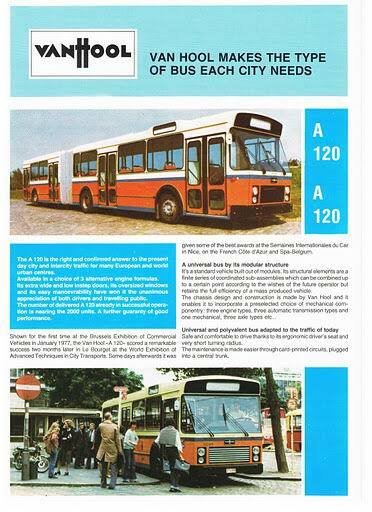 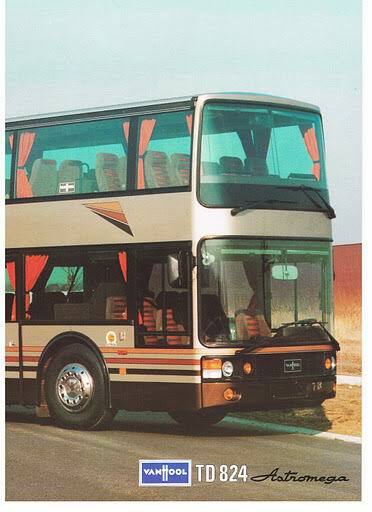 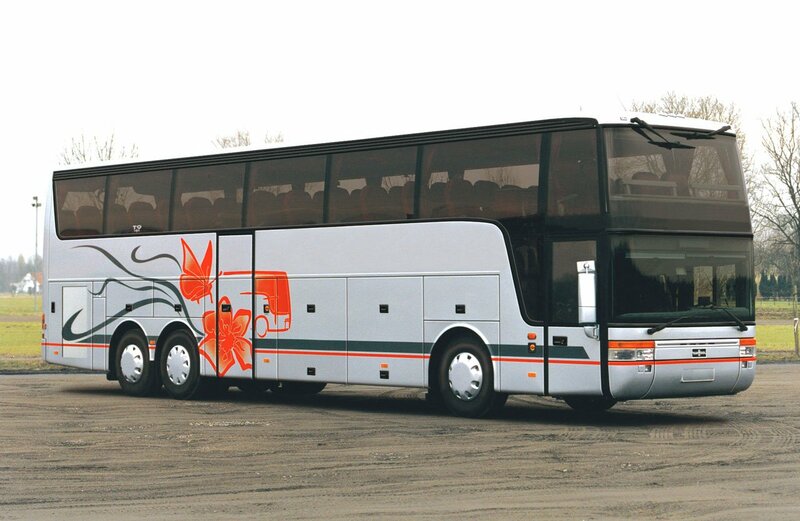 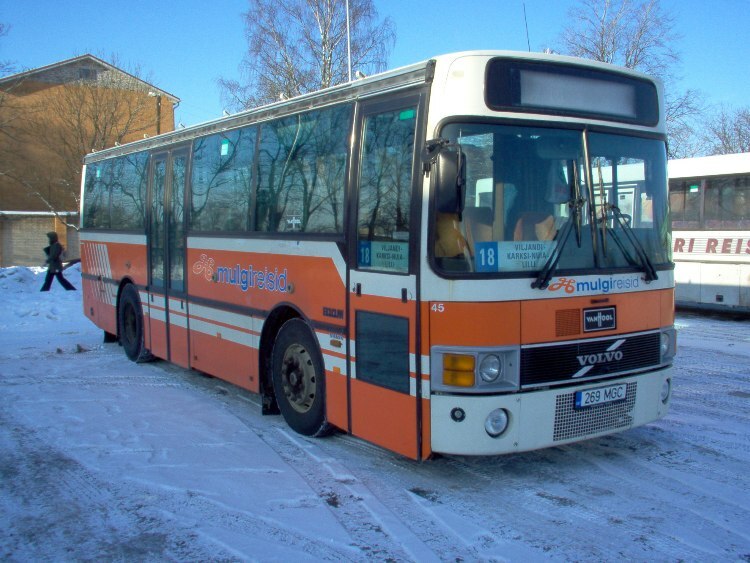 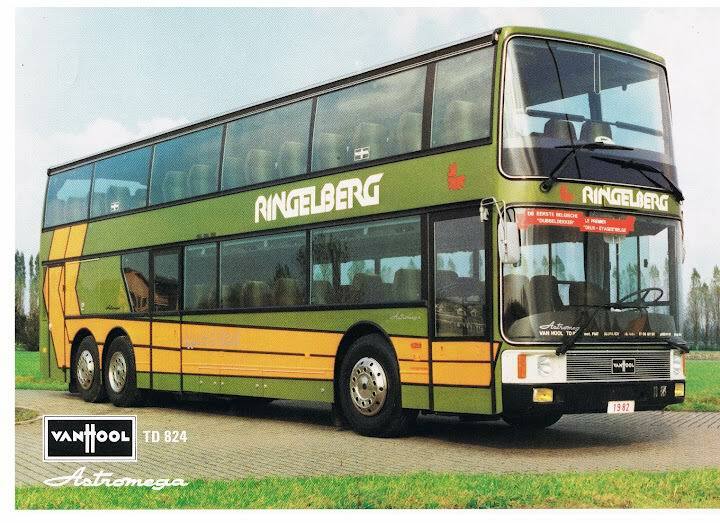 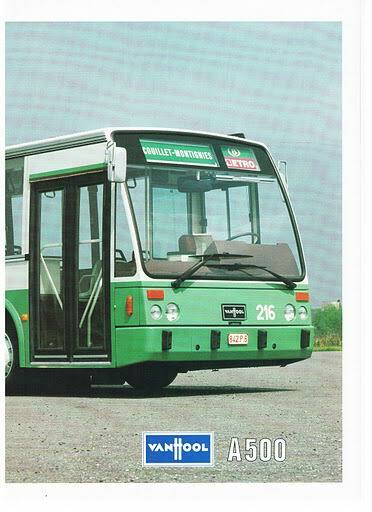 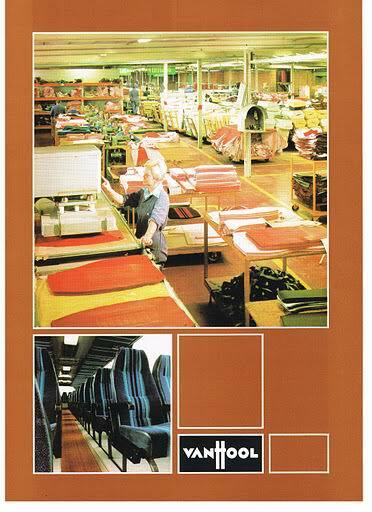 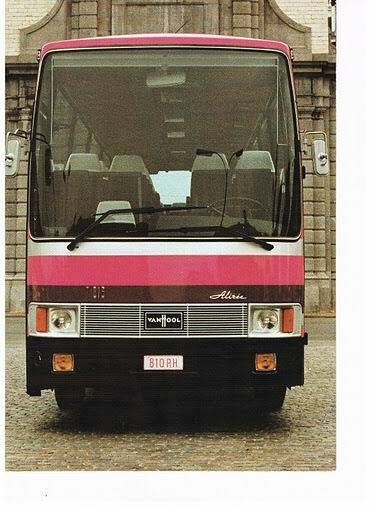 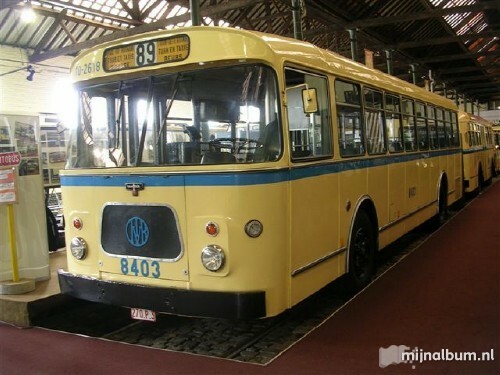 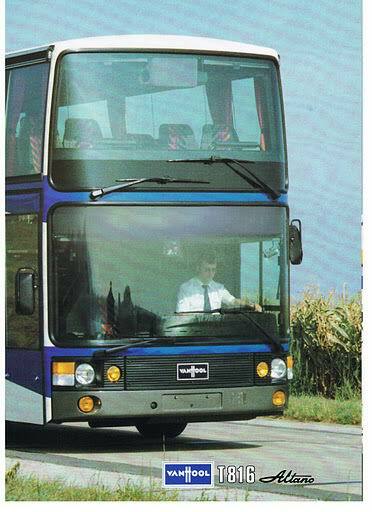 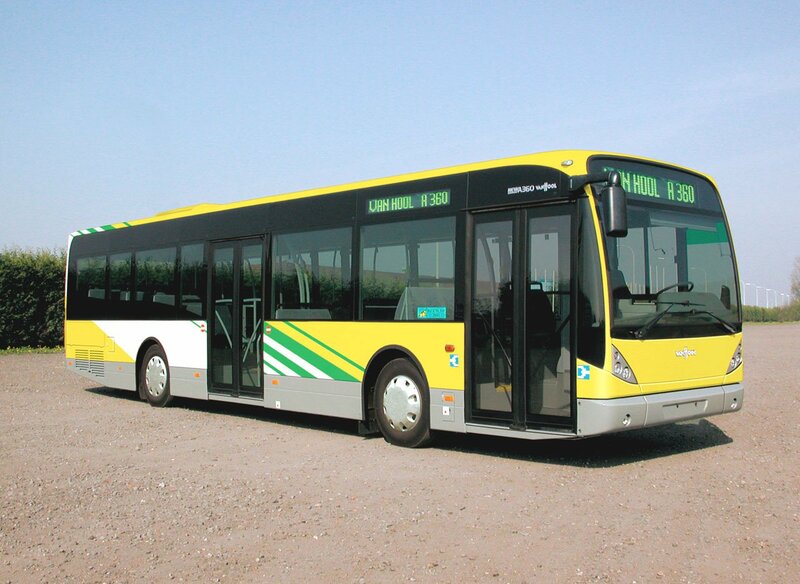 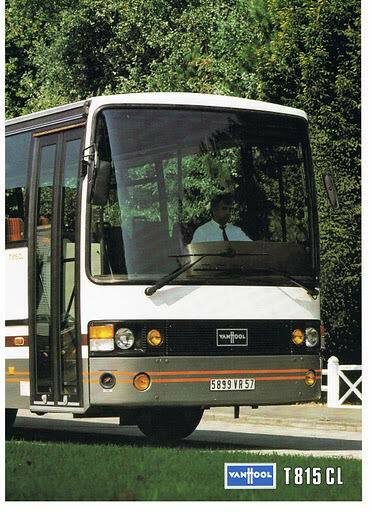 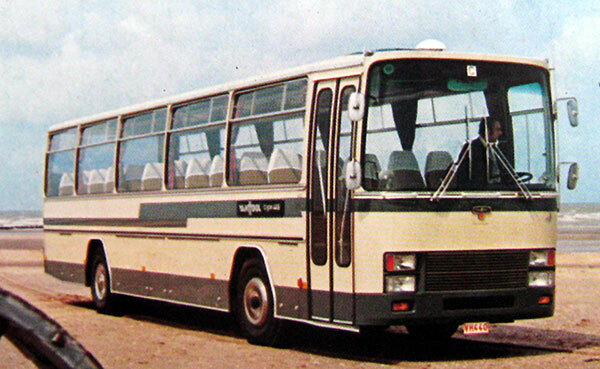 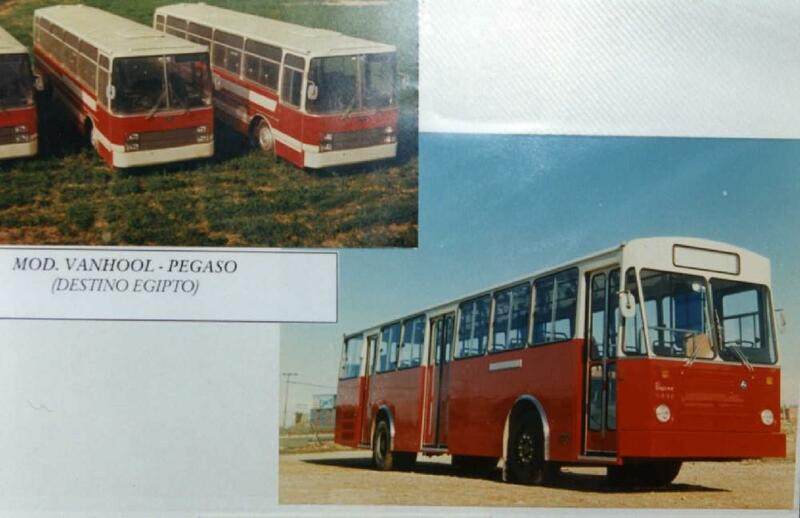 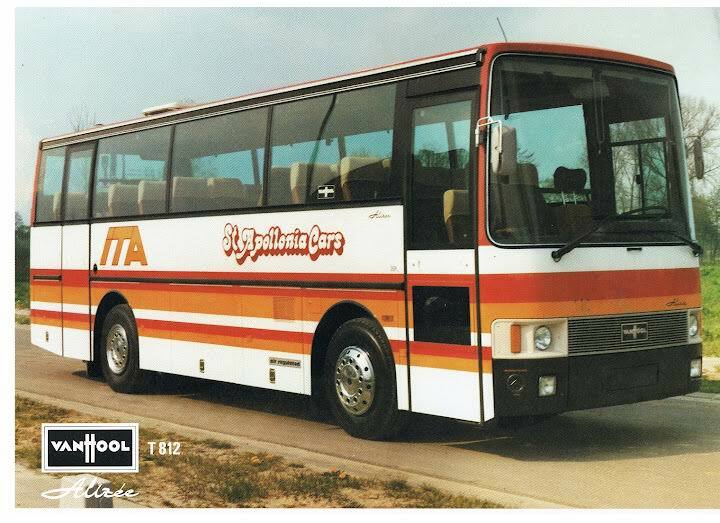 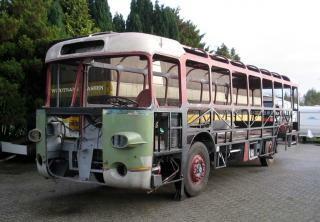 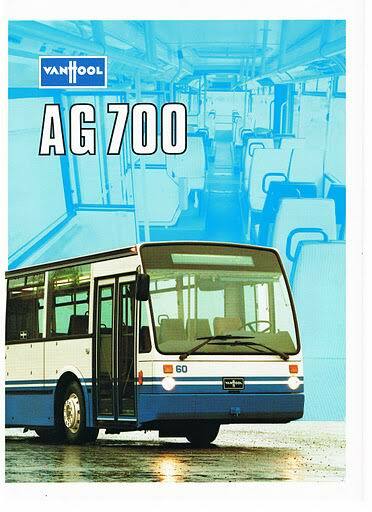 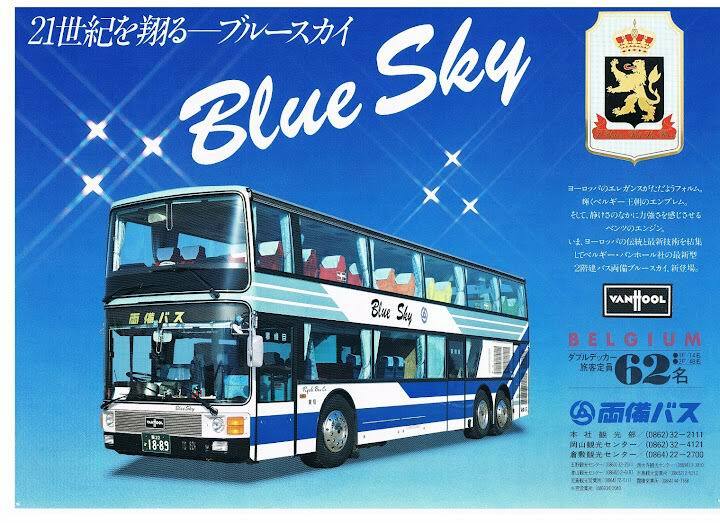 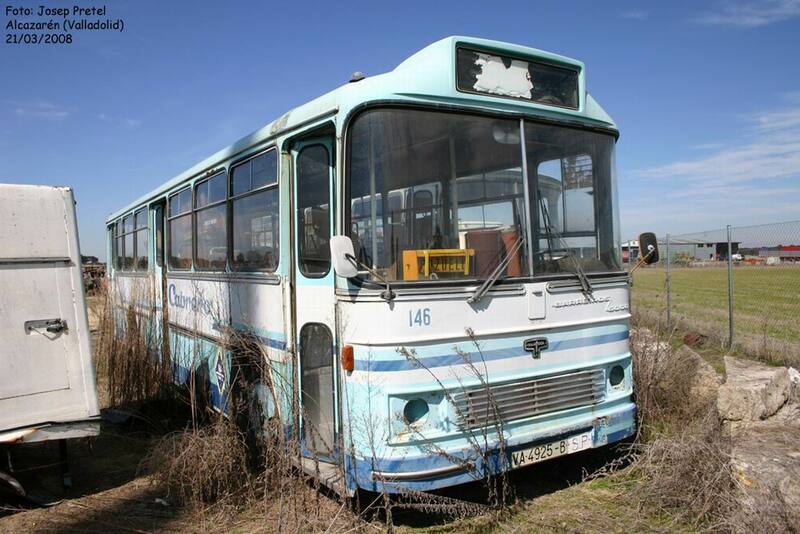 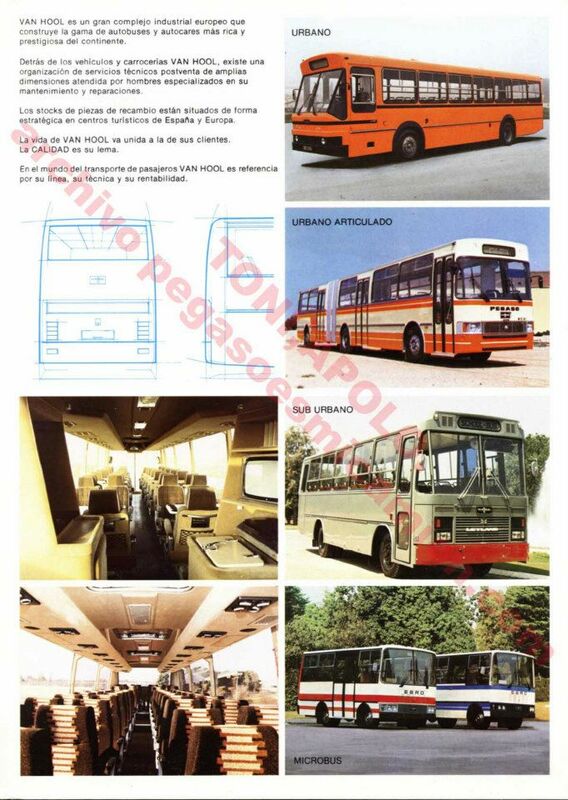 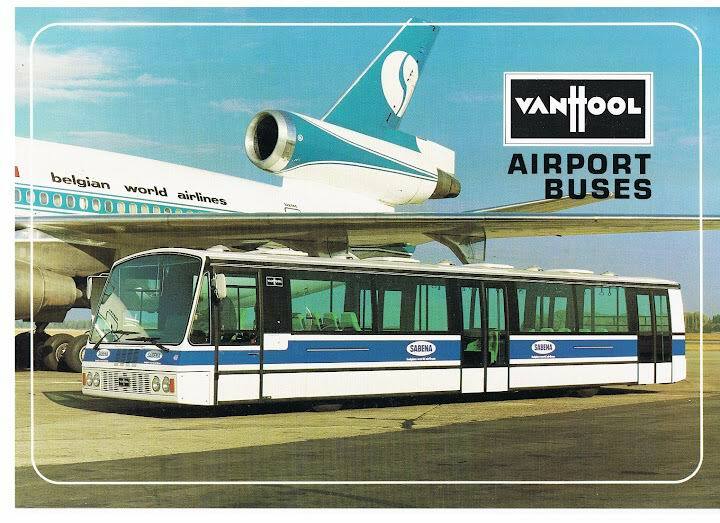 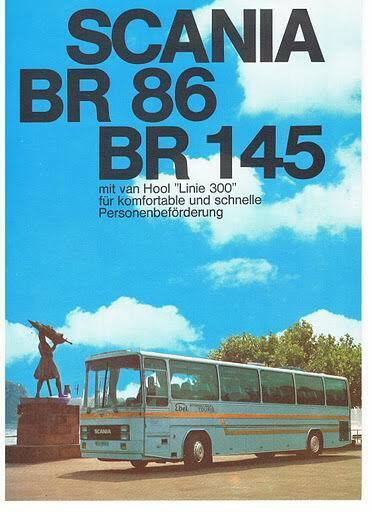 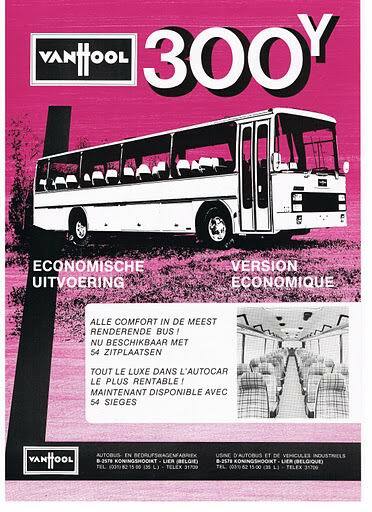 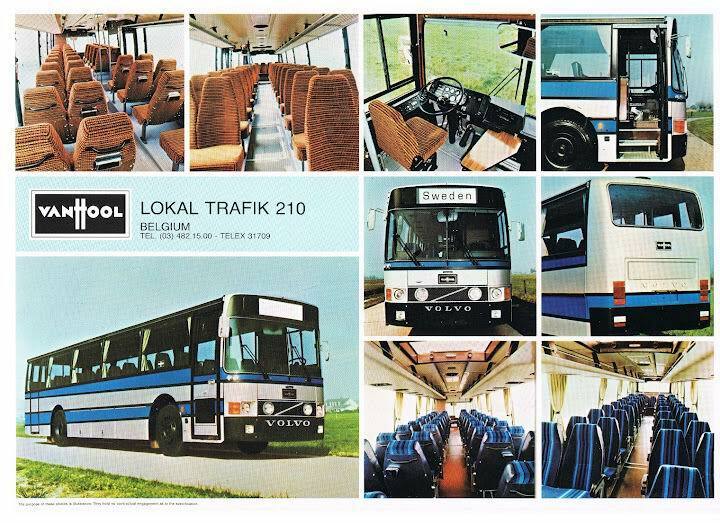 The A300L was a supplement order to their already existing but rehabbing Designline buses. 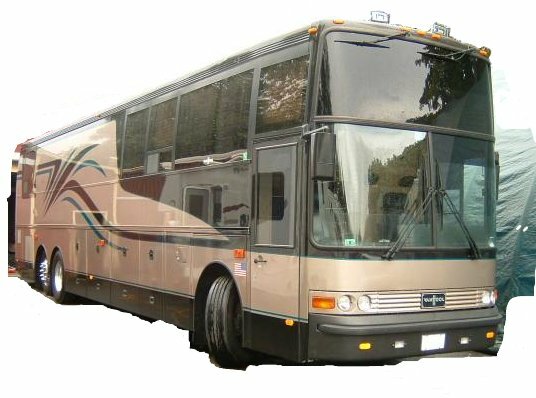 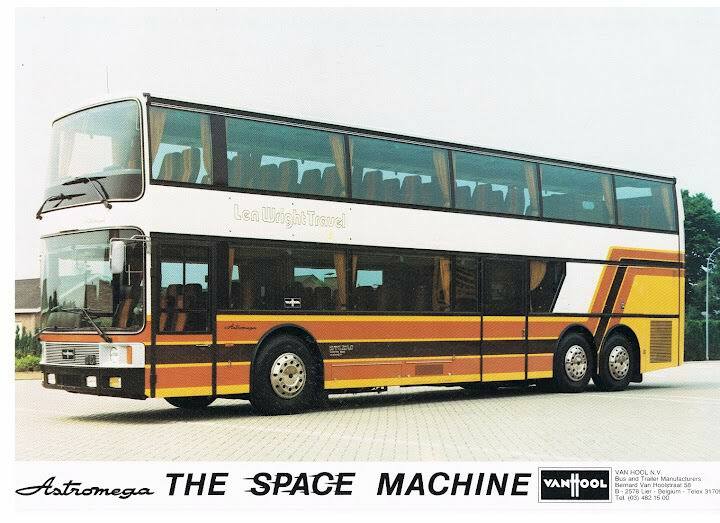 The TD925 Astromega is a closed-top US-spec double decker motorcoach that is a variant of the TD925 Astromega coach available in Europe. 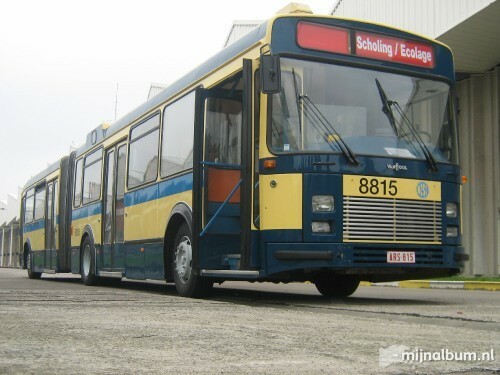 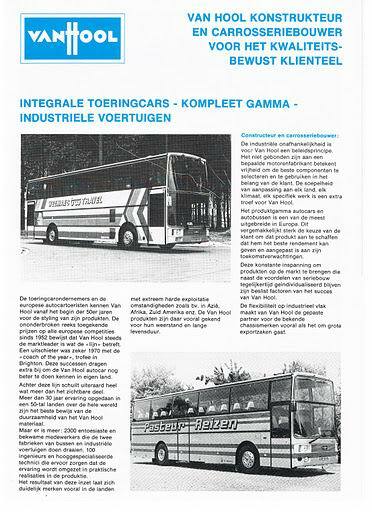 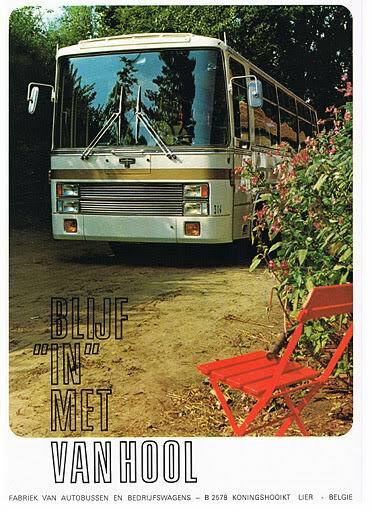 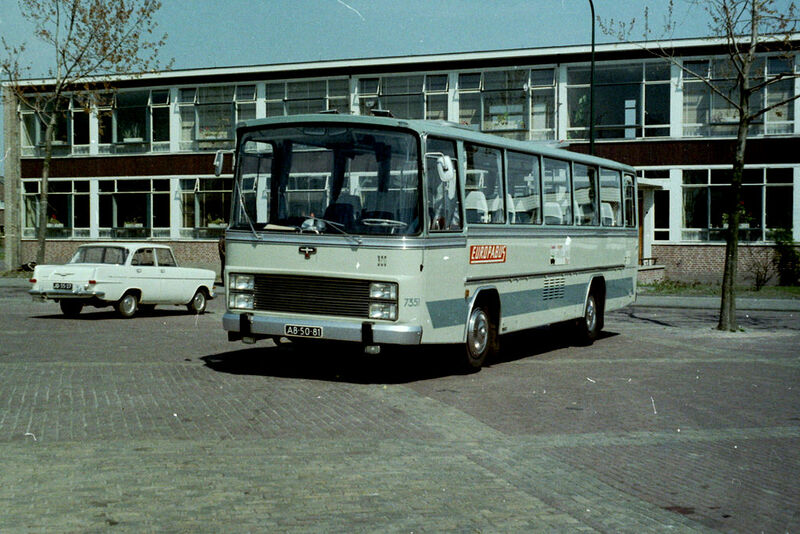 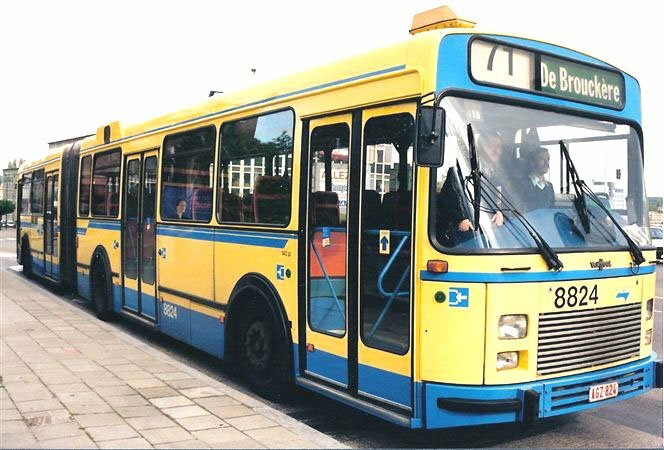 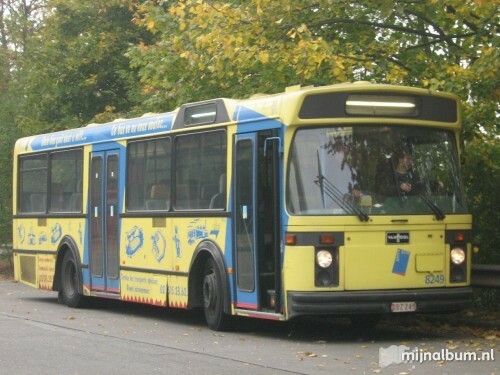 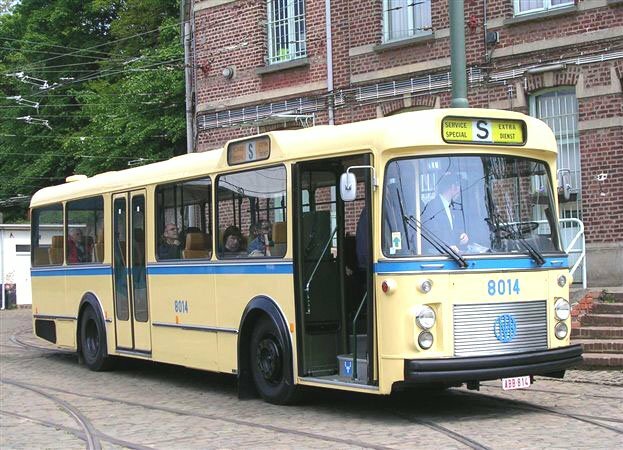 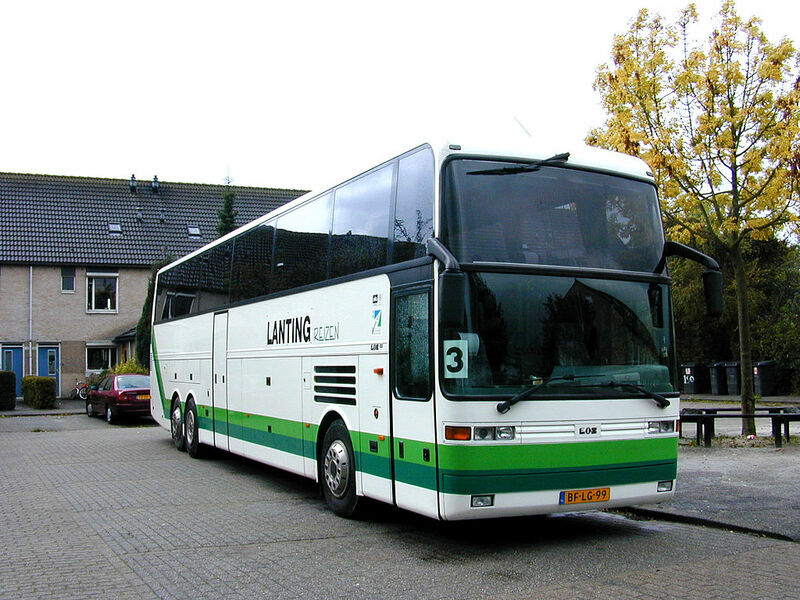 DAF/Van Hool-bus van de TET in de jaren zeventig. 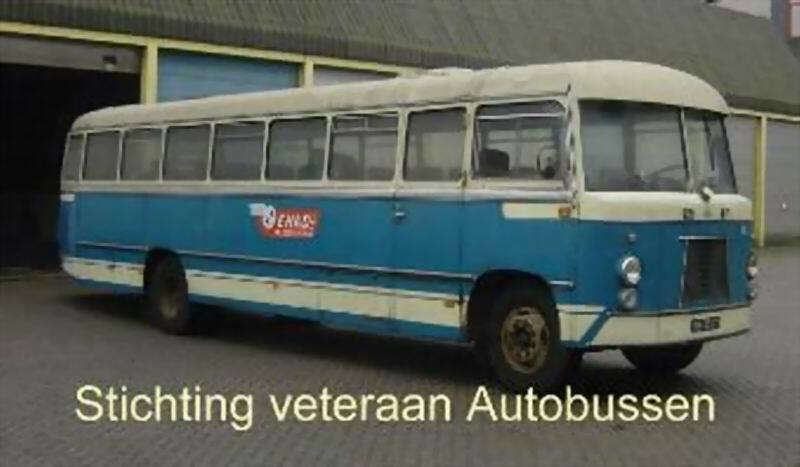 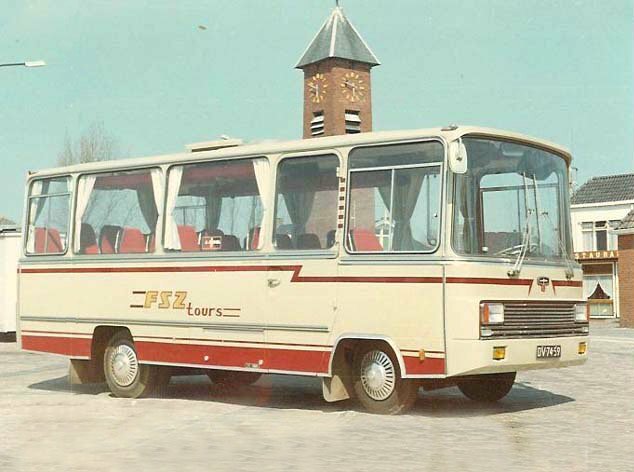 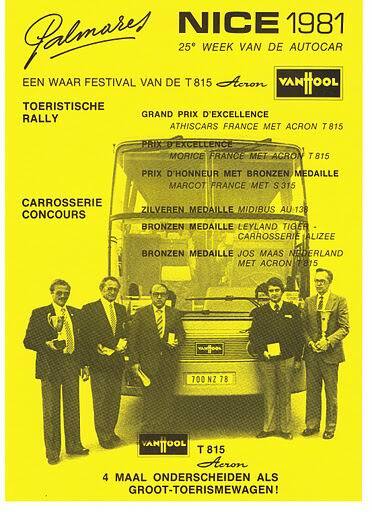 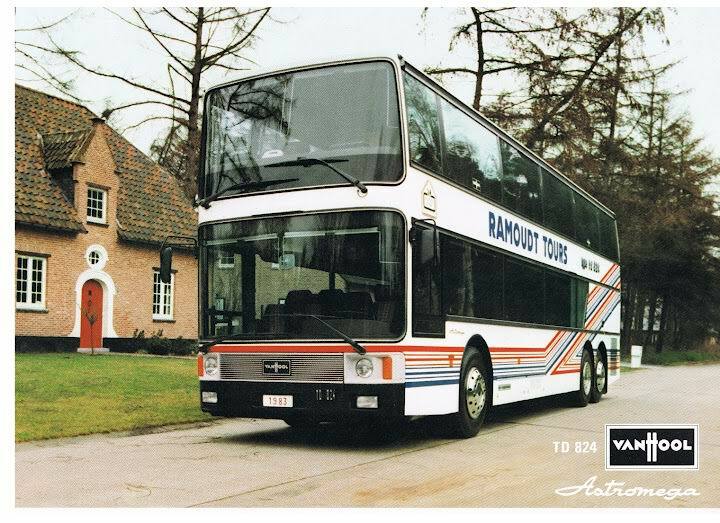 Van Hool-FIAT 320R-touringcar van de NBM. 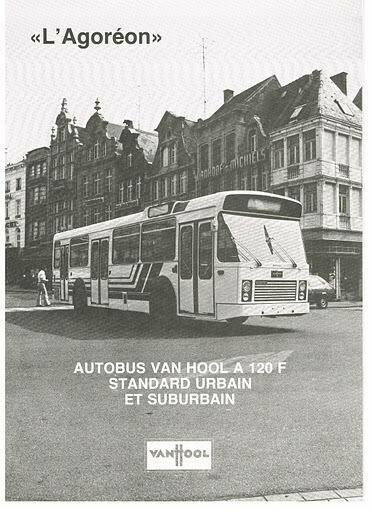 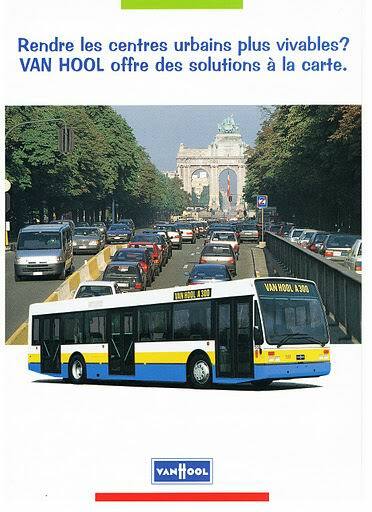 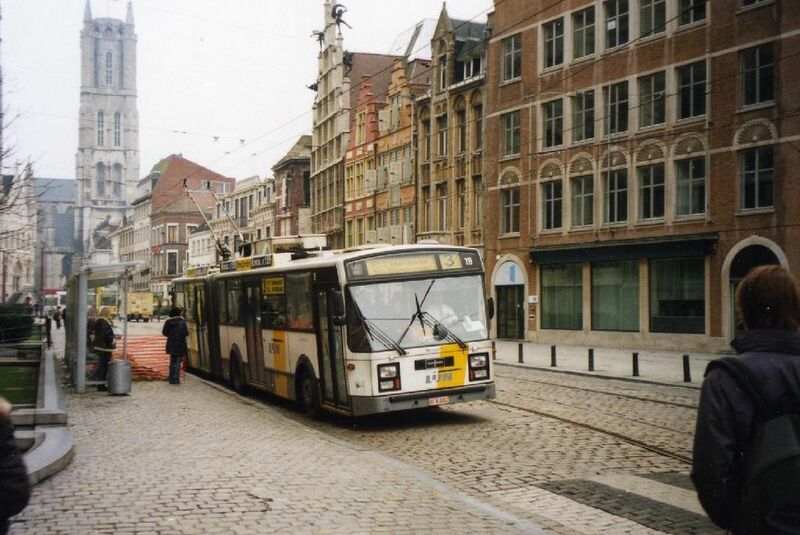 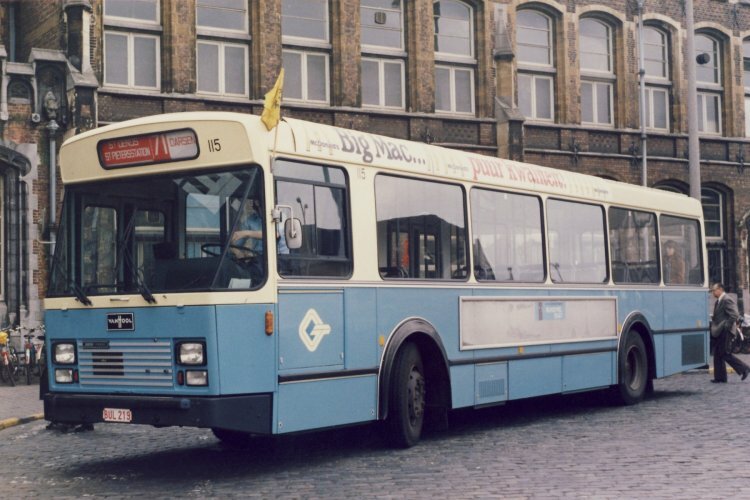 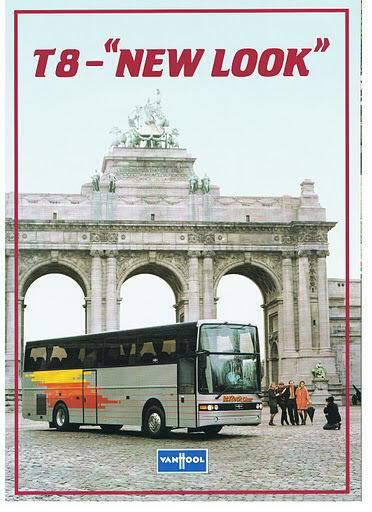 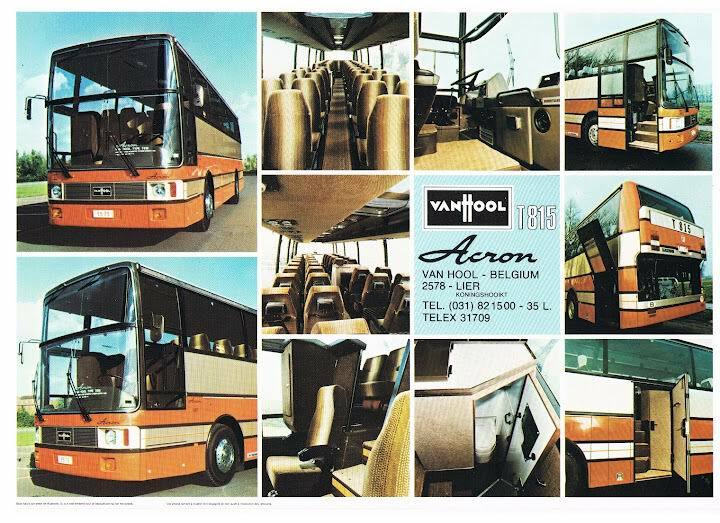 Van Hool-bus van de NMVB in Brussel in de jaren tachtig. 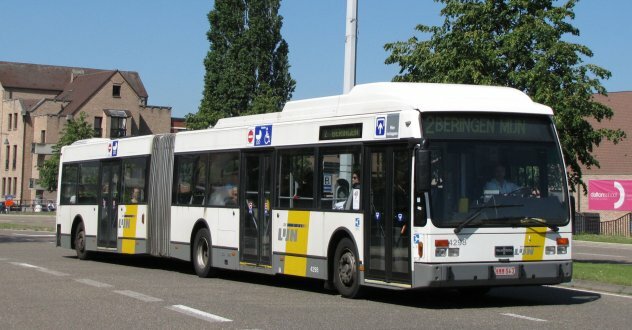 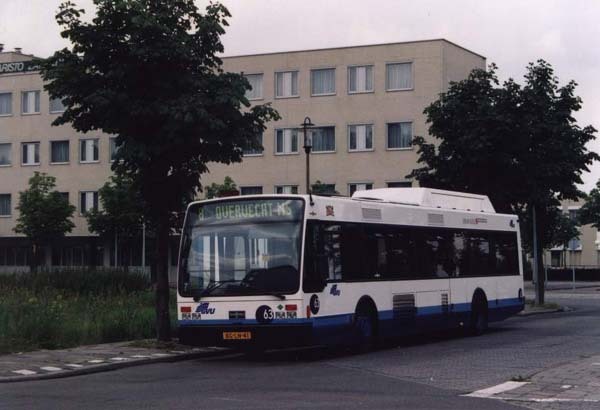 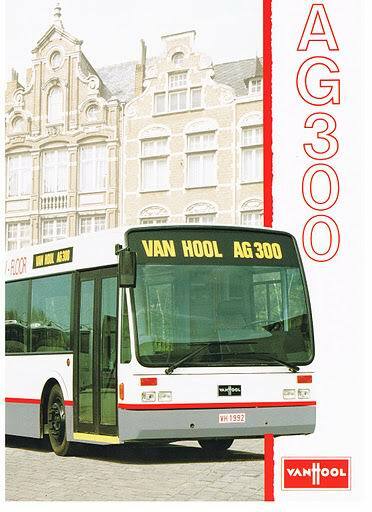 Van Hool AGG300 van voormalig GVU Utrecht. 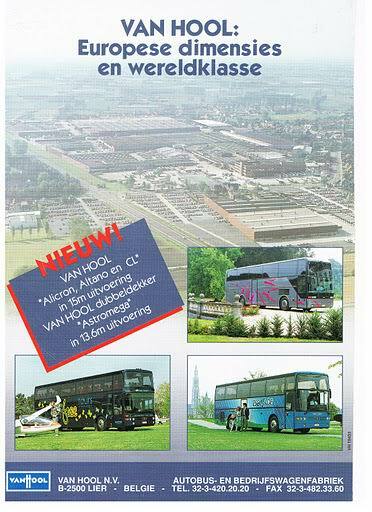 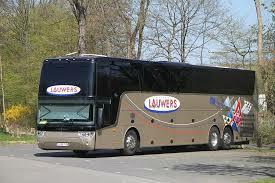 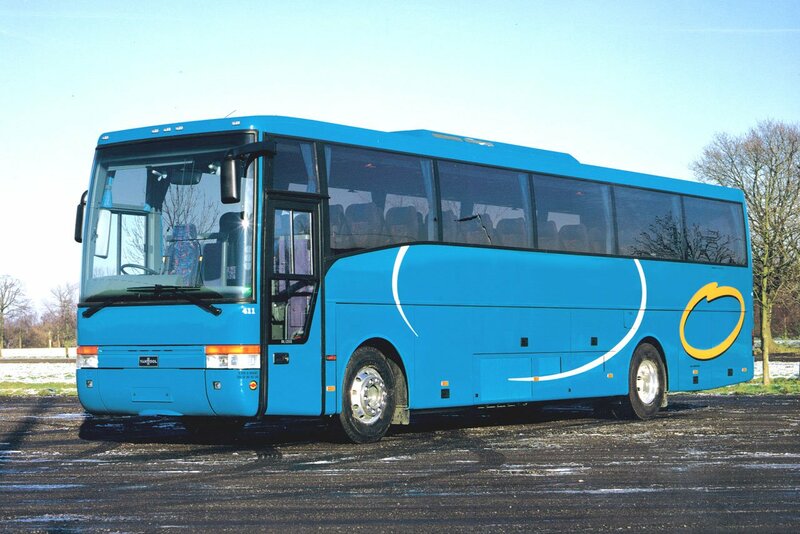 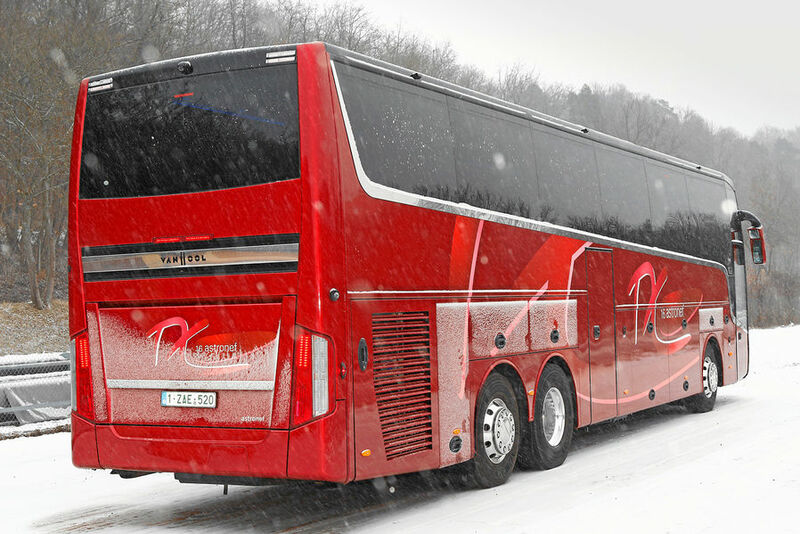 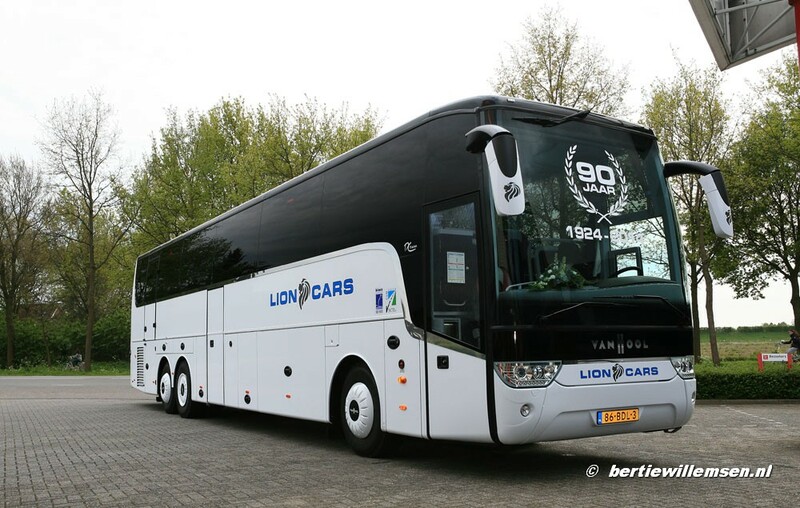 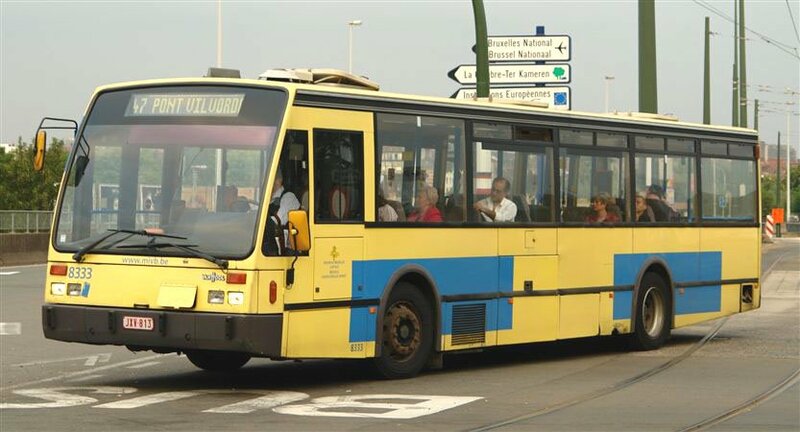 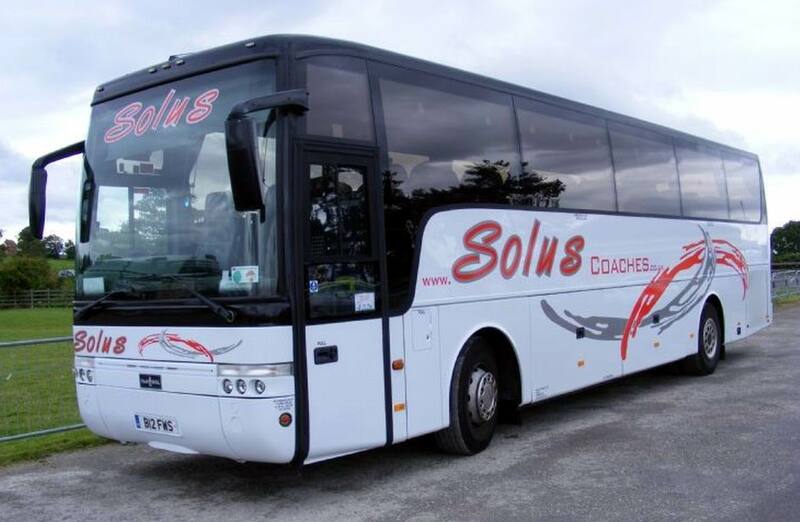 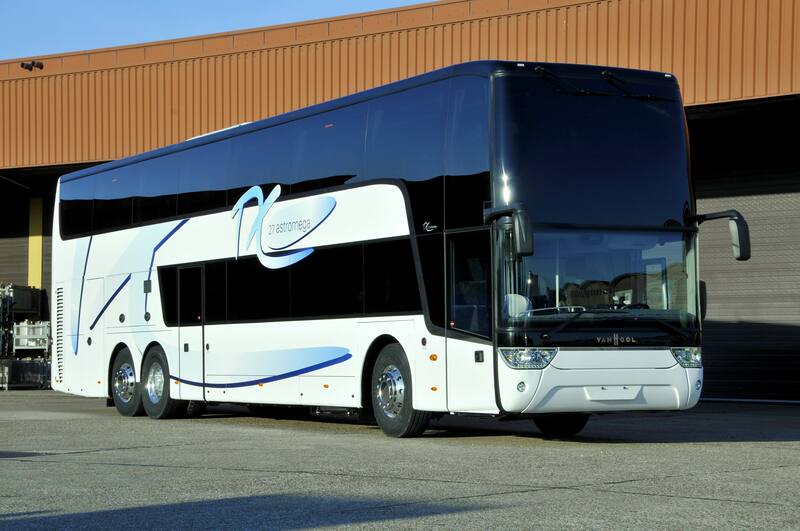 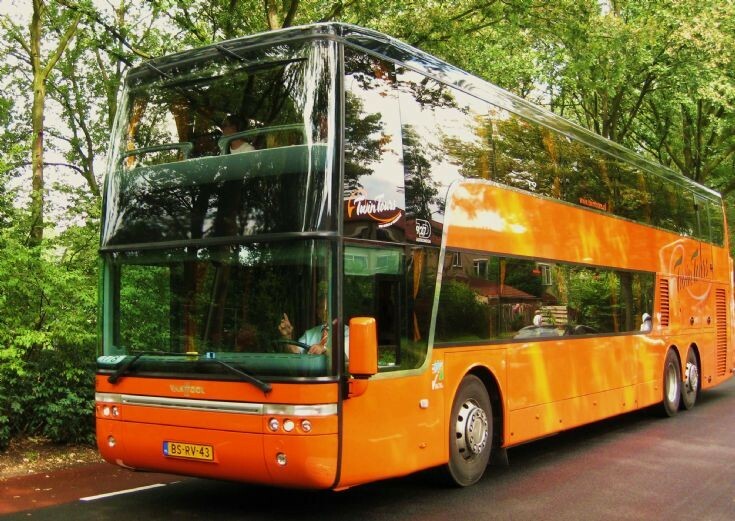 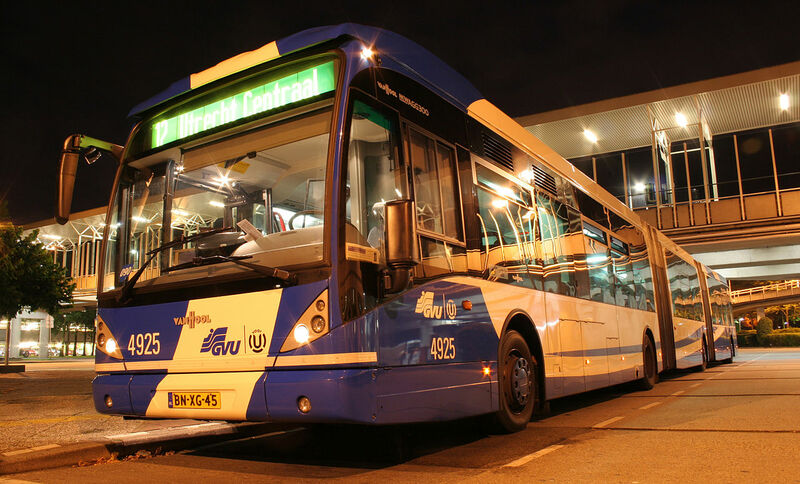 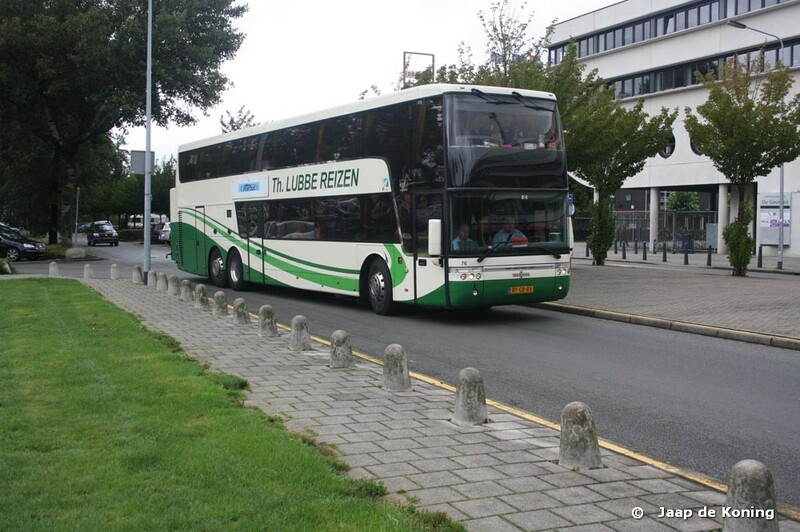 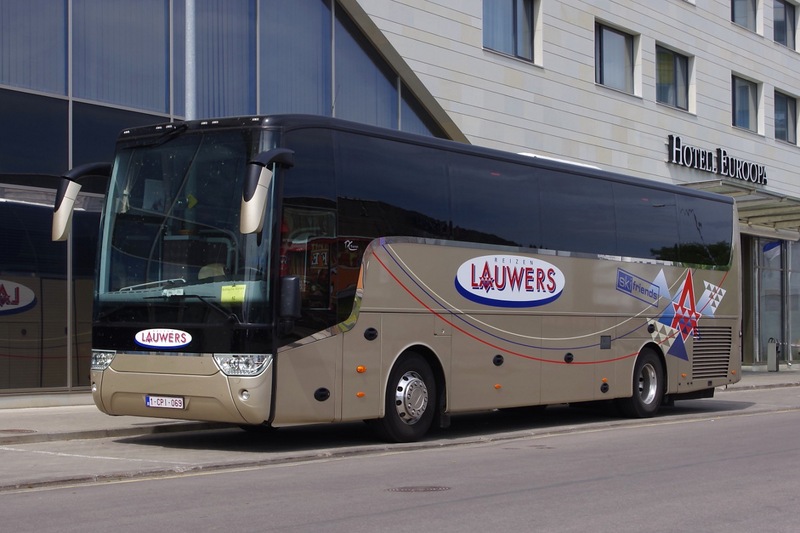 Van Hool A330FC waterstofbus in Connexxion-uitvoering. 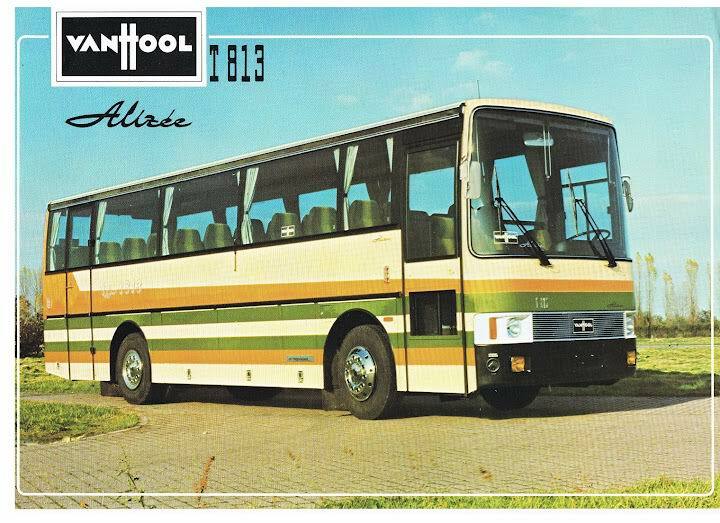 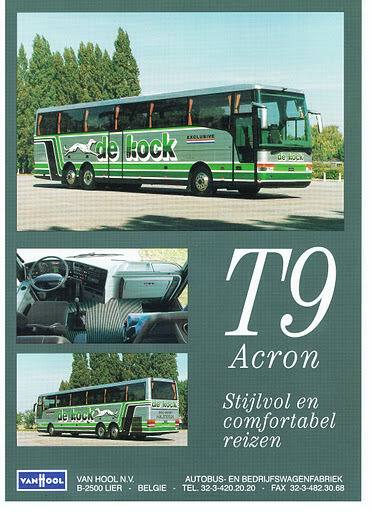 Een Van Hool T915 Alicron van Beuk.